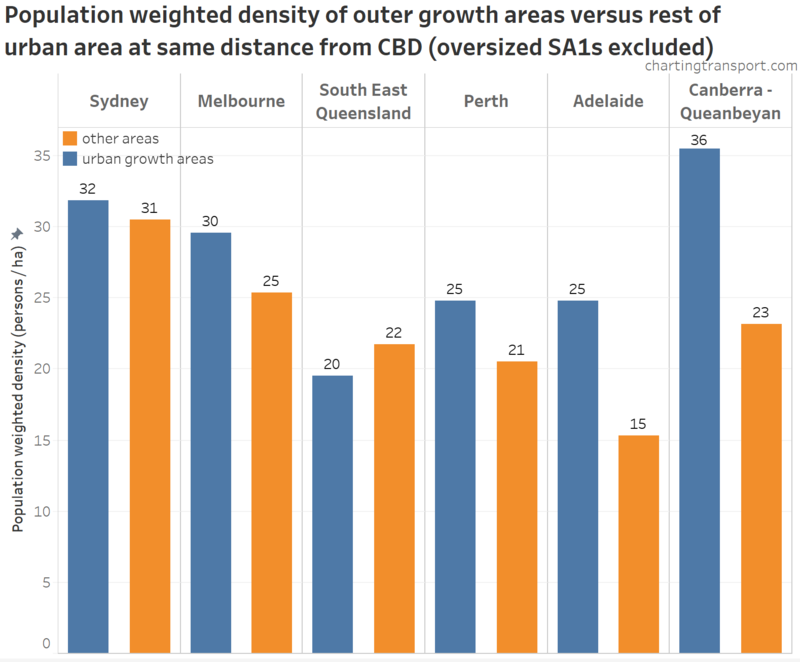 While Australian cities are growing outwards, densities are also increasing in established areas, and newer outer growth areas are some times at higher than traditional suburban densities. 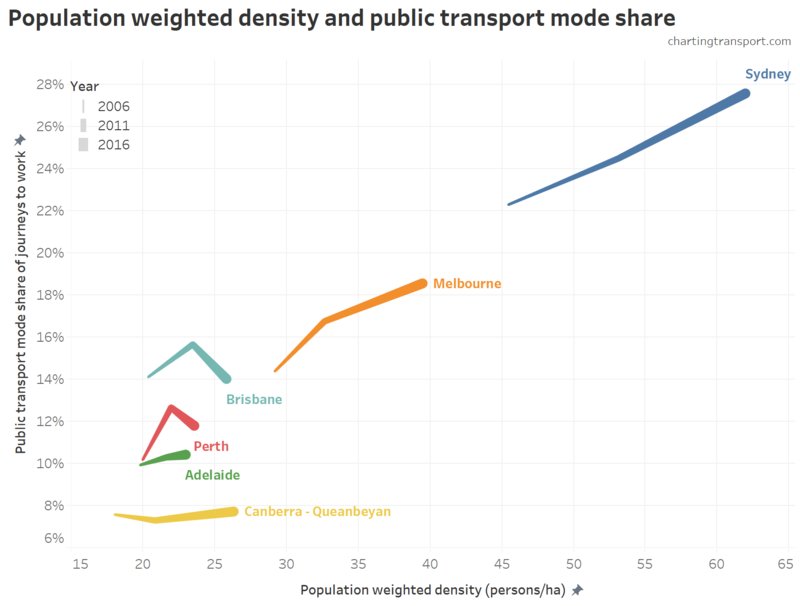 So what’s the net effect – are Australian cities getting more or less dense? How has this changed over time? Has density bottomed out? And how many people have been living at different densities? 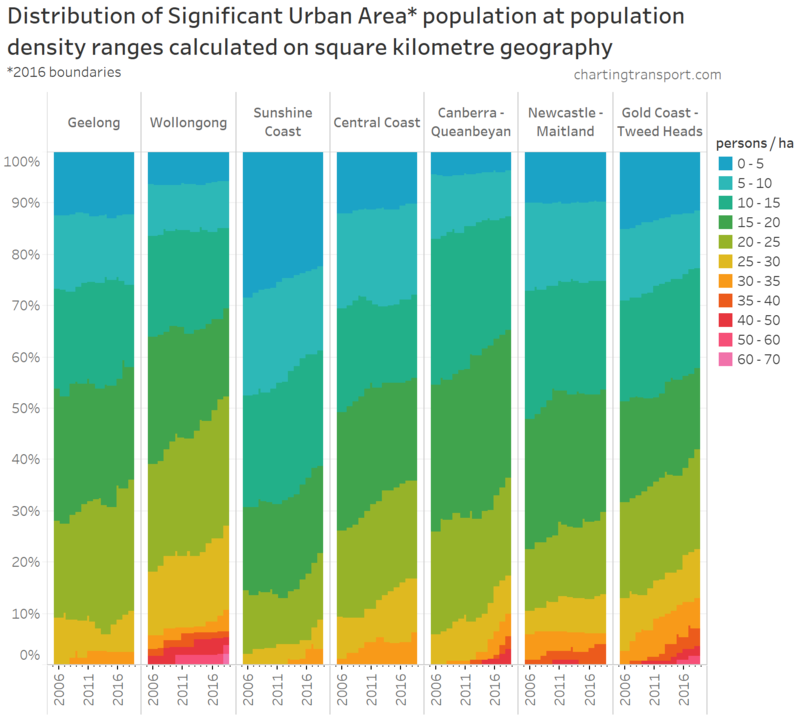 This post maps and measures population density over time in Australian cities. I’ve taken the calculations back as far as I can with available data (1981), used the highest resolution population data available. I’ll discuss some of the challenges of measuring density using different statistical geographies along the way, but I don’t expect everyone will want to read through to the end of this post! Under traditional measures of density, you’d simply divide the population of a city by the area of the metropolitan region. At the time of writing Wikipedia said Greater Sydney’s density was just 4.23 people per hectare (based on its Greater Capital City Statistical Area). To help visualise that, a soccer pitch is about 0.7 hectares. So Wikipedia is saying the average density of Sydney is roughly about 3 people per soccer field. You don’t need to have visited Sydney to know that is complete nonsense (don’t get me wrong, I love Wikipedia, but it really need to use a better measure for city density!). 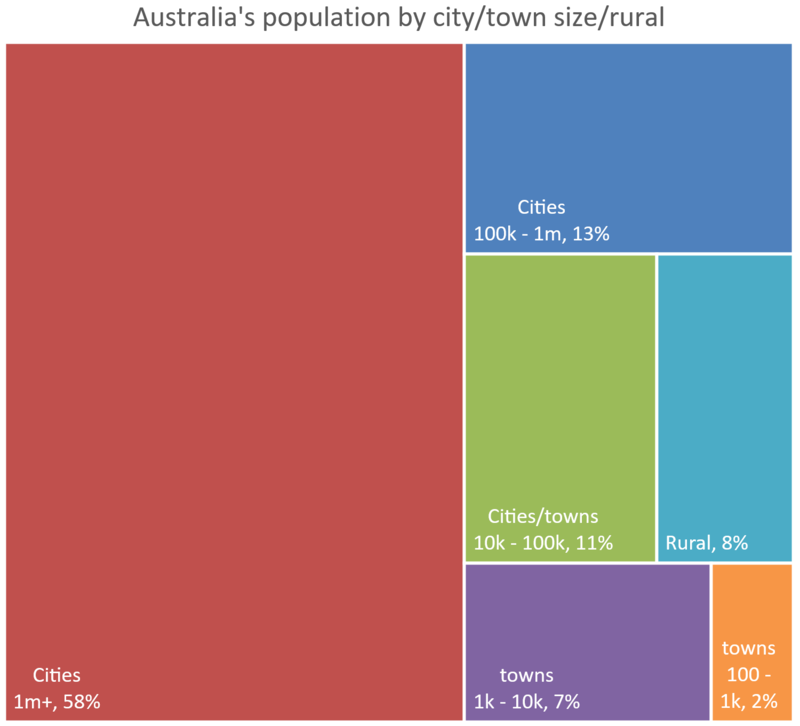 The major problem with metropolitan boundaries – in Australia we use now Greater Capital City Statistical Areas – is that they include vast amounts of rural land and national parks. In fact, in 2016, at least 53% of Greater Sydney’s land area had zero population. 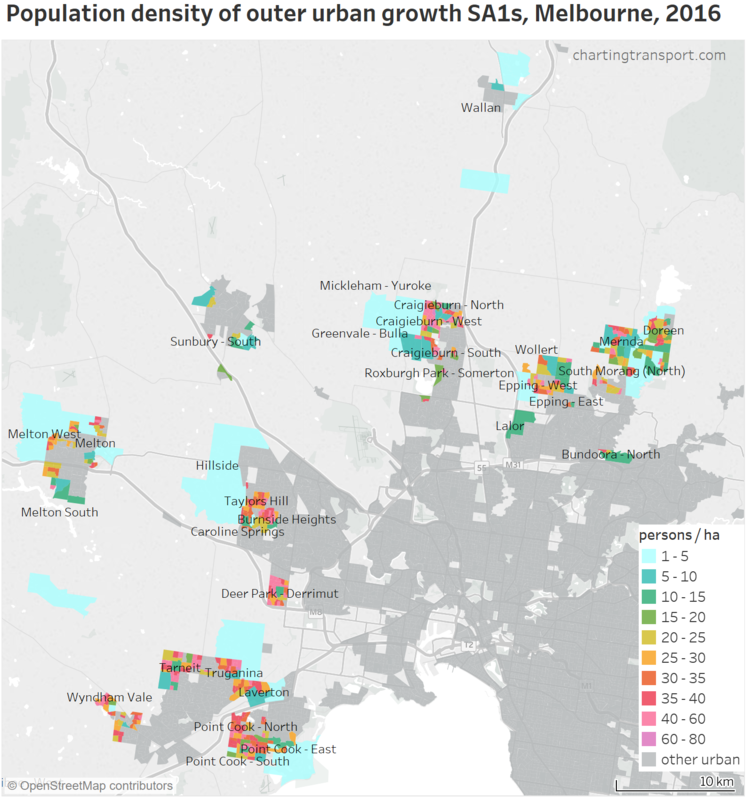 That statistic is 24% in Melbourne and 14% in Adelaide – so there is also no consistency between cities. One solution to this issue is to try to draw a tighter boundary around the urban area, and in this post I’ll also use Significant Urban Areas (SUAs) that do a slightly better job (they are made up of SA2s). The red boundaries on the above map show SUAs in the Sydney region. 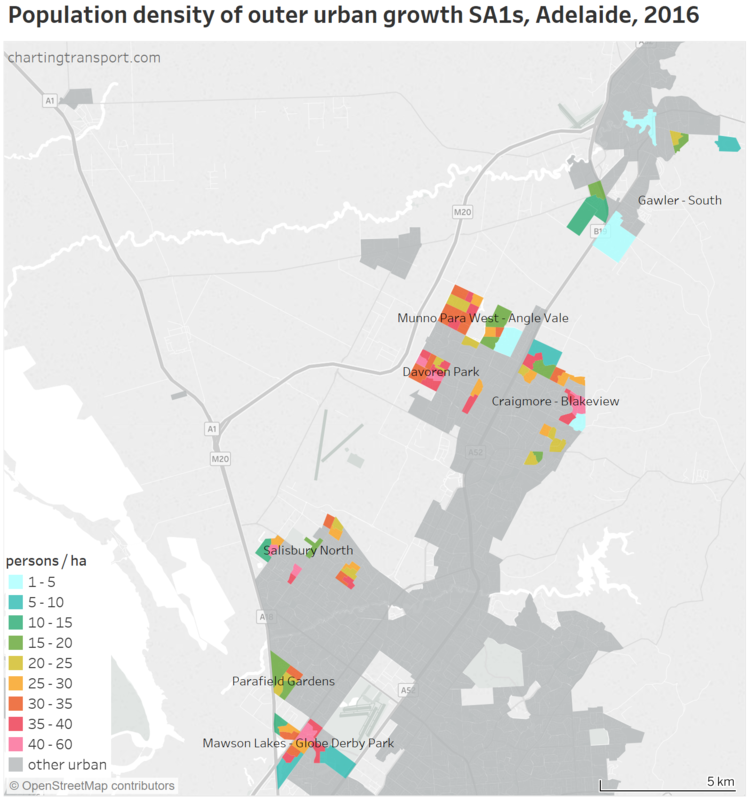 However SUAs they still include large parks, reserves, industrial areas, airports, and large-area partially-populated SA2s on the urban fringe. Urban centres are slightly better (they are made of SA1s) but population data for these is only available in census years, the boundaries change with each census, the drawing of boundaries hasn’t been consistent over time, they include non-residential land, and they split off most satellite urban areas that are arguably still part of cities, even if not part of the main contiguous urban area. 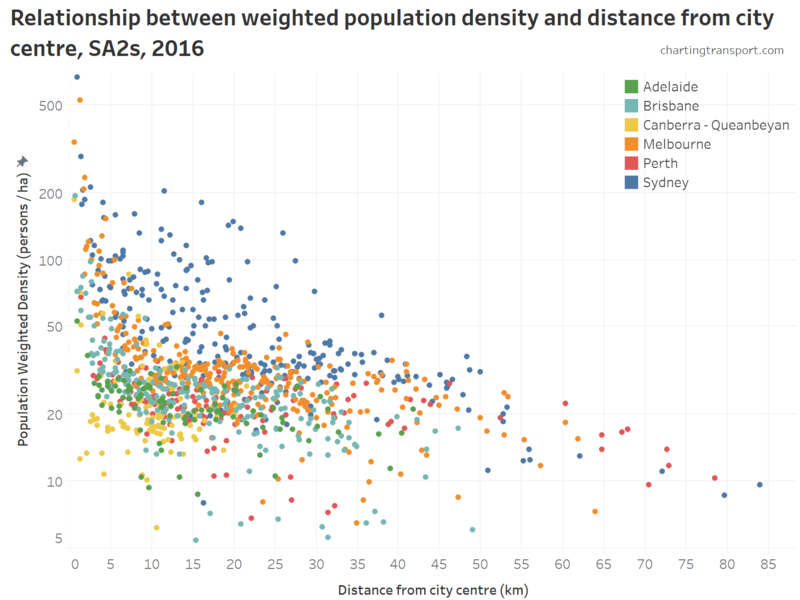 Enter population-weighted density (PWD) which I’ve looked at previously (see Comparing the densities of Australian, European, Canadian, and New Zealand cities). Population-weighted density takes a weighted average of the density of all parcels of land that make up a city, with each parcel weighted by its population. One way to think about it is the average density of the population, rather than the average density of the land. So parcels of land with no population don’t count at all, and large rural parcels of land that might be inside the “metropolitan area” count very little in the weighted average because of their relatively small population. This means population-weighted density goes a long way to overcoming having to worry about the boundaries of the “urban area” of a city. Indeed, previously I have found that removing low density parcels of land had very little impact on calculations of PWD for Australian cities (see: Comparing the residential densities of Australian cities (2011)). More on this towards the end of this post. Calculations of population-weighted density can also answer the question about whether the “average density” of a city has been increasing or decreasing. One of the pitfalls of measuring population weighted density is that it very much depends on the statistical geography you are using. If you use larger geographic zones you’ll get a lower value as most zones will include both populated and unpopulated areas. If you use very small statistical geography (eg mesh blocks) you’ll end up with a lot fewer zones that are partially populated – most will be well populated or completely unpopulated, and that means your populated weighted density value will be much higher, and your measure is more looking at the density of housing areas. 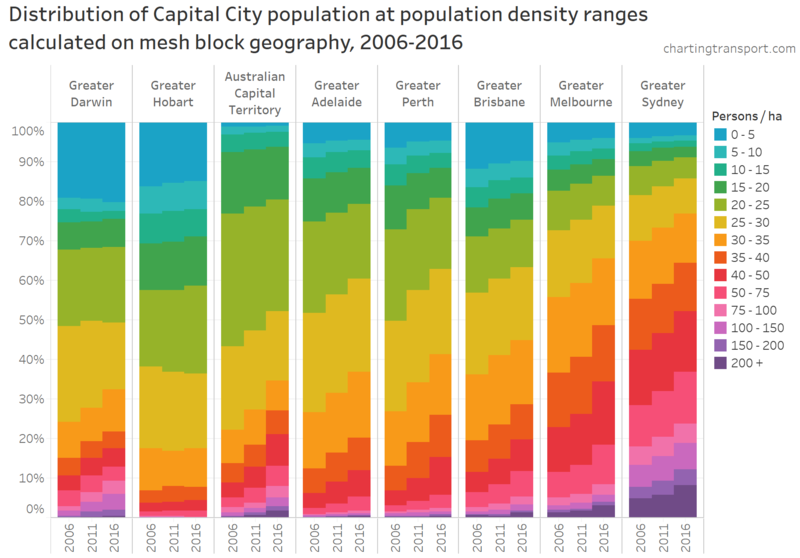 Only at the mesh block and SA1 geographies can you clearly see that several newer outer suburbs of Canberra have much higher residential densities. The density calculation otherwise gets washed out quickly with lower resolution statistical geography, to the point where SA3 geography is pretty much useless as so much non-urban land is included (also, there are only 7 SA3s in total). I’ll come back to this issue at the end of the post. Even if you have a preferred statistical geography for calculations, making international comparisons is very difficult because few countries will following the same guidelines for creating statistical geography. Near enough is not good enough. Worse still, statistical geography guidelines do not always result in consistently sized areas within a country (more on that later). Thankfully Europe and Australia have adopted a square kilometre grid geography for population estimates, which makes international PWD comparisons readily possible. Indeed I did one a few years ago looking at ~2011 data (see Comparing the densities of Australian, European, Canadian, and New Zealand cities). 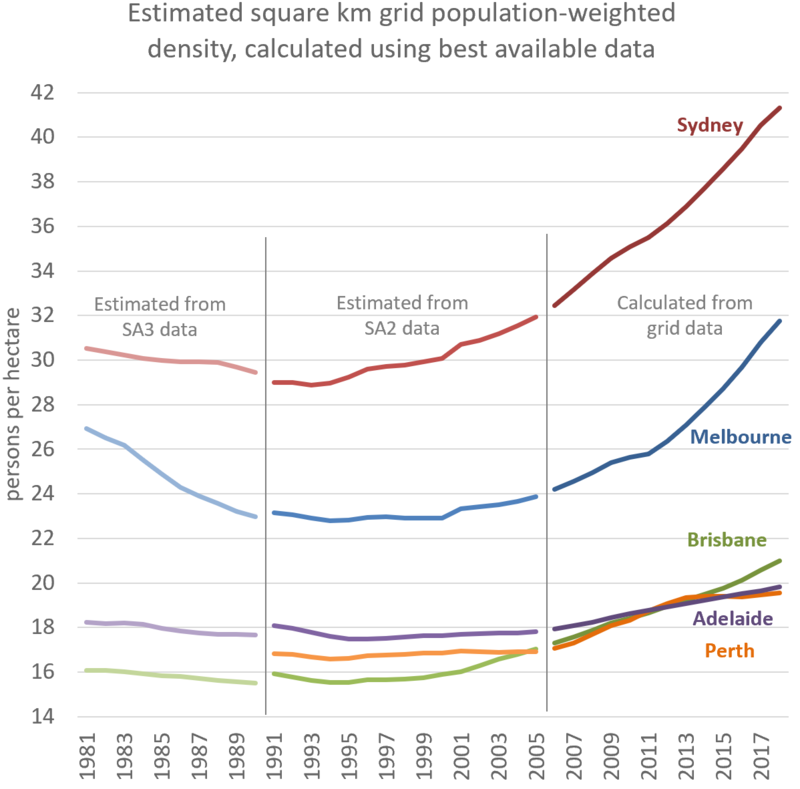 This ABS is now providing population estimates on a square km grid for every year from 2006. The changes over time are relatively subtle, but if you watch the animation several times you’ll see growth – including relatively high density areas emerging on the urban fringe. It’s a bit chunky, and it’s a bit of a matter of luck as to whether dense urban pockets fall entirely within a single grid square or on a boundary, but there is no intrinsic bias. There’s also an issue that many grid squares will contain a mix of populated and non-populated land, particularly on the urban fringe (and a similar issue on coastlines). In a large city these will be in the minority, but in smaller cities these squares could make up a larger share of the total, so I think we need to be careful about this measure in smaller cities. I’m going to arbitrarily draw the line at 200,000 residents. 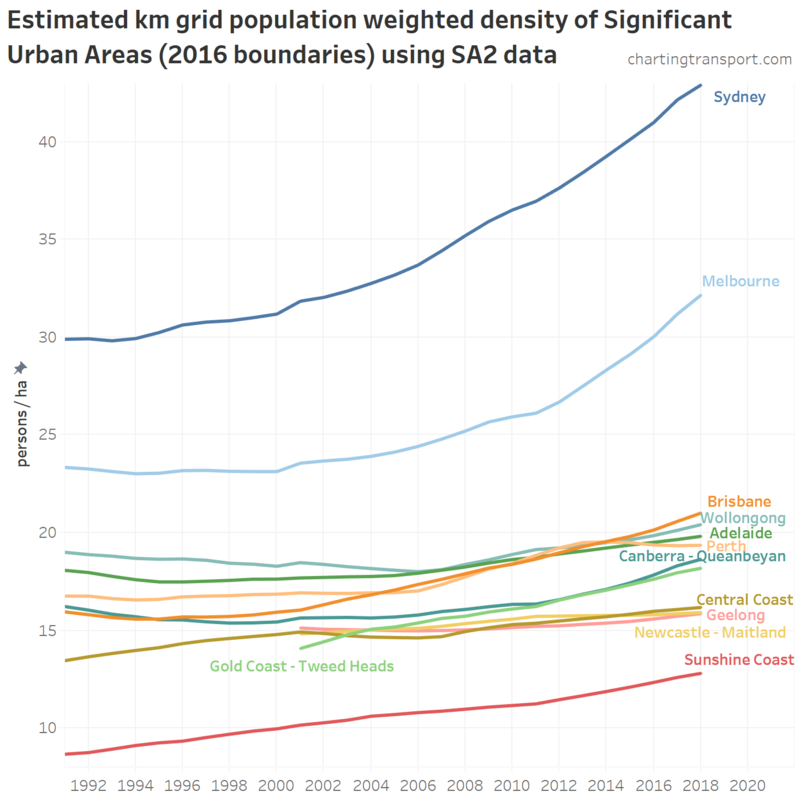 How are Australian cities trending for density using square km grid data 2006 to 2018? So now that we have an unbiased geography, we can measure PWD for cities over time. 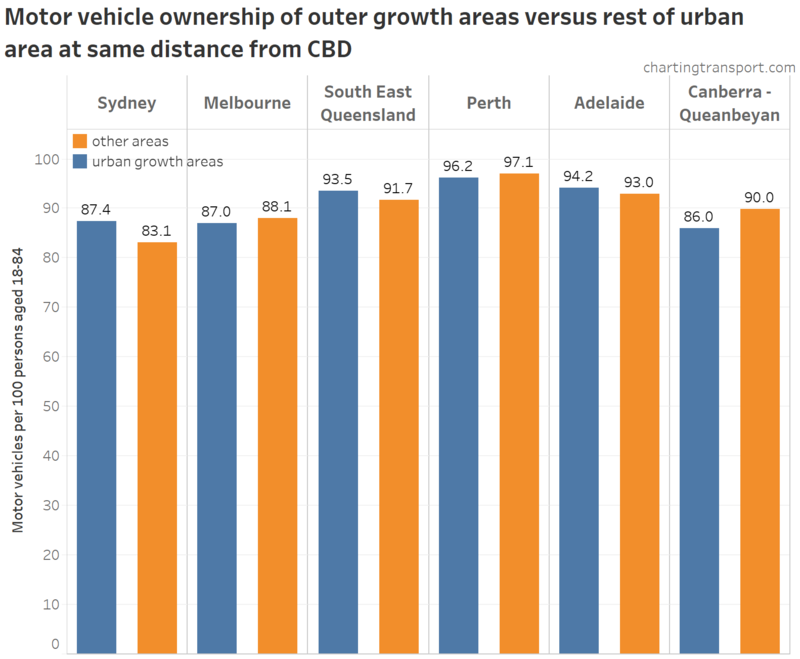 The following chart is based on 2016 Significant Urban Area boundaries (slightly smaller than Greater Capital City Statistical Areas but also they go across state borders as appropriate for Canberra – Queanbeyan and Gold Coast – Tweed). Technical notes: You cannot perfectly map km squares to Significant Urban Areas. I’ve included all kilometre grid squares which have a centroid within the 2016 Significant Urban Area boundaries (with a 0.01 degree tolerance added – which is roughly 1 km). Hobart appears only in 2018 because the Hobart SUA crosses the 200,000 population threshold in 2018. 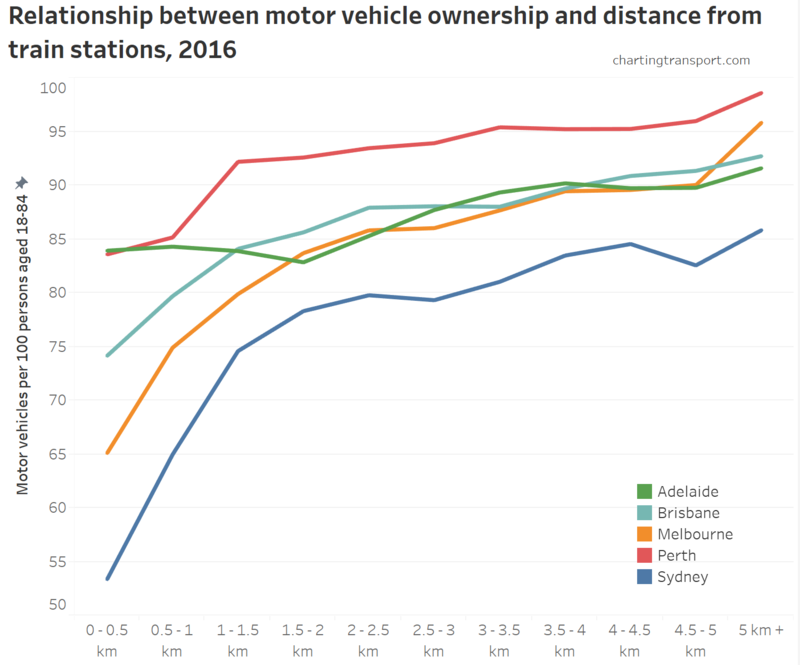 You can see most cities getting denser at various speeds, although Perth, Geelong, and Newcastle have each flat-lined for a few years. Perth’s population growth slowed at the end of the mining boom around 2013, and infill development all but dried up, so the overall PWD increased only 0.2 persons/ha between 2013 and 2018. 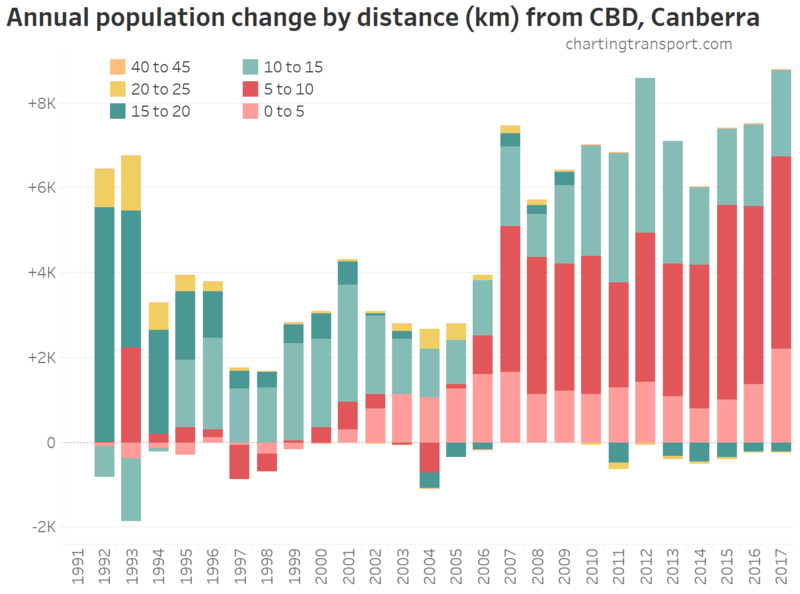 Canberra has seen a surge in recent years, probably due to high density greenfield developments we saw above. It looks very much like the Melbourne breakdown bleeds into the Sydney breakdown. 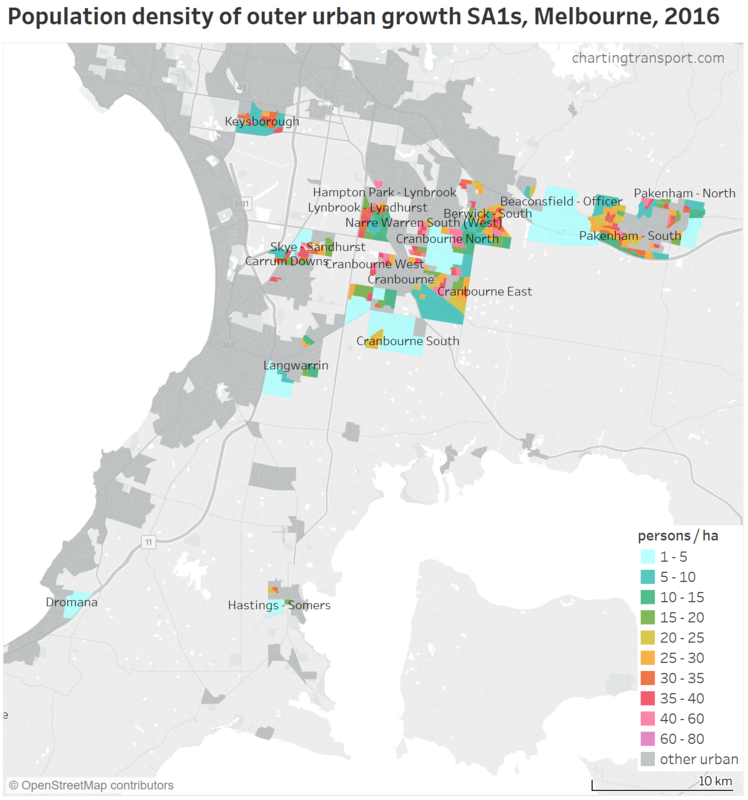 This roughly implies that Melbourne’s density distribution is on trend to look like Sydney’s 2006 distribution in around 2022 (accounting the for white space). 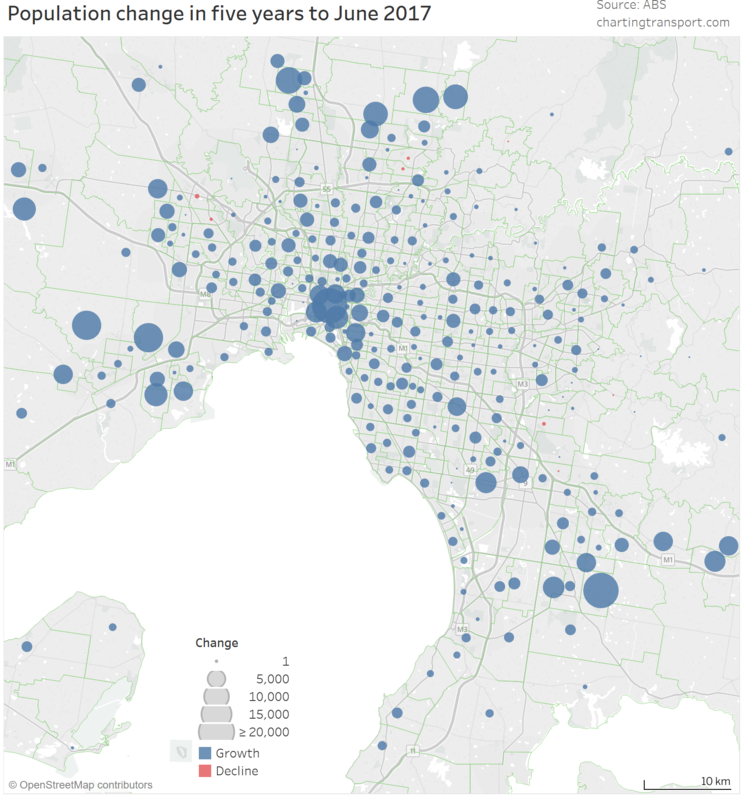 That is, Melbourne’s density distribution is around 16 years behind Sydney’s on recent trends. 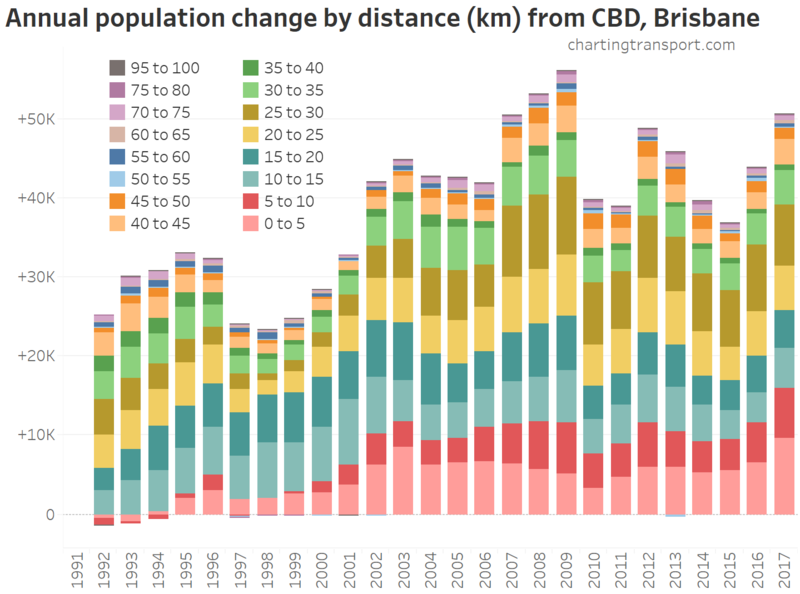 Similarly, Brisbane looks a bit more than 15 years behind Melbourne on higher densities. 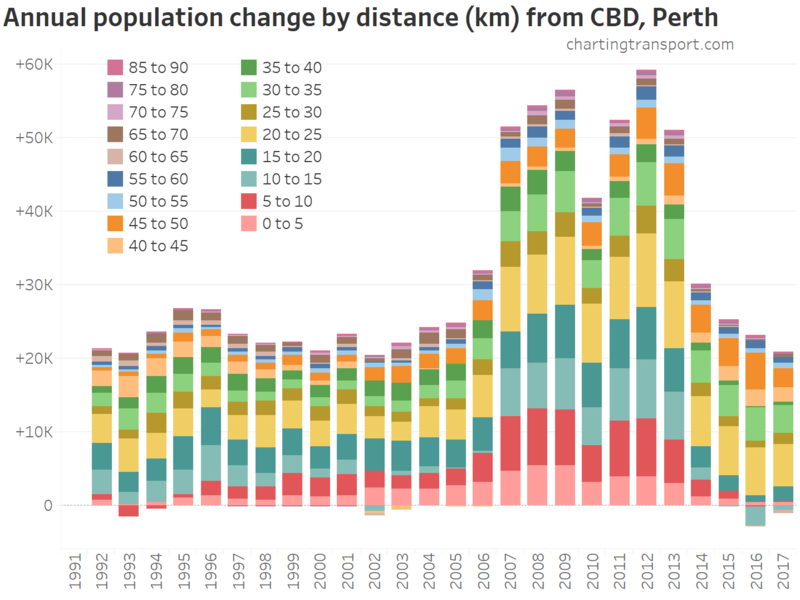 In Perth up until 2013 there was a big jump in the proportion of the population living at 35 persons / ha or higher, but then things peaked and the population living at higher densities declined, particularly as there was a net migration away from the inner and middle suburbs towards the outer suburbs. 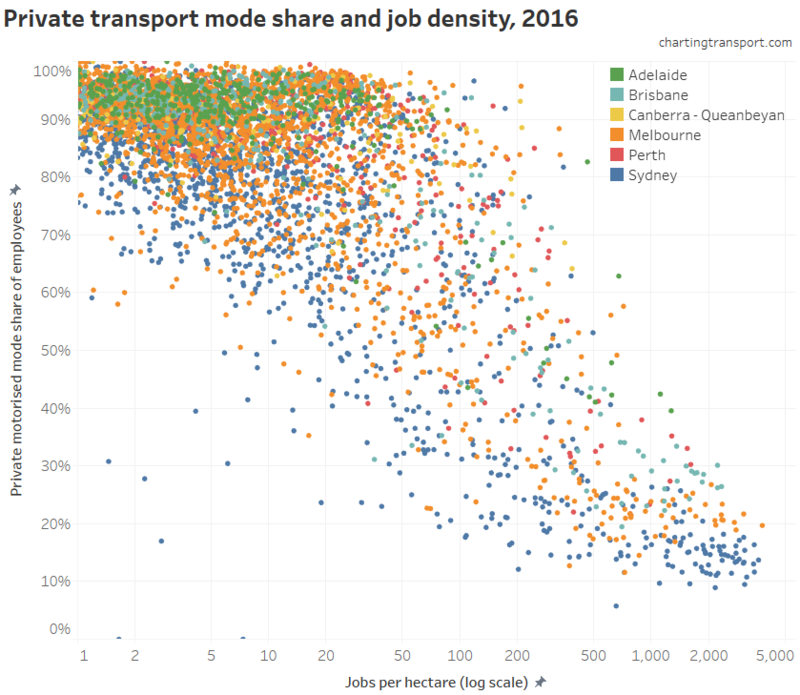 Of the smaller cities, densities higher than 35 persons/ha are only seen in Gold Coast, Newcastle, Wollongong and more recently in Canberra. 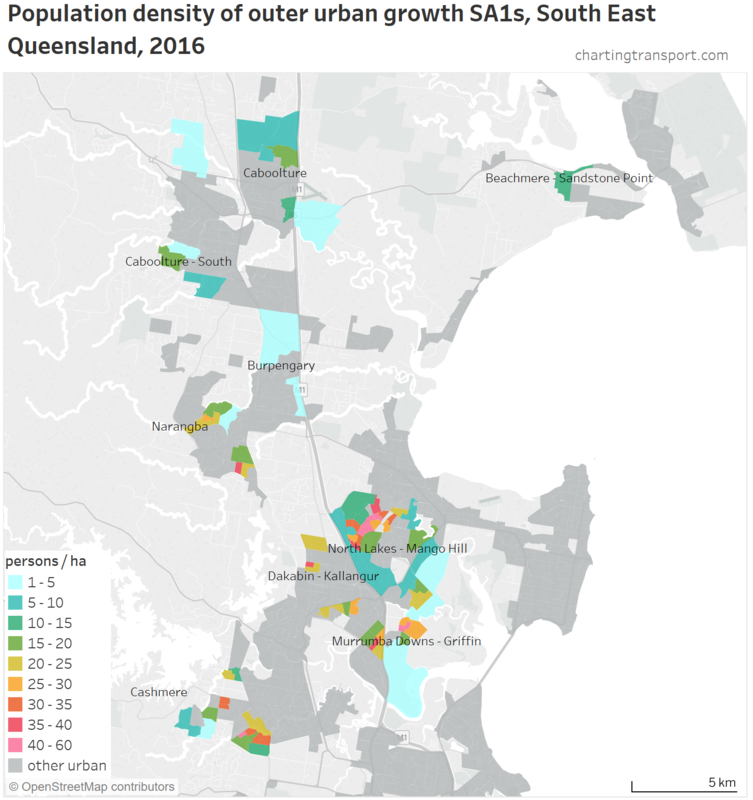 The large number of people living at low densities in the Sunshine Coast might reflect suburbs that contain a large number of holiday homes with no usual residents (I suspect the dwelling density would be relatively higher). This might also apply in the Gold Coast, Central Coast, Geelong (which actually includes much of the Bellarine Peninsula) and possibly other cities. 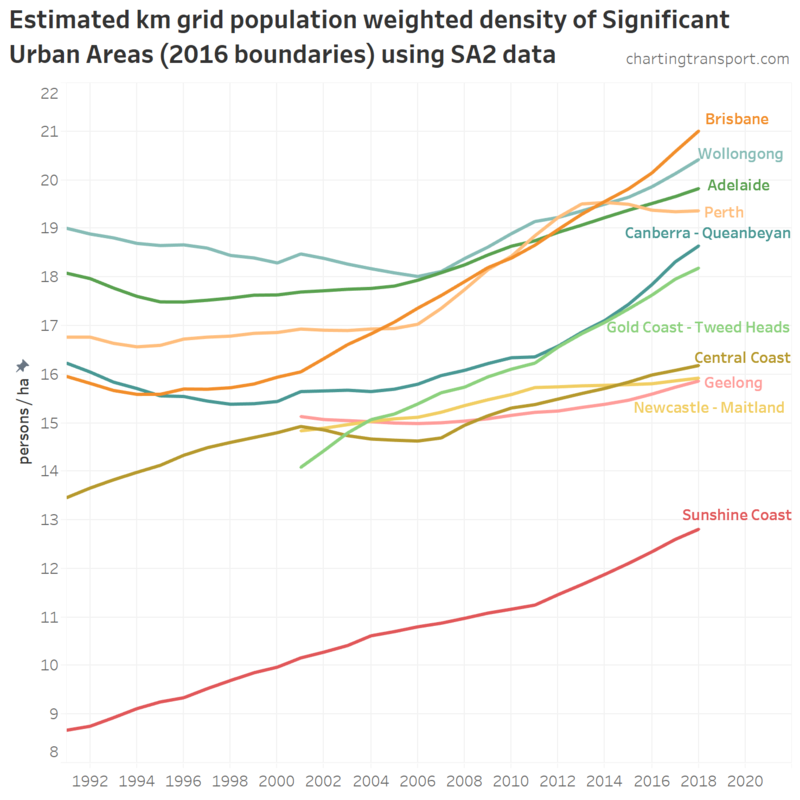 Also, the Central Coast and Sunshine Coast urban patterns are highly fragmented which means lots of part-urban grid squares, which will dilute the PWD of these “cities”. What are the density trends further back in time using census data? The census provides the highest resolution and therefore the closest measure of “residential” population weighted density. However, we’ve got some challenges around the statistical geography. Prior to 2006, the smallest geography at which census population data is available is the collector district (CD), which average around 500 to 600 residents. 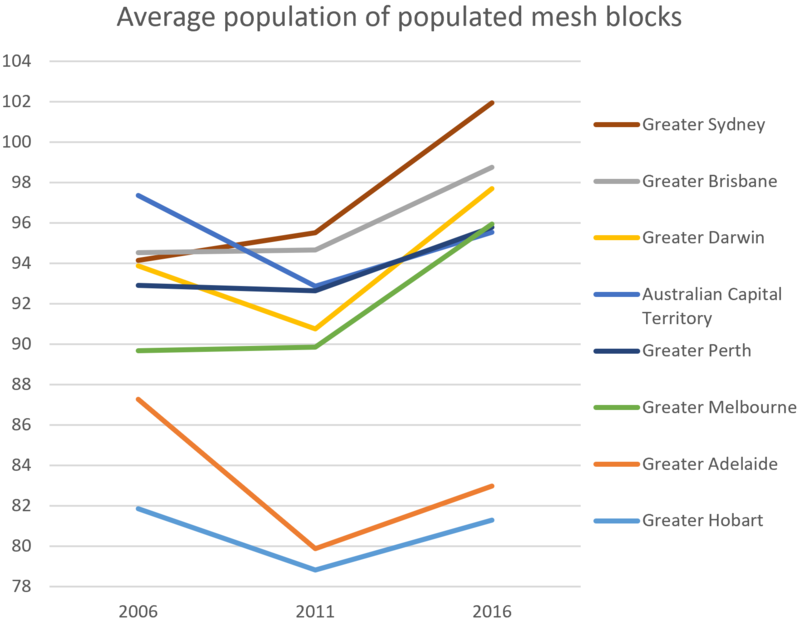 A smaller geography – the mesh block (MB) – was introduced in 2006 and averages around 90 residents. Technical note: I have mapped all CDs and MBs to Greater Capital City Statistical Area (GCCSA) boundaries, based on the entire CD fitting within the GCCSA boundaries (which have not yet changed since they were created in 2011). There is certainly some variance between cities and years, so we need to proceed with caution, particularly in comparing cities. Hobart and Adelaide have the smallest CDs and MBs on average, while Sydney generally has larger CDs and MBs. This might be a product of whether mesh blocks were made too small or large, or it might be that density is just higher and it is more difficult to draw smaller mesh blocks. The difference in median population may or may not be explained by the creation of part-residential mesh blocks. Also, we don’t have a long time series of data at the one geography level. Rather than provide two charts which break at 2006, I’ve calculated PWD for both CD and mesh block geography for 2006, and then estimated equivalent mesh block level PWD for earlier years by scaling them up by the ratio of 2006 PWD calculations. 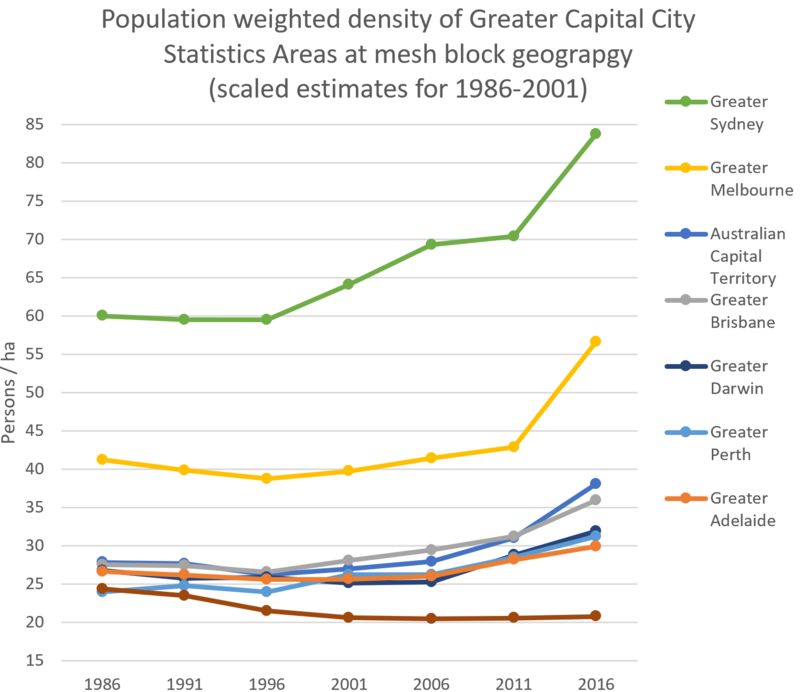 In Adelaide, the mesh block PWD for 2006 is 50% larger than the CD PWD, while in the Australian Capital Territory it is 110% larger, with other cities falling somewhere in between. Would these ratios hold for previous years? We cannot be sure. Collector Districts were effectively replaced with SA1s (with an average population of 500, only slightly smaller) and we can calculate the ratio of mesh block PWD to SA1 PWD for 2011 and 2016. For most cities the ratio in 2016 is within 10% of the ratio in 2011. So hopefully the ratio of CD PWD to mesh block PWD would remain fairly similar over time. As per the square km grid values, Sydney and Melbourne are well clear of the pack. Most cities had a PWD low point in 1996. That is, until around 1996 they were sprawling at low densities more than they were densifying in established areas, and then the balance changed post 1996. 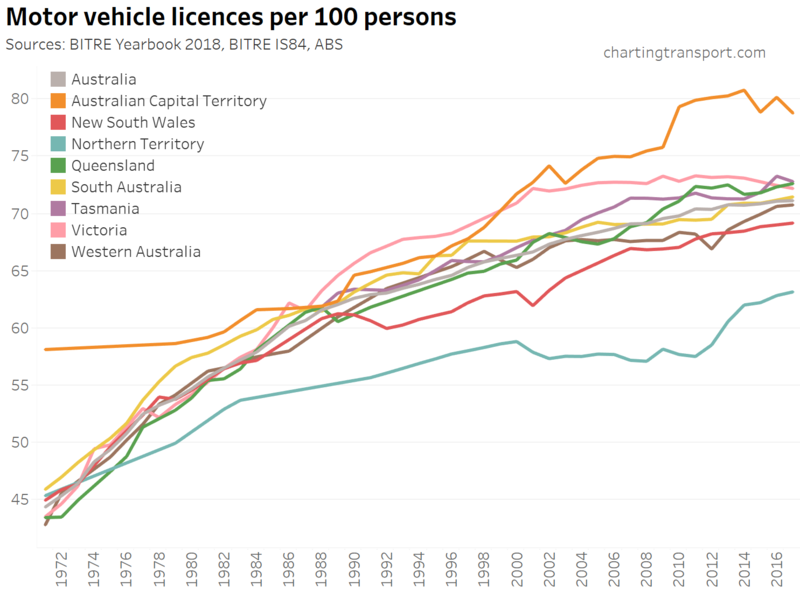 Exceptions are Darwin which bottomed out in 2001 and Hobart which bottomed in 2006. The data shows rapid densification in Melbourne and Sydney between 2011 and 2016, much more so than the square km grid data time series. 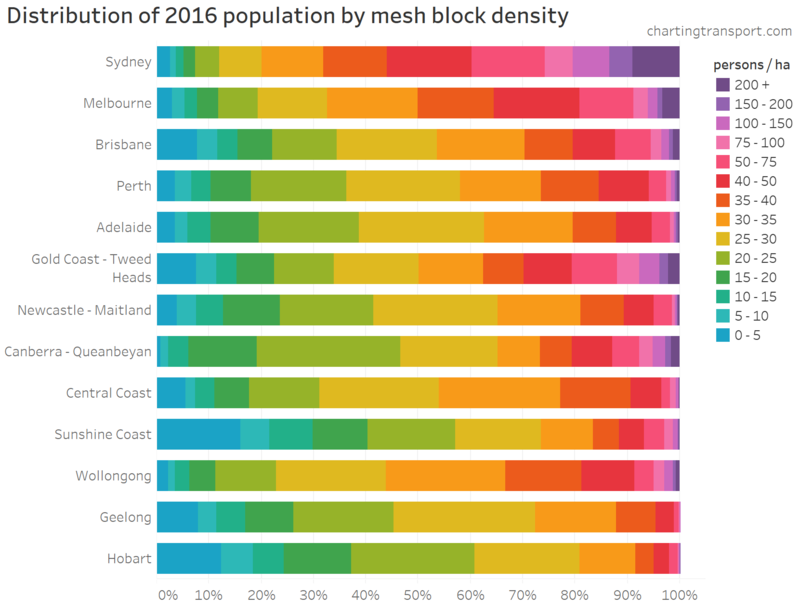 But we also saw a significant jump in the median size of mesh blocks in those cities between 2011 and 2016 (and if you dig deeper, the distribution of mesh block population sizes also shifted significantly), so the inflection in the curves in 2011 are at least partly a product of how new mesh block boundaries were cut in 2016, compared to 2011. Clearly statistical geography isn’t always good for time series and inter-city analysis! 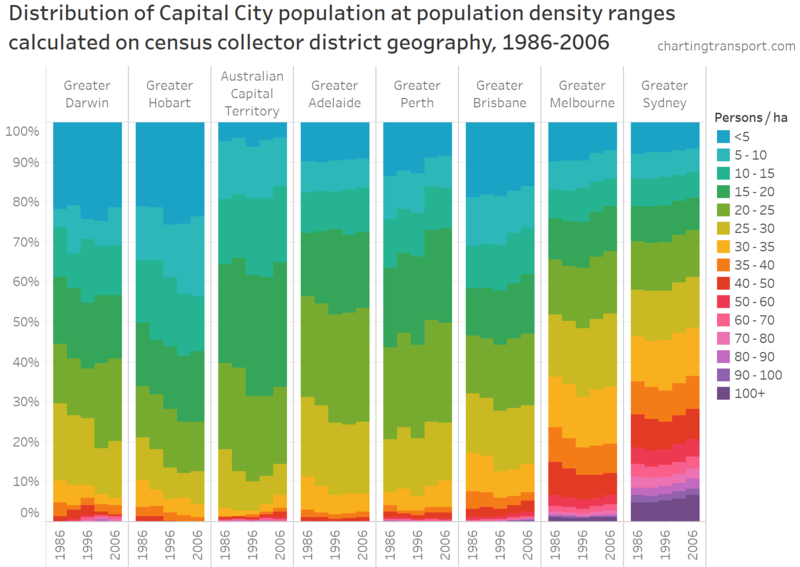 How has the distribution of densities changed in cities since 1986? You can more clearly see the decline in population density in most cities from 1986 to 1996, and it wasn’t just because most of the population growth was a lower densities. 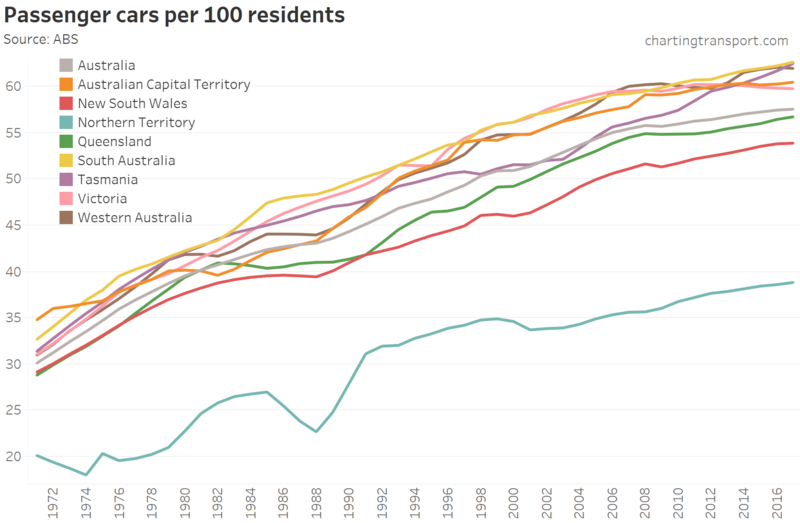 In Hobart, Canberra, Adelaide, Brisbane and Melbourne, the total number of people living at densities of 30 or higher actually reduced between 1986 and 1996. I’ve used the same colour scale, but note that the much smaller geography size means you see a lot more of the population at the higher density ranges. The patterns are very similar to the distribution for square km grid data. 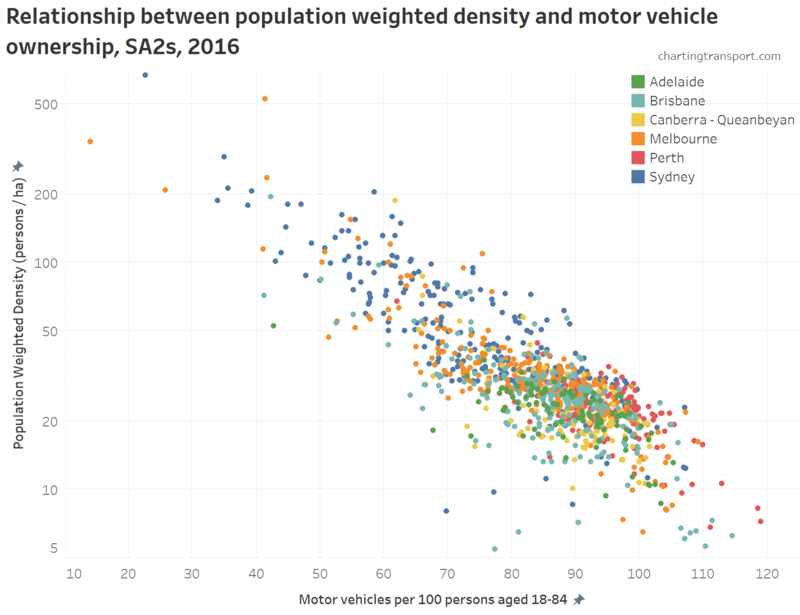 You can see the how Brisbane seems to bleed into Melbourne and then into Sydney, suggesting a roughly 15 year lag in density distributions. 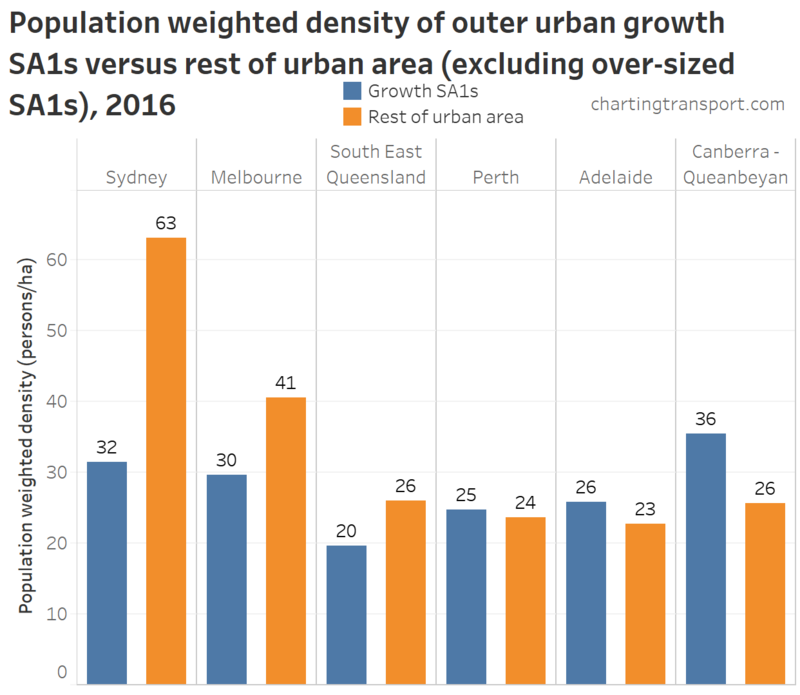 This chart also more clearly shows the recent rapid rise of high density living in the smaller cities of Canberra and Darwin. 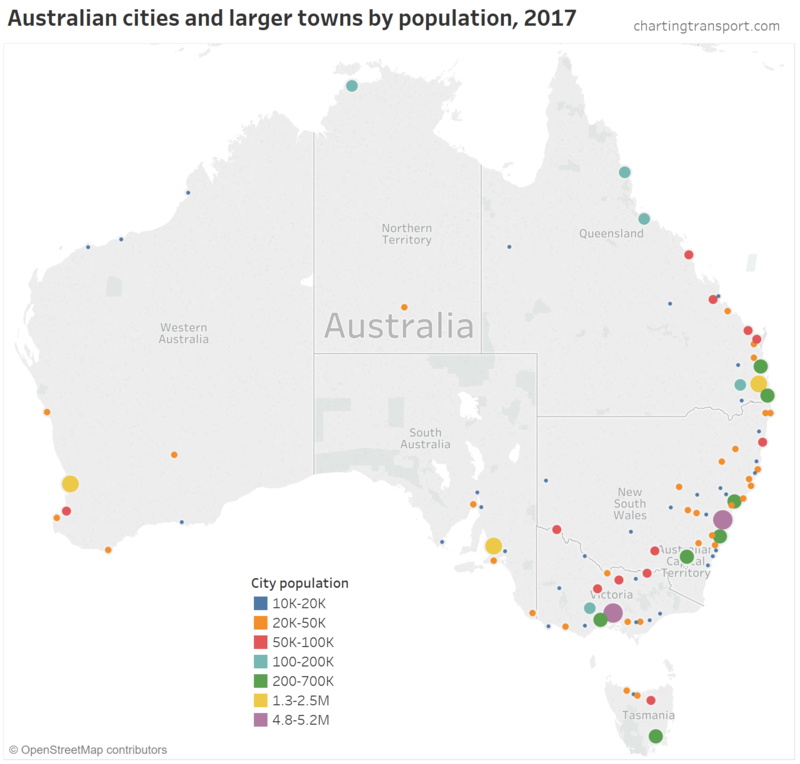 Gold Coast and Wollongong stand out as smaller cities with a significant portion of their population at relatively high densities, but a fair way off Sydney and Melbourne. (Sorry I don’t have a mesh block times series of density distribution for the smaller cities – it would take a lot of GIS processing to map 2006 and 2011 mesh blocks to 2016 SUAs, and the trends would probably be similar to the km grid results). Can we measure density changes further back in history and for smaller cities? Yes, but we need to use different statistical geography. Annual population estimates are available at SA2 geography back to 1991, and at SA3 geography back to 1981. However, there are again problems with consistency in statistical geography between cities and over time. 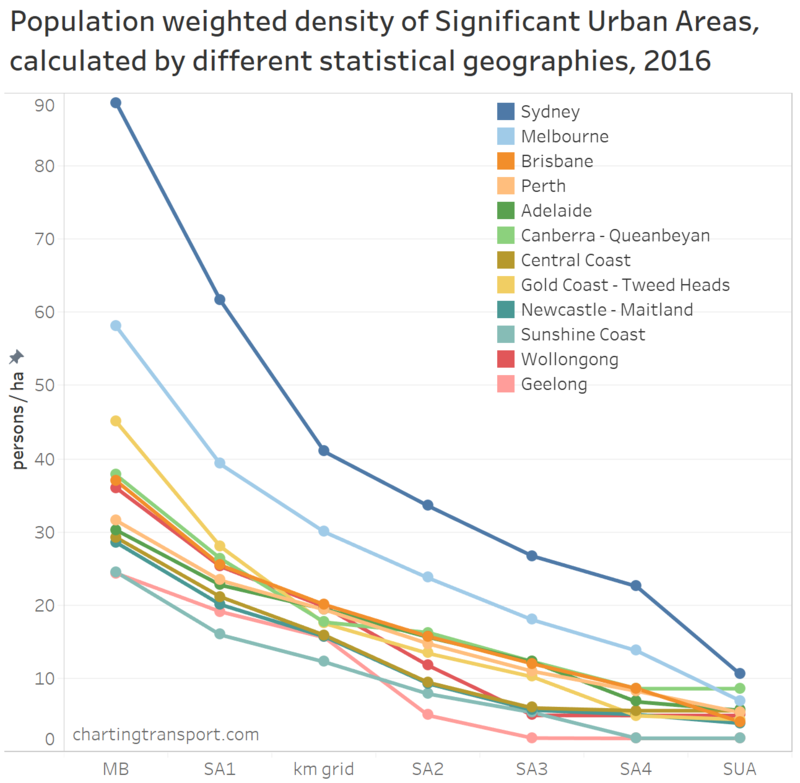 Previously on this blog I had assumed that guidelines for creation of statistical geography boundaries have been consistently applied by the ABS across Australia, resulting in reasonably consistent population sizes, and allowing comparisons of population-weighted density between cities using particular levels of statistical geography. Unfortunately that wasn’t a good assumption. Note: I’ve used a log scale on the Y-axis. While there isn’t a huge amount of variation between medians at mesh block and SA1 geographies, there are massive variations at SA2 and larger geographies. SA2s are intended to have 3,000 to 25,000 residents (a fairly large range), with an average population of 10,000 (although often smaller in rural areas). 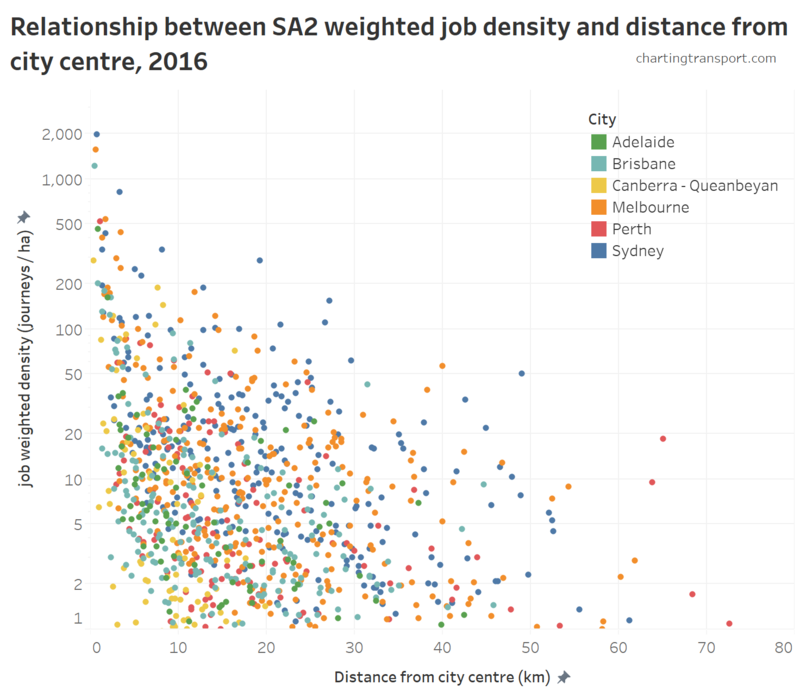 You can see from the chart above that there are large variances between medians of the cities, with the median size in Canberra and Darwin below the bottom of the desired range. I have asked the ABS about this issue. They say it is related to the size of gazetted localities, state government involvement, some dense functional areas with no obvious internal divisions (such as the Melbourne CBD), and the importance of capturing indigenous regions in some places (eg the Northern Territory). SA2 geography will be up for review when they update statistical geography for 2021. While smaller SA2s mean you get higher resolution inter-censal statistics (which is nice), it also means you cannot compare raw population weighted density calculations between cities at SA2 geography. However, all is not lost. We’ve got calculations of PWD on the unbiased square kilometre grid geography, and we can compare these with calculations on SA2 geography. 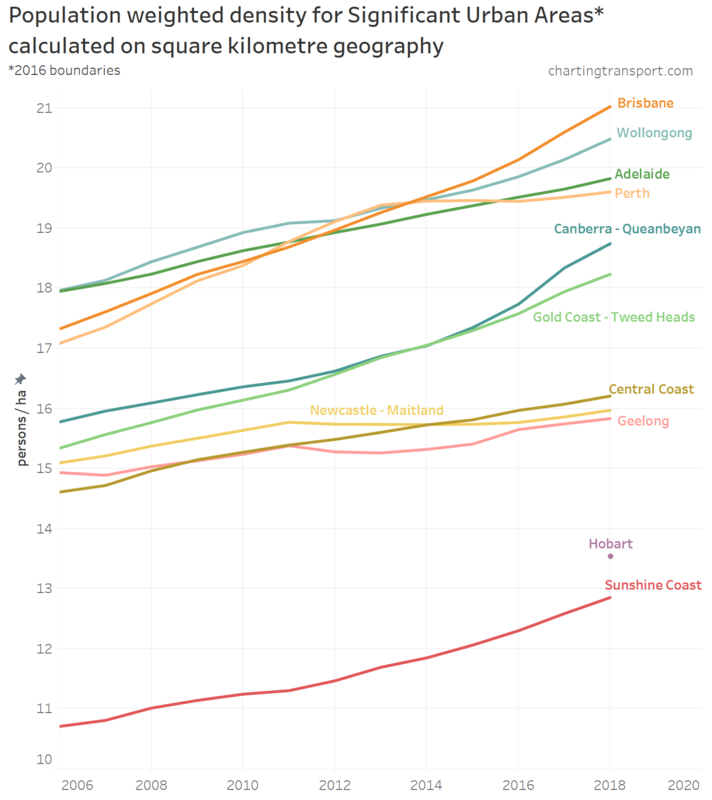 It turns out they are very strongly linearly correlated (r-squared of over 0.99 for all cities except Geelong). So it is possible to estimate square km grid PWD prior to 2006 using a simple linear regression on the calculations for 2006 to 2018. 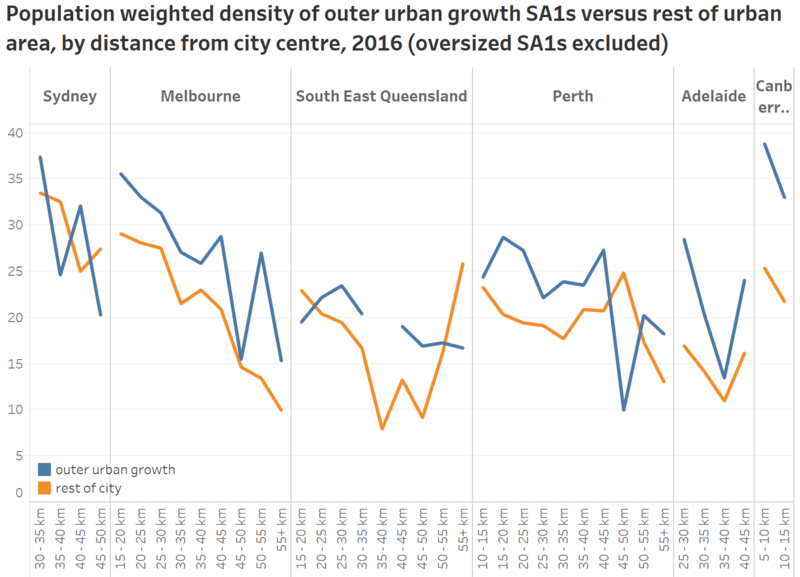 But there is another complication – ABS changed the SA2 boundaries in 2016 (as is appropriate as cities grow and change). Data is available at the new 2016 boundaries back to 2001, but for 1991 to 2000 data is only available on the older 2011 boundaries. 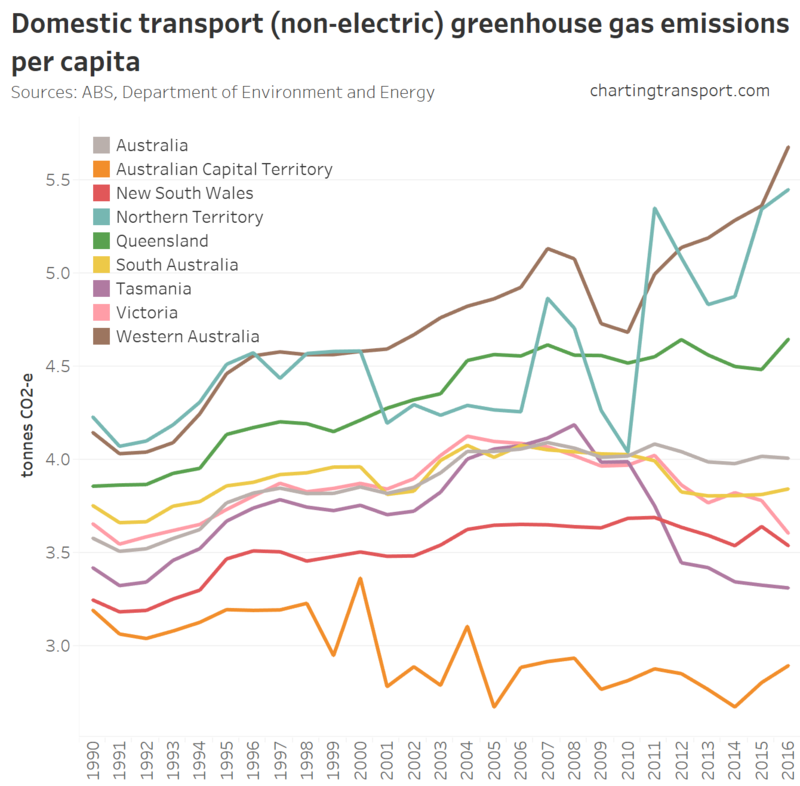 For most cities this only creates a small perturbation in PWD calculations around 2001 (as you’ll see on the next chart), but it’s larger for Geelong, Gold Coast – Tweed Heads and Newcastle Maitland so I’m not willing to provide pre-2001 estimates for those cities. Even if the scaling isn’t perfect for all history, the chart still shows the shape of the curve of the values. Consistent with the CD data, several cities appear to have bottomed out in the mid 1990s. On SA2 data, that includes Adelaide in 1995, Perth and Brisbane in 1994, Canberra in 1998 and Wollongong in 2006. Can we go back further? If we want to go back another ten years, we need to use SA3 geography, which also means we need to switch to Greater Capital City Statistical Areas as SA3s don’t map perfectly to Significant Urban Areas (which are constructed of SA2s). Because they are quite large, I’m only going to estimate PWD for larger cities which have reasonable numbers of SA3s that would likely have been fully populated in 1981. I’ve applied the same linear regression approach to calculate estimated square kilometre grid population weighted density based on PWD calculated at SA3 geography (the correlations are strong with r-squared above 0.98 for all cities). Technical notes: SA3 boundaries have yet to change within capital cities, so there isn’t the issue we had with SA2s. The estimates based on SA2 and SA3 data don’t quite line up between 1990 and 1991 which demonstrates the limitations of this approach. 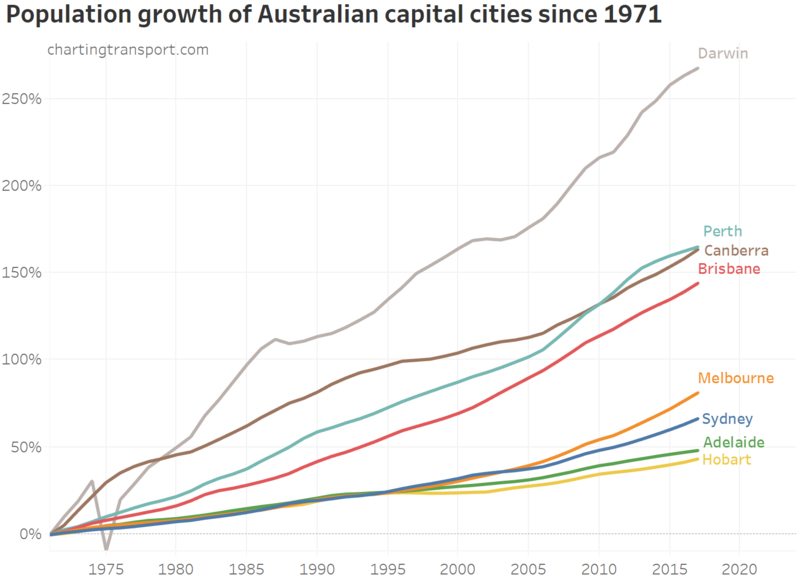 The four large cities shown appear to have been getting less dense in the 1980s (Melbourne quite dramatically). These trends could be related to changes in housing/planning policy over time but they might also be artefacts of using such a coarse statistical geography. 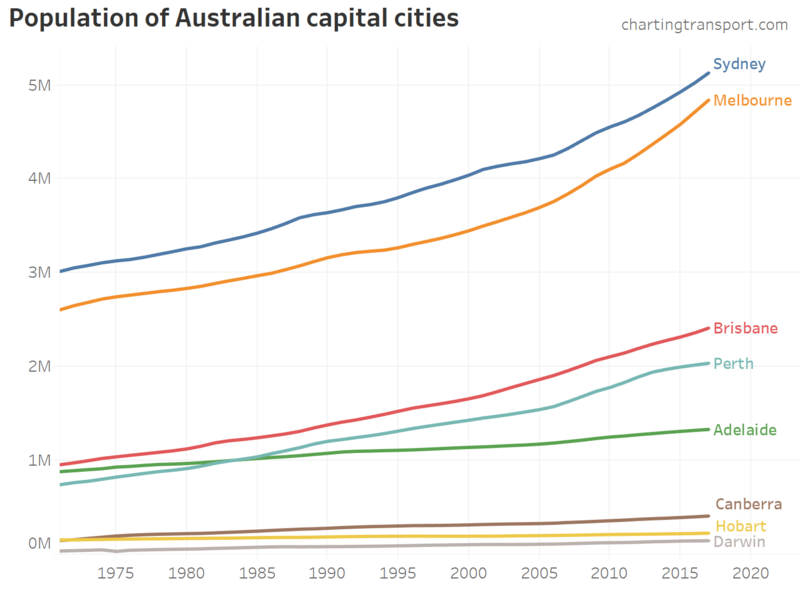 It tends to support the theory that PWD bottomed out in the mid 1990s in Australia’s largest cities. Could we do better than this for long term history? Well, you could probably do a reasonable job of apportioning census collector district data from 1986 to 2001 censuses onto the km grid, but that would be a lot of work! 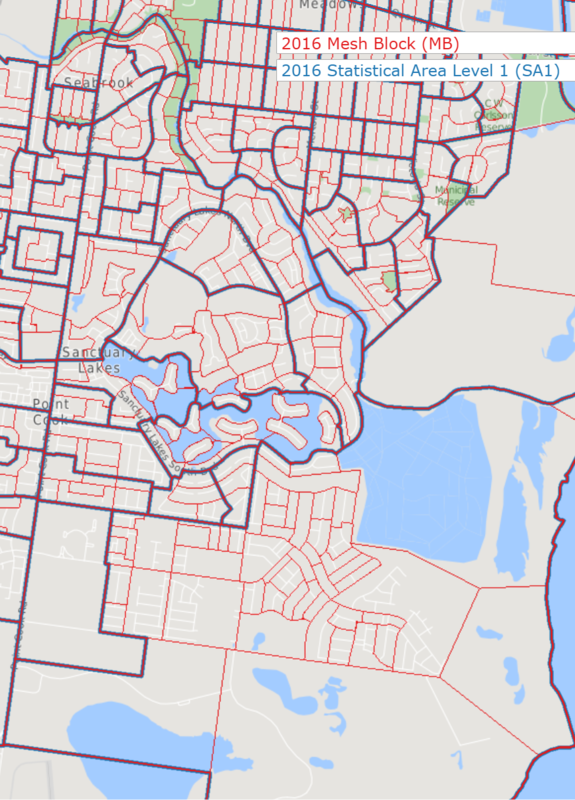 It also wouldn’t be perfectly consistent because ABS use dwelling address data to apportion SA1 population estimates into kilometre grid cells. Besides we have reasonable estimates using collector district geography back to 1986 anyway. So many calculations of PWD are possible – but do they have similar trends? Most of the datasets show an acceleration in PWD post 2011, except the SA3 calculations which are perhaps a little more washed out. The kink in the mesh block PWD is much starker than the other measures. 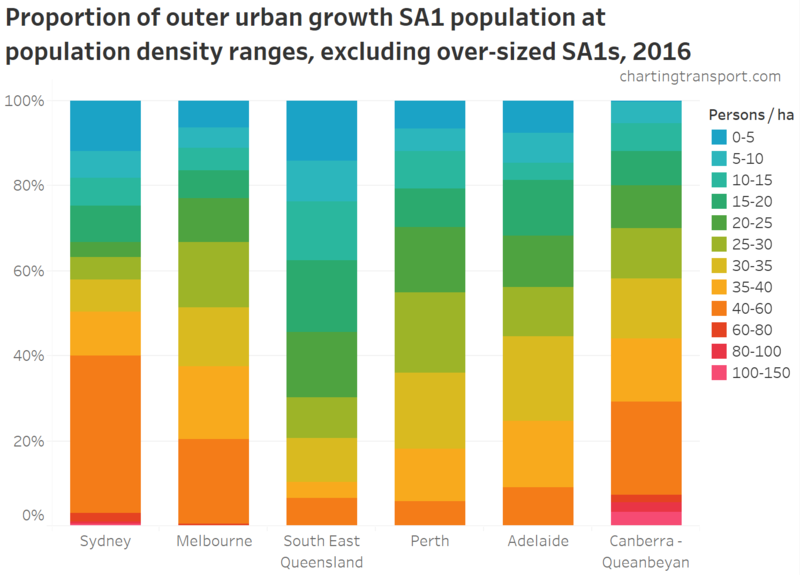 The Melbourne SUA includes only 62% of the land of the Greater Melbourne GCCSA, yet there isn’t much difference in the PWD calculated at SA2 geography – which is the great thing about population-weighted density. 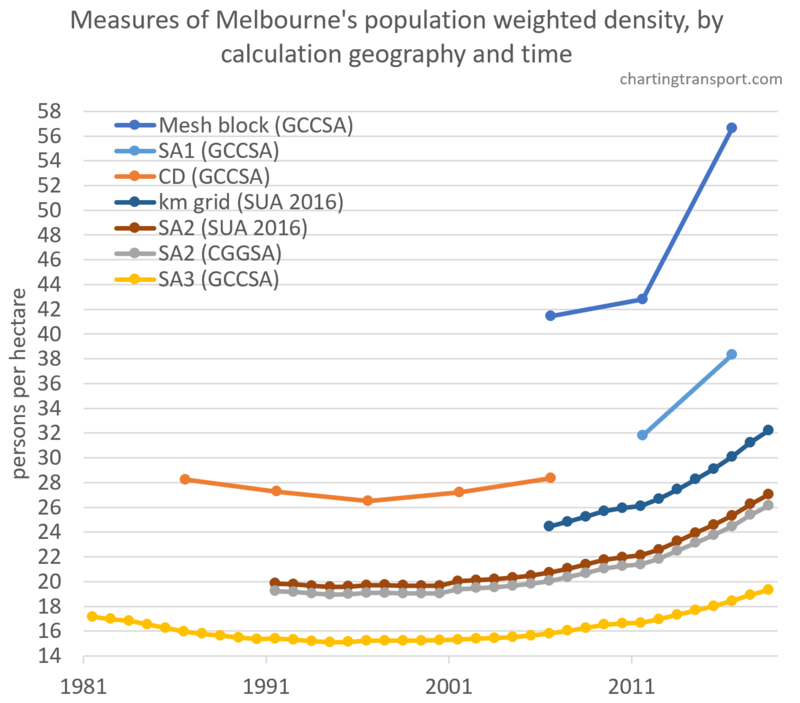 All of the time series data suggests 1994 was the year in which Melbourne’s population weighted density bottomed out. Appendix 1: How much do PWD calculations vary by statistical geography? Technical note: square km grid population data is estimated for 30 June 2016 while the census data is for 9 August 2016. Probably not a significant issue! You can see cities rank differently when km grid results are compared to other statistical geography – reflecting the biases in population sizes at SA2 and larger geographies. 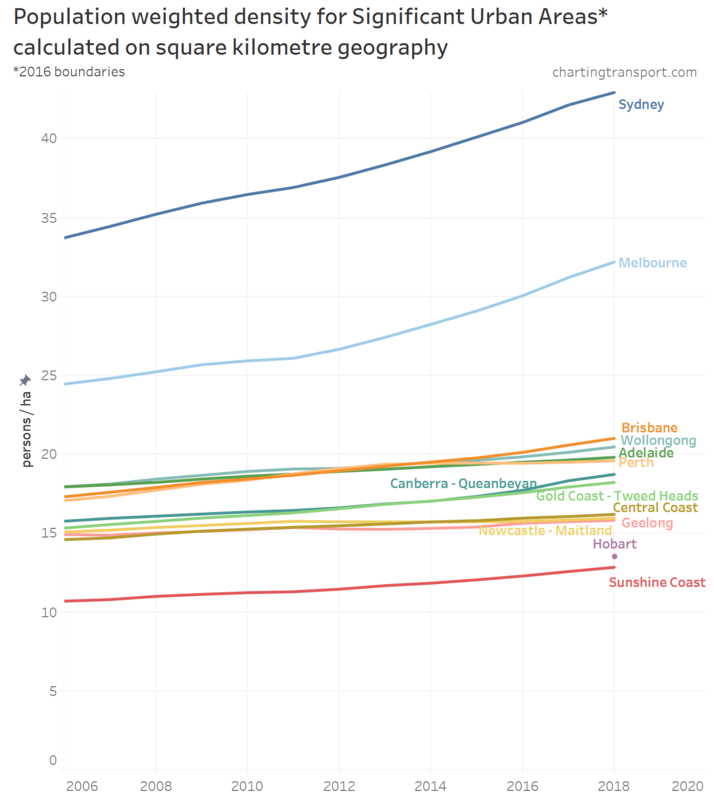 Wollongong and Geelong also show a lot of variation in rank between geographies – probably owing to their small size. 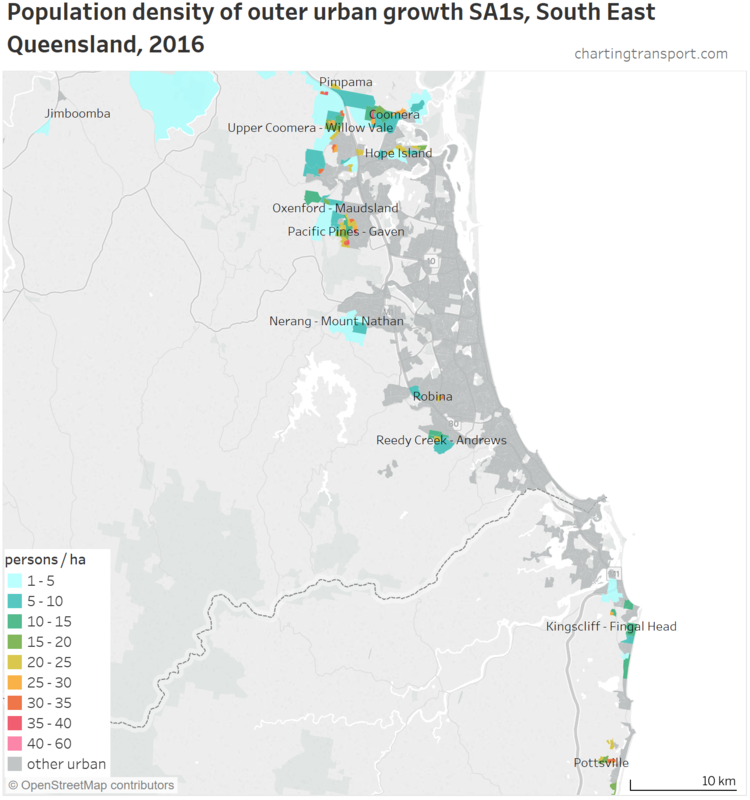 The cities with small pockets of high density – in particular Gold Coast – drop rank with large geography as these small dense areas quickly get washed out. I’ve taken the statistical geography all the way to Significant Urban Area – a single zone for each city which is the same as unweighted population density. These are absurdly low figures and in no way representative of urban density. 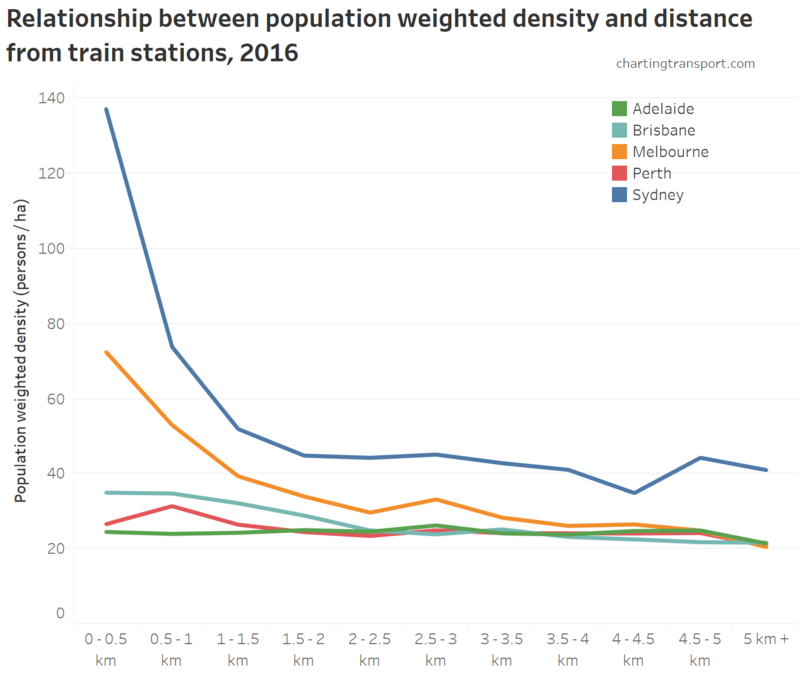 They also suggest Canberra is more dense than Melbourne. In the north parts of this map you can see there are roughly 4-8 mesh blocks per SA1, but there is an oversized SA1 in the south of the map with around 50 mesh blocks. This will impact PWD calculated at SA1 geography, although these anomalies are relatively small when you are looking at a city as large as Melbourne. 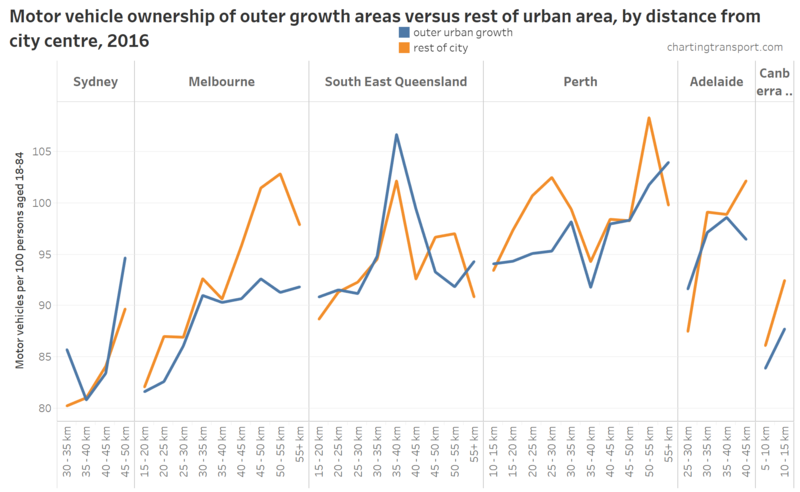 My last post showed half of Perth’s outer urban population growth between 2011 and 2016 happened in places more than 5 km from a train station (see: Are Australian cities sprawling with low-density car-dependent suburbs?). It’s very car-dependent sprawl, with high levels of motor vehicle ownership (96 per 100 persons aged 18-84) and high private transport mode share of journeys to work (88%). But what about population growth overall in cities? 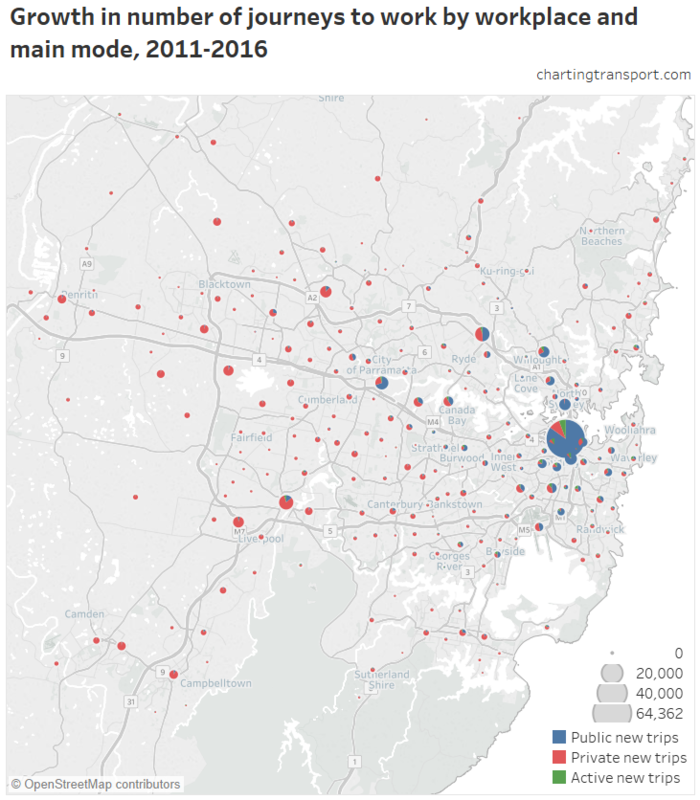 Is most growth happening close to rapid transit stations? How are cities orientated to rapid transit overall? And how does rapid transit orientation relate to mode shares? Let’s dive into the data to find out. Why is proximity to rapid transit important? However it is worth noting that the proximity impact wears off mostly after only a couple of kms. Being 2-5 kms from a station is only useful if you can readily access that station – for example by bus, bicycle, or if you are early enough to get a car park. 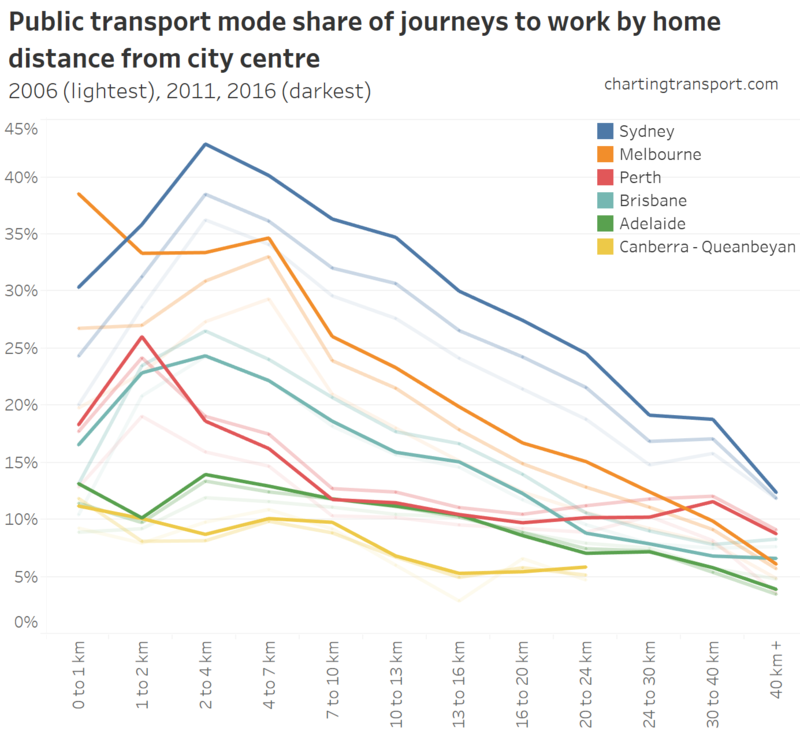 (see: What explains variations in journey to work mode shares between and within Australian cities? ), and I’ll a little have more to say on this below. But in general, if you want to reduce a city’s car dependence, you’ll probably want more people living closer useful rapid public transport. 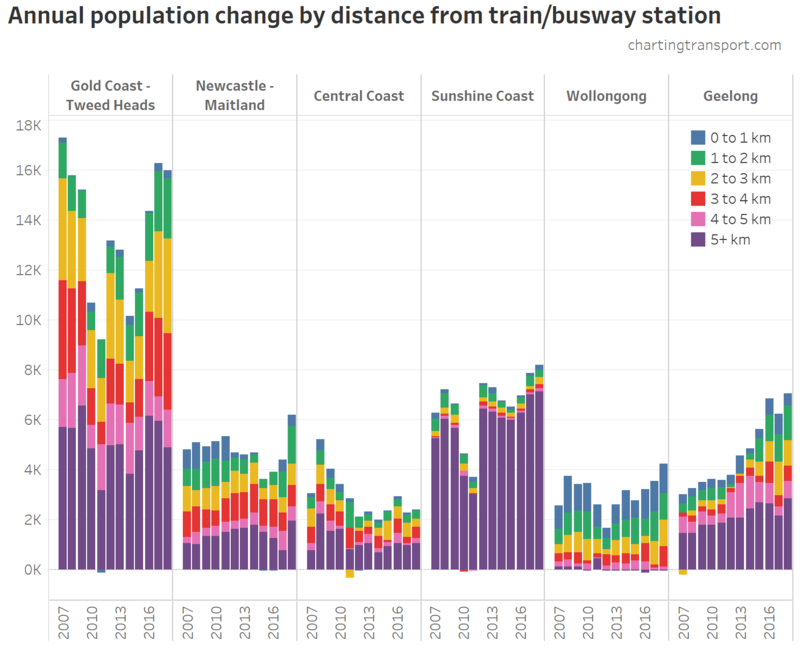 Is population growth happening near train/busway stations? The following chart (and most subsequent charts) are built using ABS square kilometre grid population data for the period 2006 to 2018 (see appendix for more details). 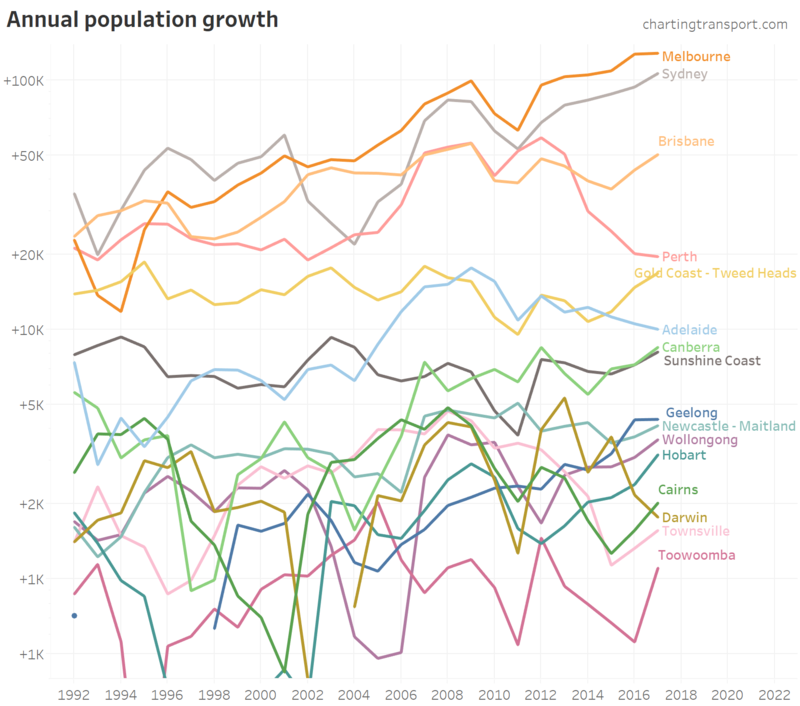 Melbourne has seen the most population growth overall, followed by Sydney and Brisbane. Population growth in Perth has slowed dramatically since 2014, and has been remained slow in Adelaide. Population growth in areas remote from stations most cities has been relatively steady. By contrast, the amount of population growth nearer to stations fluctuates more between years – there was a noticeable dip in growth near stations around 2010 and 2011 in all cities. 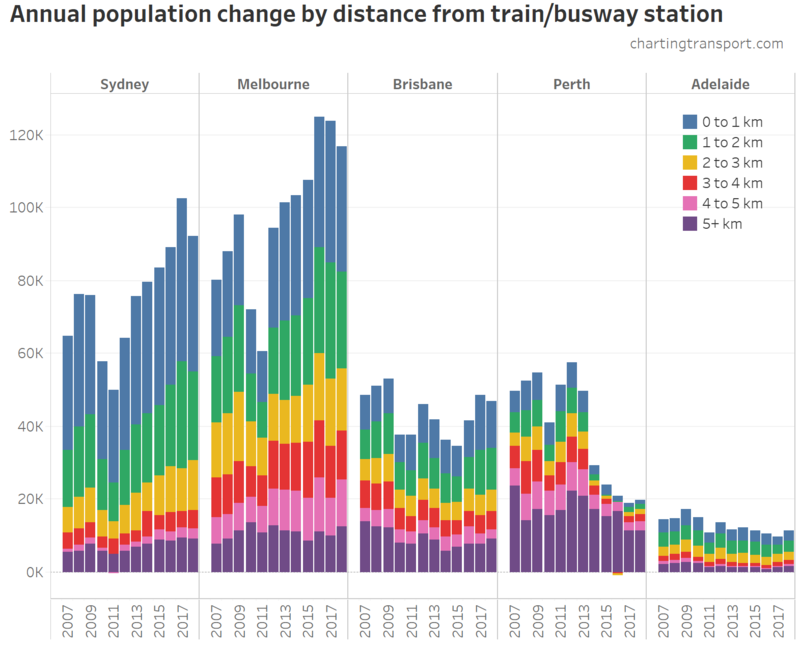 You can also see that in recent years the majority of Perth’s population growth has been more than 5 km from a station. 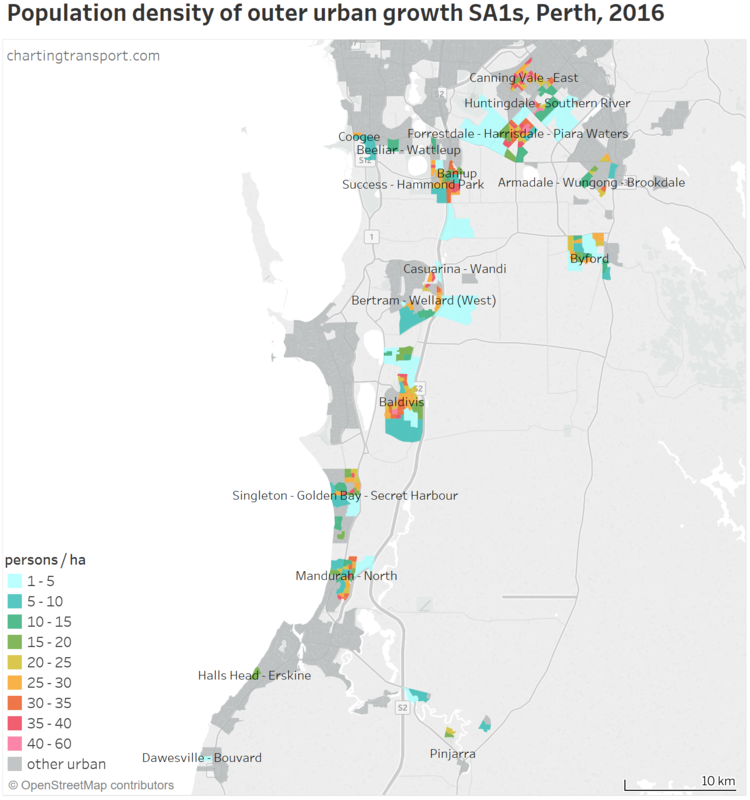 You can see that most of Perth’s population growth has been remote from stations. 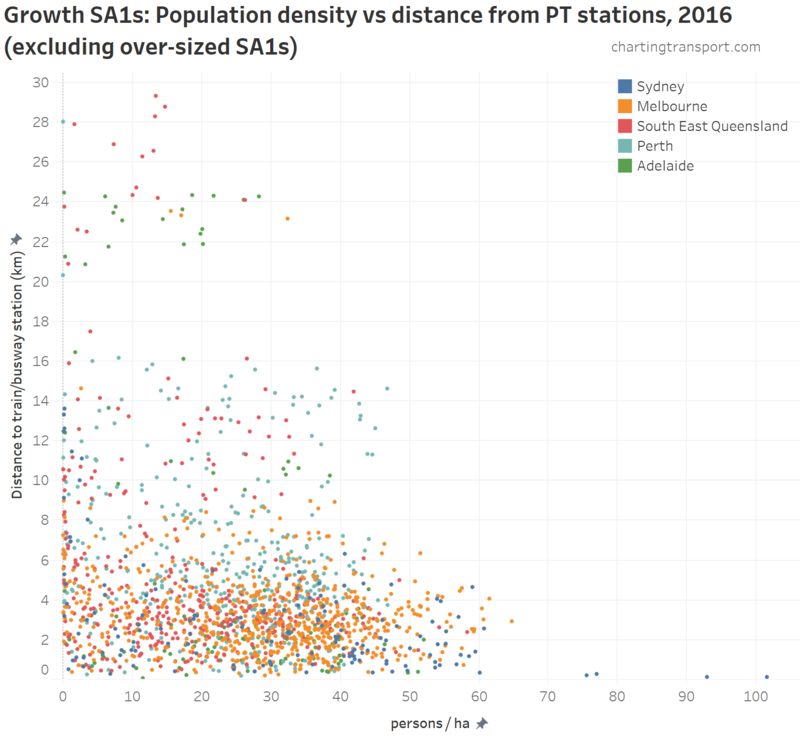 In the year to June 2016, 85% of Perth’s population growth was more than 5 km from a train station (the chart actually goes outside the 0-100% range in 2016 because there was a net decline in population for areas between 2 and 4 km from stations). That was an extreme year, but in 2018 the proportion of population growth beyond 5 km from a station had only come down to 57.5%. That is not a recipe for reducing car dependence. 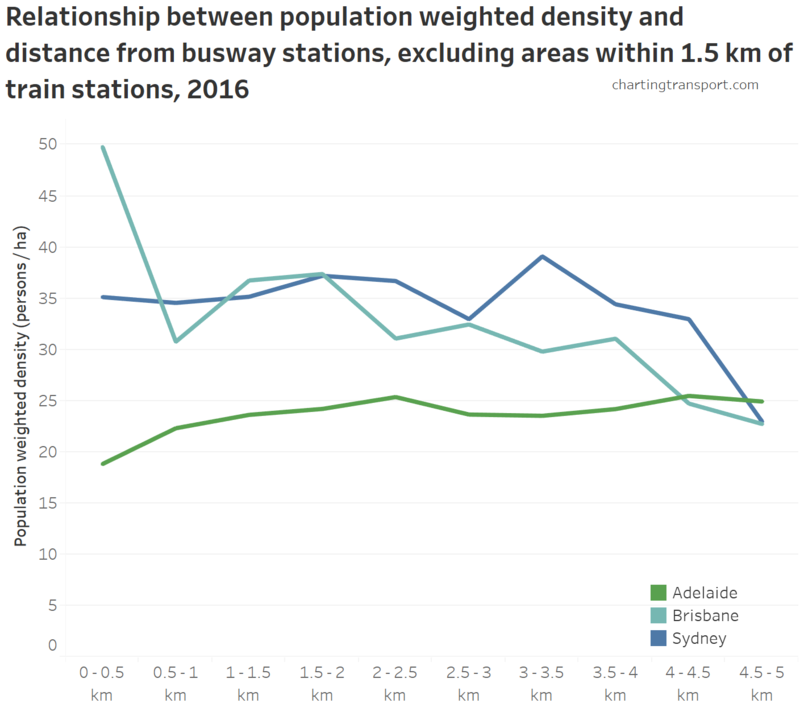 At the other end of the spectrum, almost half of Sydney’s population growth has been within 1 km of a train or busway station. No wonder patronage on Sydney’s train network is growing fast. 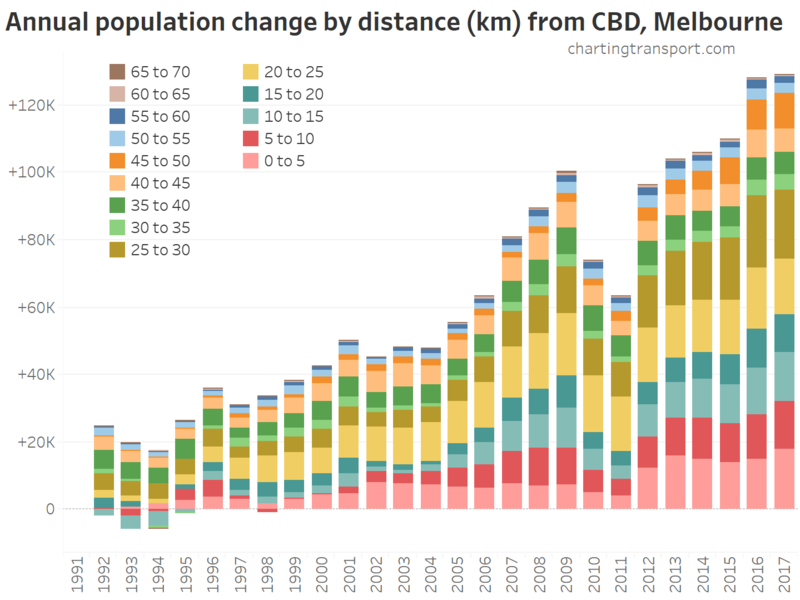 Melbourne has had the smallest share of population growth being more than 5 km from a station over most years since 2006. The impact of the South Morang to Mernda train line extension, which opened in August 2018, won’t be evident until the year to June 2019 data is released (probably in March 2020). Melbourne’s planned outer growth corridors are now largely aligned with the rail network, so I would expect to see less purple in upcoming years. 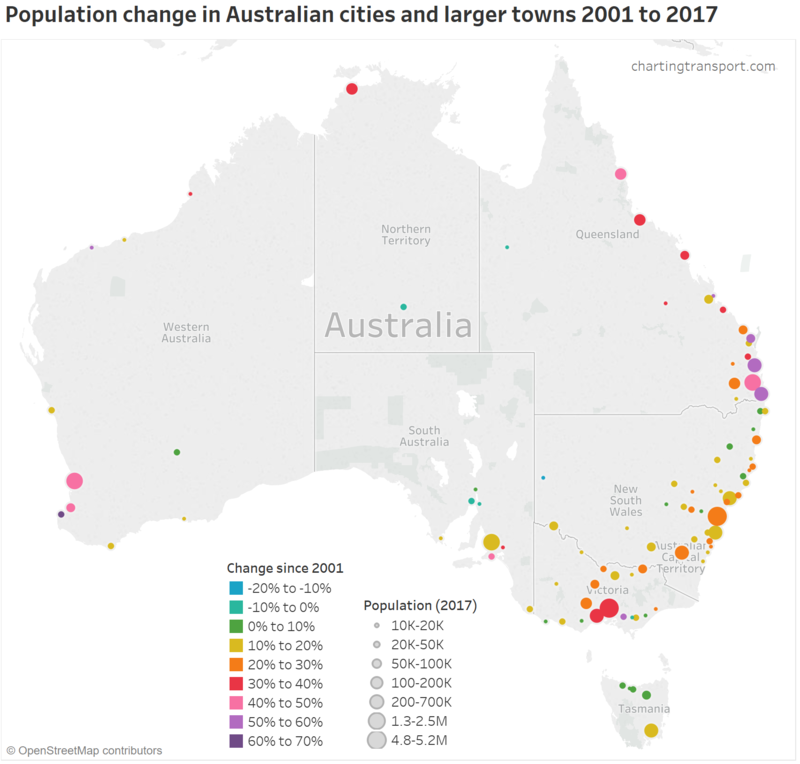 Gold Coast – Tweed Heads has seen the most population growth, followed by the Sunshine Coast and more recently Geelong population growth has accelerated. 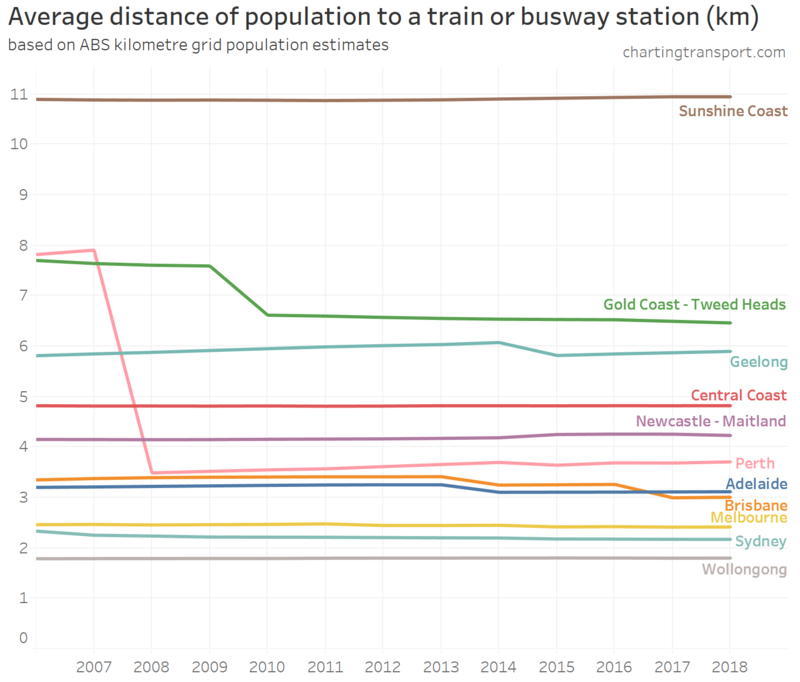 The Sunshine Coast stands out as having the most population growth remote from rapid transit (a Maroochydore line has been proposed), while Wollongong had the highest share of population growth near stations. What about total city population? Sydney has the most rapid transit orientated population, with 67% of residents within 2 km of a rapid transit station. Sydney is followed by Melbourne, Brisbane, Adelaide, and then Perth. The most spectacular step change was in Perth in 2008, following the opening of the Mandurah rail line in the southern suburbs. This brought rail access significantly closer for around 18% of the city’s population. However, Perth has since been sprawling significantly in areas remote from rail while infill growth has all but dried up in recent years. 22% of the June 2018 population was more than 5 km from a train station, up from 19% in 2008. But it’s still much lower than 37% in 2007. 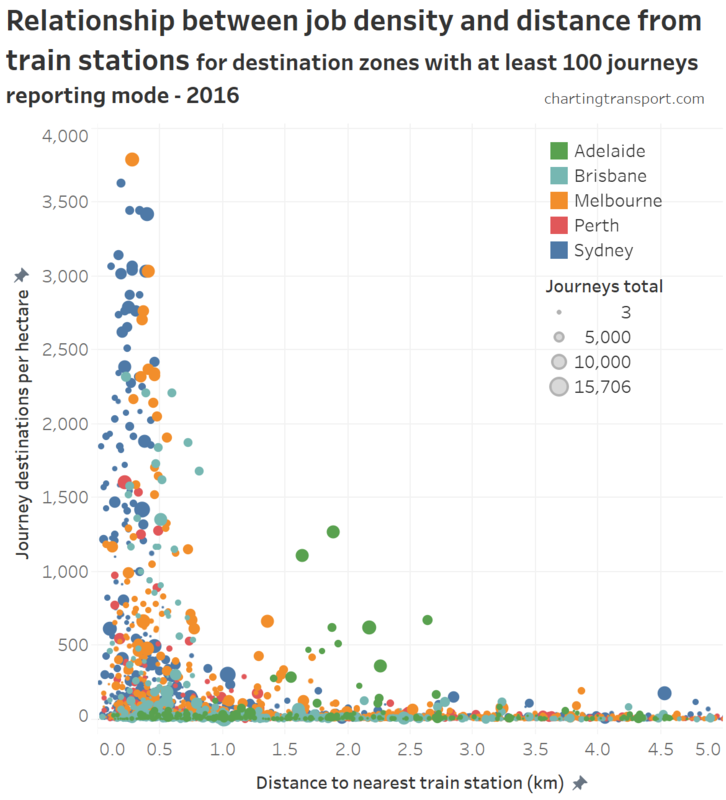 Perth remains the least rapid transit orientated large city in Australia. Brisbane has also seen some big step changes with new rail lines to Springfield (opening December 2013) and Redcliffe Peninsula (opening October 2016). 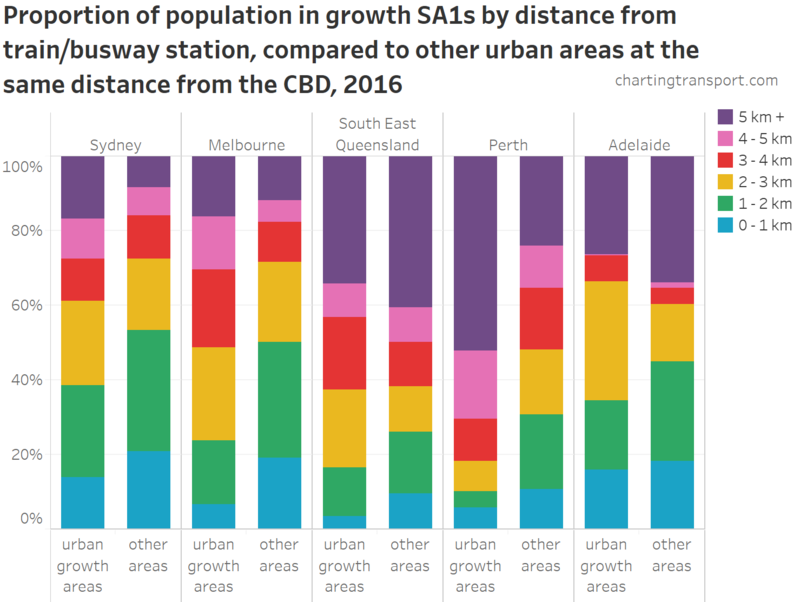 Several new station openings around Melbourne have kept the overall distance split fairly stable – that is to say the new stations have been just keeping up with population growth. The biggest noticeable step change was the opening of Tarneit and Wyndham Vale stations in 2015. Adelaide’s noticeable step change followed the Seaford rail extension which opened in February 2014. Sydney’s step change in 2007 was the opening of the North West T-Way (busway). The opening the Leppington rail extension in 2015 is also responsible for a tiny step (much of the area around Leppington is yet to be developed). Woolongong is the most rapid transit orientated medium sized city, followed by Geelong and Newcastle. 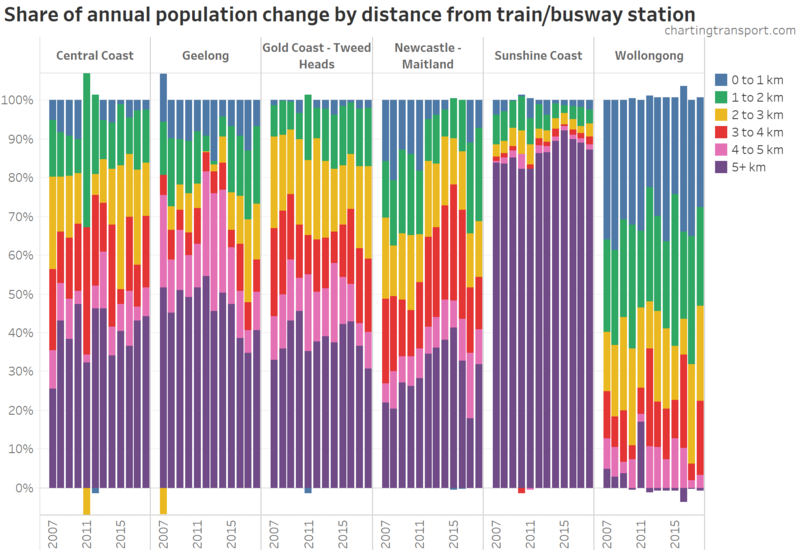 In the charts you can see the impact of the Gold Coast train line extension to Varsity Lakes in 2009, the truncation of the Newcastle train line in 2014 and subsequent opening of “Newcastle Interchange” in 2017, and the opening of Waurn Ponds station in Geelong in 2015. 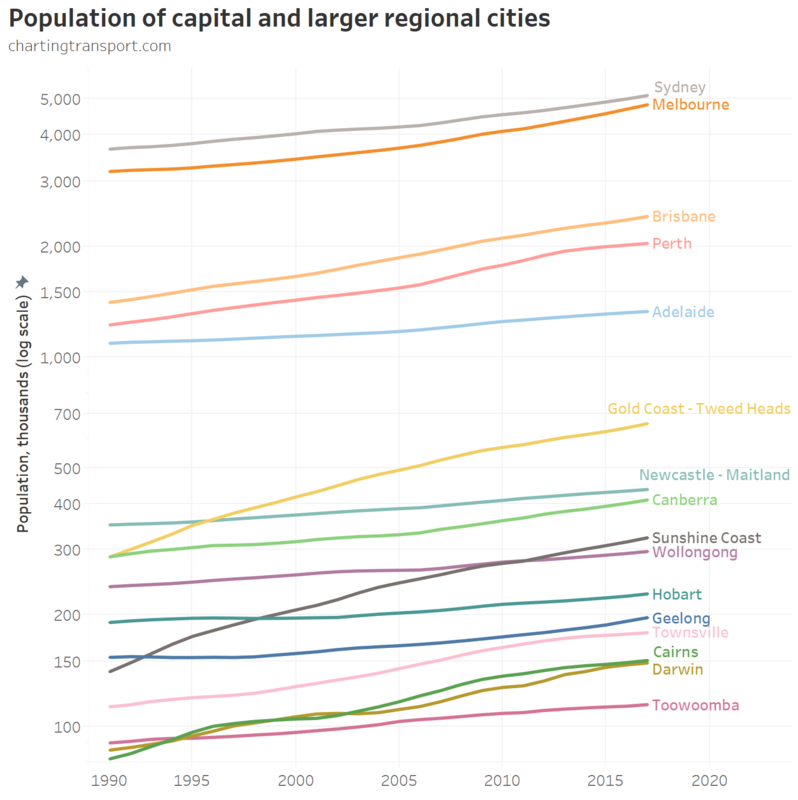 Many cities have barely changed on this metric (including Melbourne which has had a reduction of just 26 metres between 2006 and 2018). Brisbane, Perth and the Gold Coast are the only cities to have achieved significant reductions over the period. 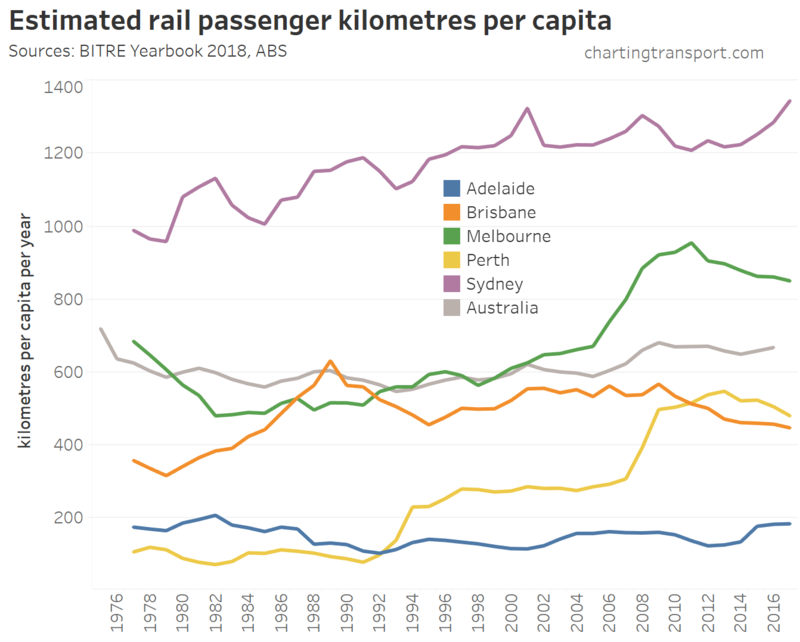 It will be interesting to see how this changes with new rail extensions in future (eg MetroNet in Perth), and I’ll try to update this post each year. 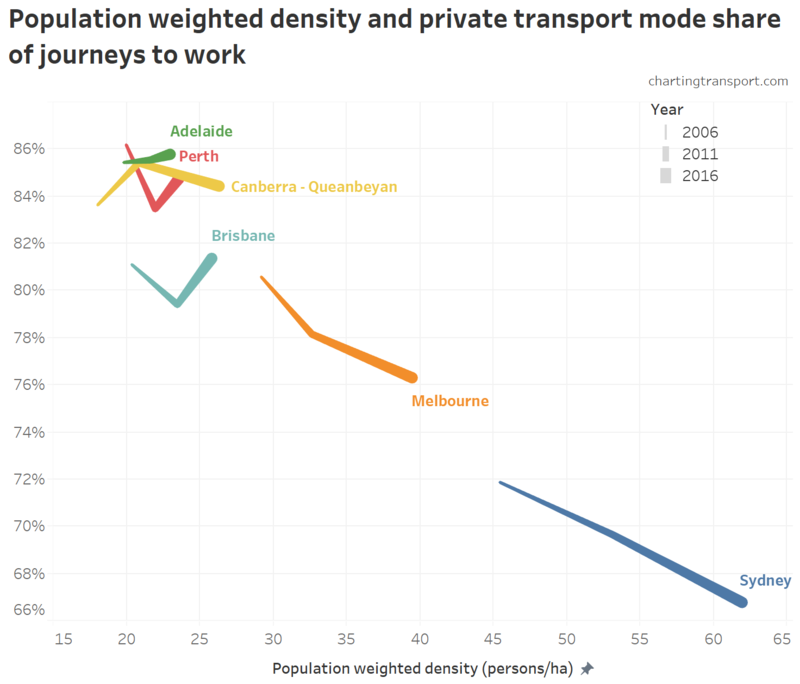 How strong is the relationship with public transport mode shares at a city level? 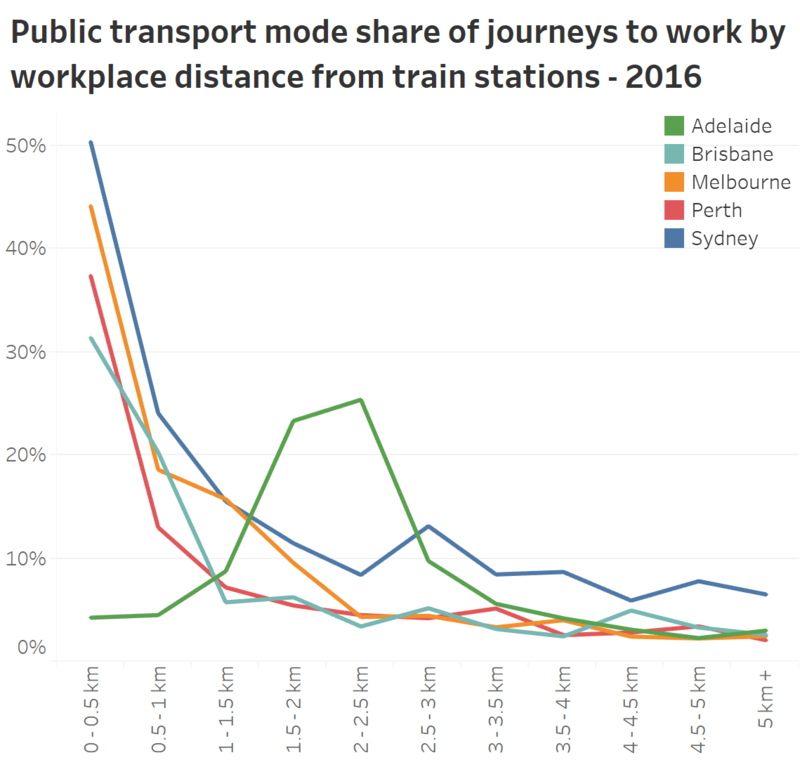 While there appears to be something of an inverse relationship (as you might expect), there are plenty of other factors at play (see: What explains variations in journey to work mode shares between and within Australian cities?). 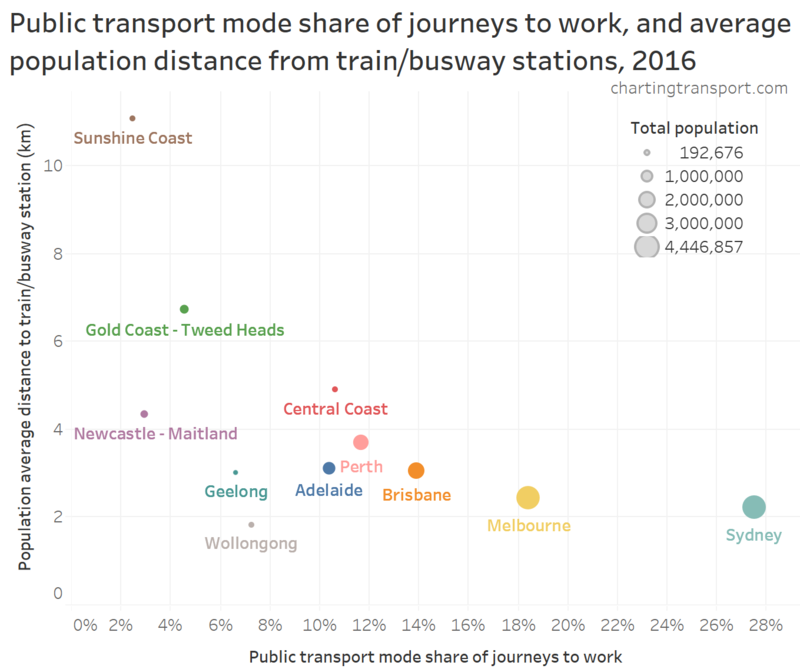 In particular, Newcastle, Geelong, and Wollongong have relatively low public transport mode shares even though they have high average proximity to rapid transit stations. 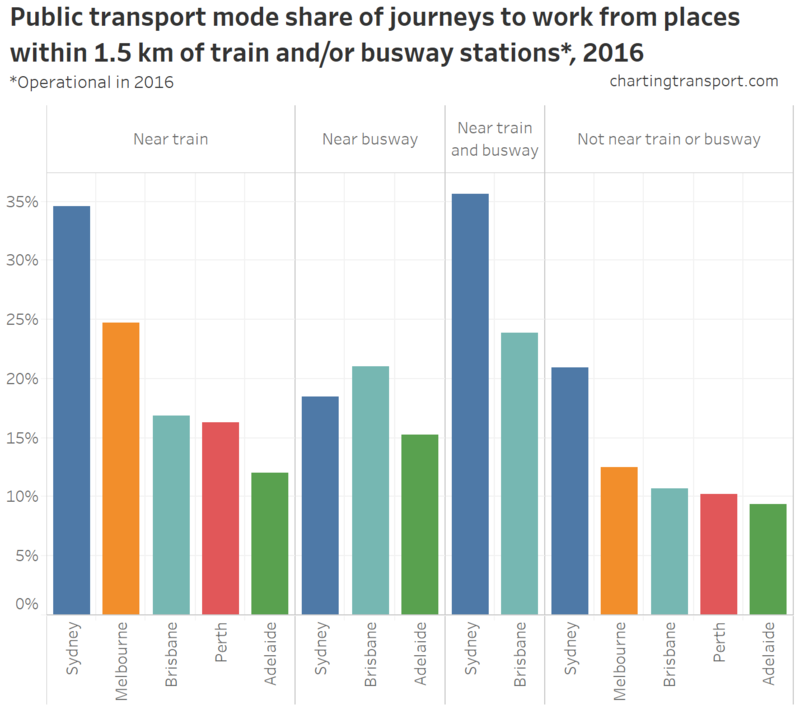 Most journeys to work involving train from these smaller cities are not to local workplaces but to the nearby capital city, and those long distance commutes make up a relatively small proportion of journeys to work. I’ve used ABS’s relatively new kilometre grid annual population estimates available for each year from June 2006 onwards (to 2018 at the time of writing), which provides the highest resolution annual population data, without the measurement problems caused by sometimes irregularly shaped and inconsistently sized SA2s. I’ve used train and busway station location data from various sources (mostly GTFS feeds – thanks for the open data) and used Wikipedia to source the opening dates of stations (that were not yet open in June 2006). I’ve mostly ignored the few station closures as they are often replaced by new stations nearby (eg Keswick replaced by Adelaide Showgrounds), with the exception of the stations in central Newcastle. As with previous analysis, I’ve only included busways that are almost entirely segregated from other traffic. I haven’t included Gold Coast light rail on account of its average speed being only 27 km/h (most Australian suburban railways average at least 32 km/h). I have to draw the line somewhere! I also haven’t included Canberra as it lacks an internal rapid transit system (light rail is coming soon, although it will have an average speed of 30 km/h – is that “rapid transit”?). Distances from stations are measured from the centroid of the grid squares to the station points (as supplied) – which I have segmented into 1 kilometre intervals. Obviously this isn’t perfect but I’m assuming the rounding issues don’t introduce overall bias. On this map, I’ve filtered for grid squares that have an estimated population of at least 100 (note: sometimes the imperfections of the ABS estimates mean grid squares get depopulated some years). Finally, I’ve used Significant Urban Areas on 2016 boundaries to define my cities, except that I’ve bundled Yanchep into Perth, and Melton into Melbourne. 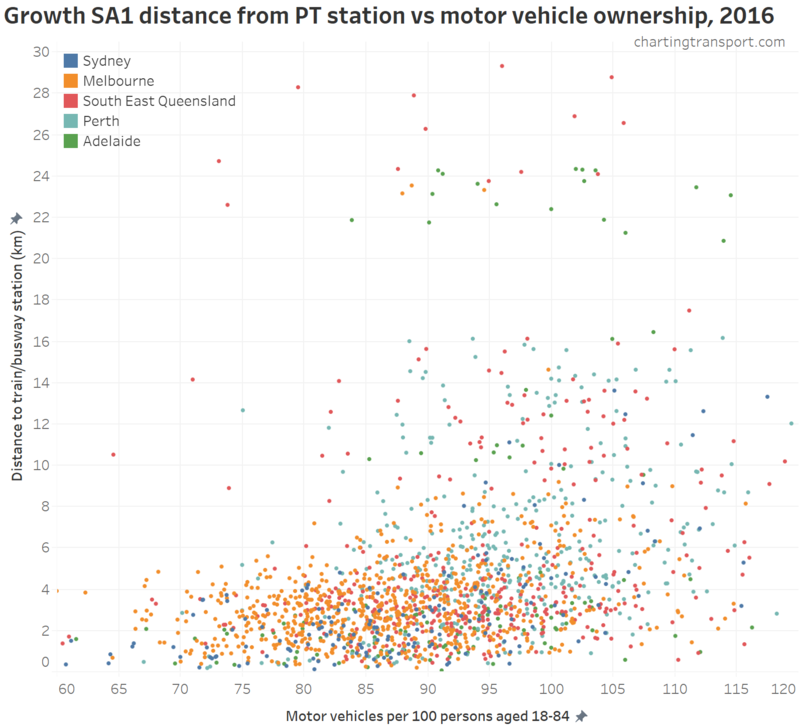 The location of population growth has a big impact on transport outcomes. It’s also interesting in its own right. So where is Australia’s population growing? 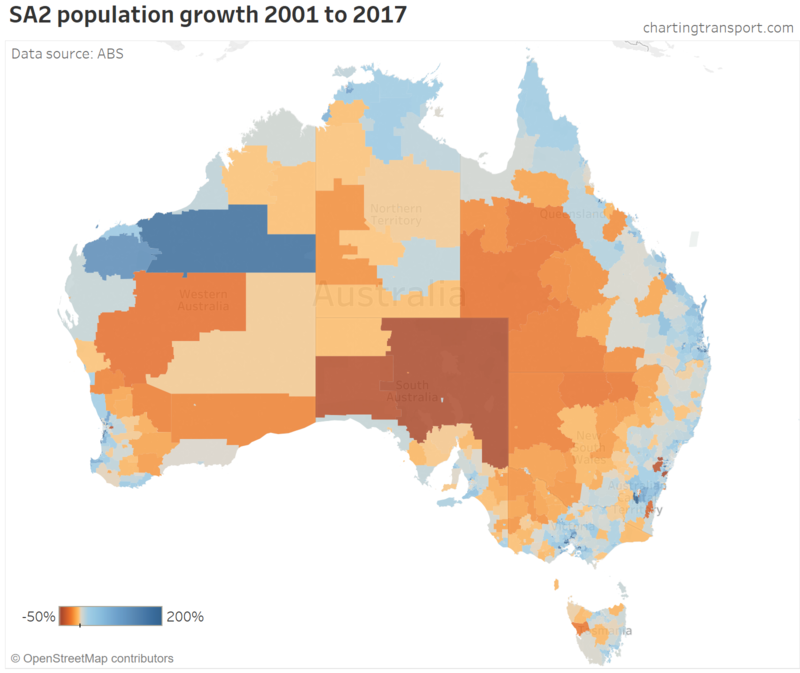 This post primarily uses the ABS’s Regional Population Growth data set, which is the highest resolution geography level for which per-year population estimates are published and the data series goes back to 1991. While the capital cities have seen the largest absolute growth, the large regional cities have seen the highest percentage growth. 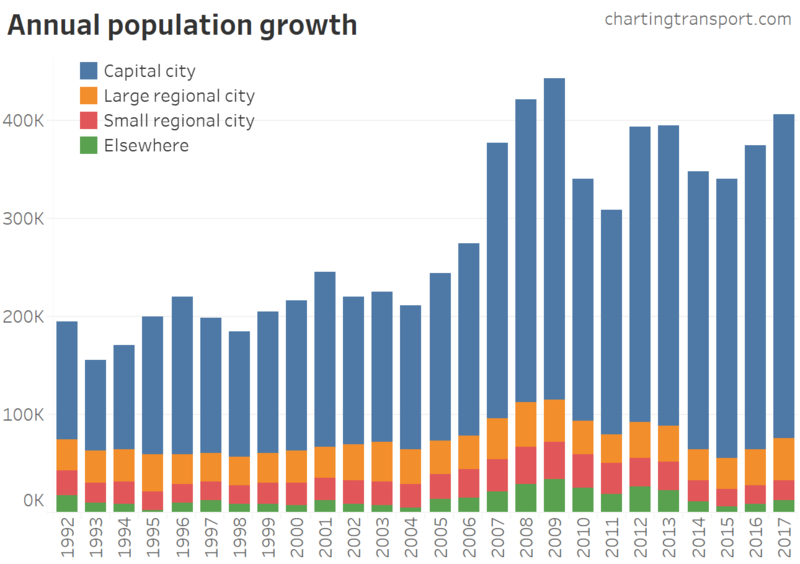 The capital cities have dominated the quantity of population growth, particularly since around 2007, with “elsewhere” having very small net growth in recent years. But as the first chart showed, large regional cities have had the fastest percentage growth – so it all depends on how you want to think about “growth”! 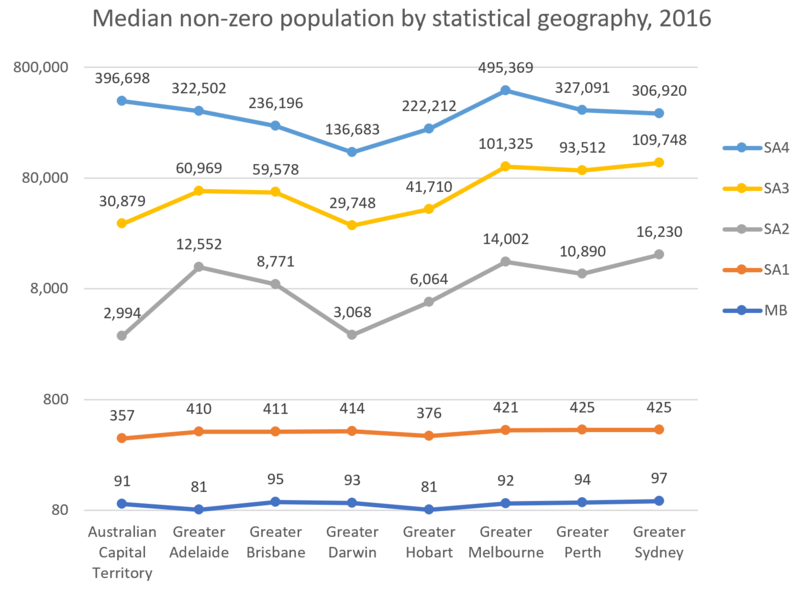 So what proportion of Australians live in urban areas? The United Nations cannot land on a single definition of urban (is a locality of 100 people urban?) so it’s hard to perfectly answer the question. But I can say: well over 90% of Australians live in urban areas. The blip in the Northern Territory represents a temporary exodus of population after Cyclone Tracy devastated much of Darwin on Christmas Day 1974. 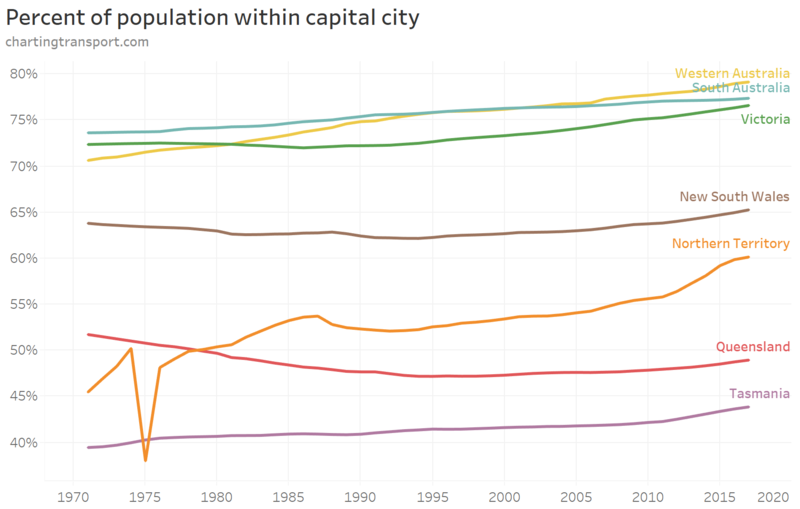 The following chart shows the population of capital cities and large regional cities. Note I’ve again used a log scale on the Y-axis to separate the cities. You can see the Gold Coast and Sunshine Coasts have overtaken several other cities. Technical note: Historical population estimates on Greater Capital City Statistical Area boundaries are only available back to 1971, and for Significant Urban Areas boundaries back to 1991. Estimates for earlier years are on inconsistent boundaries. Perth overtook Adelaide in 1984, and Canberra overtook Hobart in 1972. 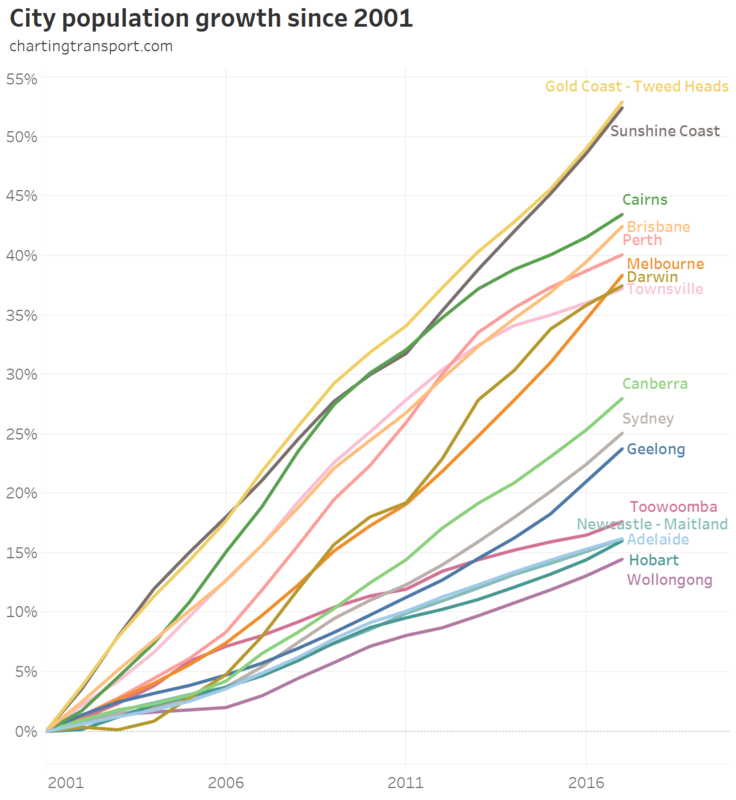 The Gold and Sunshine Coasts are the fastest growing cities by far, followed by Cairns, Brisbane and Perth. Hobart and Adelaide are the slowest growing capital cities. 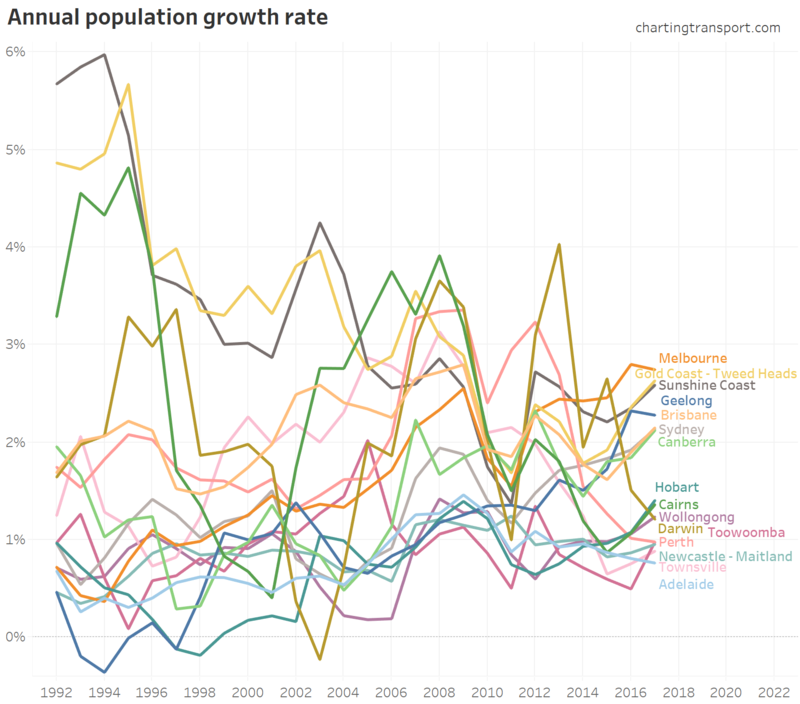 In 2017, Melbourne had the fastest population growth rate, and Adelaide the slowest. The Gold and Sunshine Coasts have had relatively high growth since 1991. All cities have fluctuated a fair bit over time. Technical note: because of the log scale, negative values are omitted from the chart. 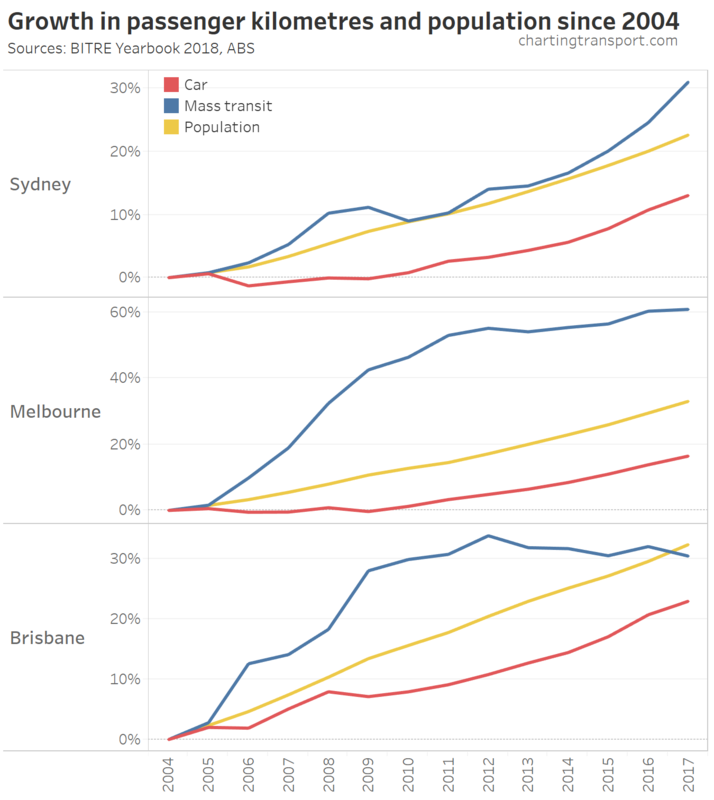 Melbourne has been adding more people than Sydney every year since 2002 (hence predictions it will become Australia’s largest city), while Perth’s recent strong growth spurt ran between 2006 and 2013. Explore this data in Tableau Public. Note: the intervals are arbitrary and it’s hard to get them perfect. For example, Ballarat had 103,581 residents and Bendigo 97,470 (in 2017), so they are coloured differently. Note: Ballarat had less than 100,000 residents in 2011 so was not included in the earlier charts for regional cities. The city or town with the highest percentage growth is Bussleton in WA (+66%), followed by Hervey Bay in Queensland (+58%). Broken Hill (NSW) has seen the biggest population decline (-15%), followed by Mount Isa in Queensland (-7%). 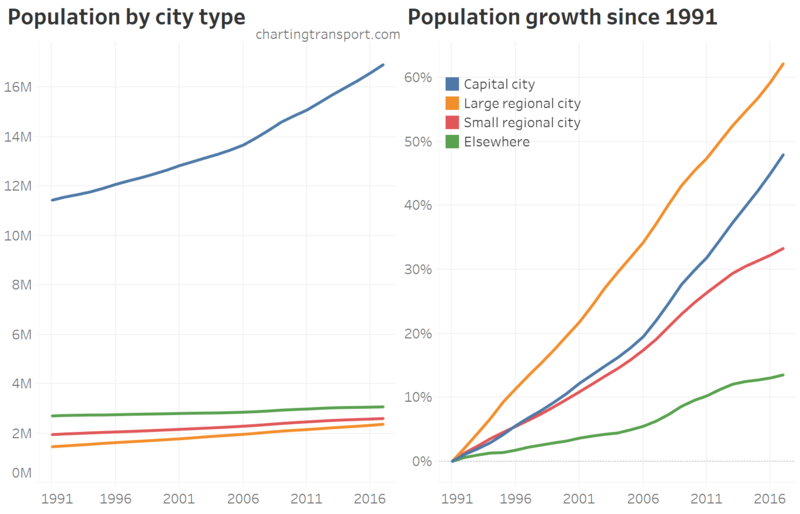 Where is population growing within larger cities? Technical note: I’ve used point circles for each SA2, rather than fill colour (which should never be used for non-ratio data because the size of the zone can too easily distort the message!). Alternatives are to show population density, population growth density, or growth rate percentages. However some metro fringe SA2s include a relatively small urban area coupled with a large rural area, so the density gets washed out by the rural area. Growth rate percentages also depend a lot on the population in the base year. 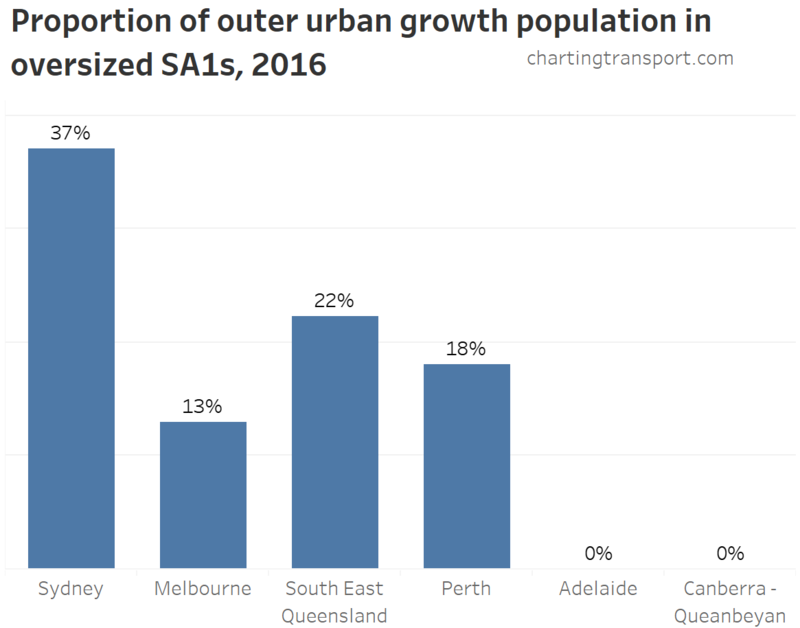 If an SA2 goes from 2000 residents to 8000 residents the growth rate is 300%, but that’s the same increase as a SA2 that goes from 30,000 to 36,000 (20%). Melbourne’s SA2s (on 2016 boundaries) with the largest population growth were in the outer west, outer north, outer south-east, and central city. SA2s with population slight decline were Rowville South, Upwey – Tecoma, Endeavour Hills South, Keilor Downs, Taylors Lakes and Mill Park. I think it’s also important to note that SA2 boundaries are somewhat arbitrary and they only change every five years. 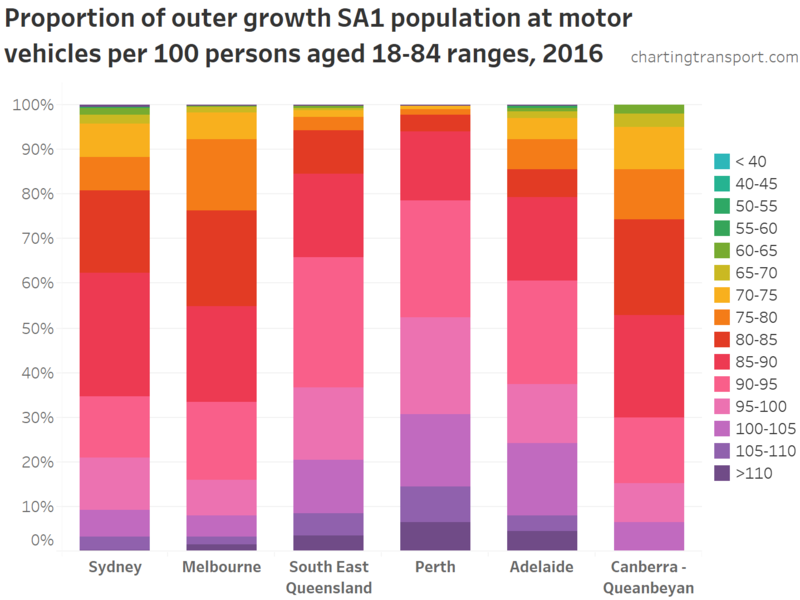 In fact, South Morang was reported by the ABS (and media) as the fastest growing SA2 in Australia in 2015-16 (on 2011 boundaries) in terms of absolute growth, but by then it had 64,354 residents and was by far the largest SA2 in Australia (the next largest, Point Cook, had 52,253). It was time to split into smaller SA2s – which indeed happened shortly thereafter with the new 2016 boundaries (ditto Point Cook). So it was probably the fastest growing SA2 more because the ABS had not yet split it into smaller SA2s. Unfortunately this issue isn’t always picked up by the ABS and the media. Technical note: until 2001 the maps shows SA2s on 2011 boundaries and then from 2002 onwards the map shows 2016 boundaries. There were several SA2s that split with the 2016 boundaries, mostly in the northern suburbs. You can see many of Melbourne’s middle suburbs (particularly 10-15 km) saw population decline around 1992 to 1995 while Victoria was under economic stress (but also Australia’s total population growth rate fell below 1% during this period). Most of Melbourne’s outer growth areas are 20+ km from the CBD, and you can see reasonably steady growth in bands that far out and beyond. But within 20 km there was a big population growth slow-down in 2010 and 2011. 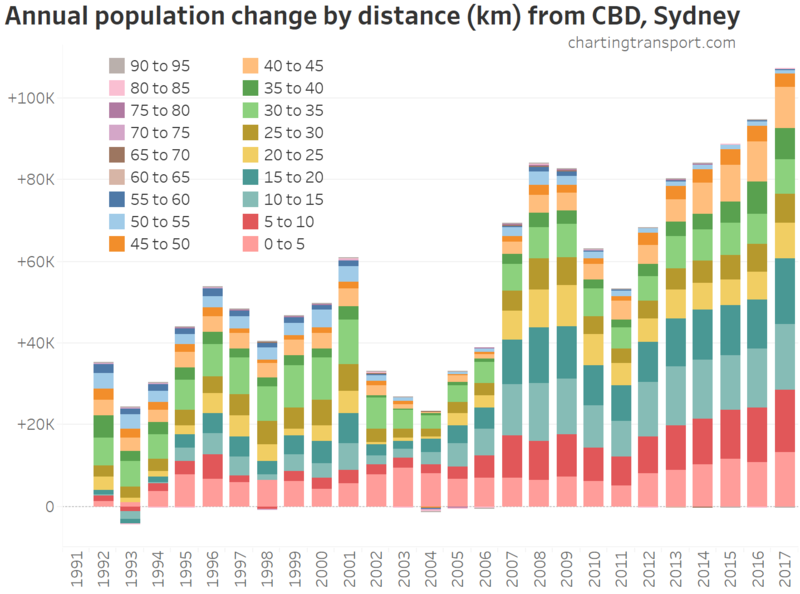 Sydney’s population growth has also varied considerably between years, but the most consistent band for population growth is within 5 km of the CBD. Population growth in the inner and middle suburbs has been strong since 2007. Brisbane seems to have been a mixed bag. There’s been growth on the fringe to the north and south-west. From around 2002 there was an increase in central city population growth, with a particularly strong surge in 2003 and 2017. Perth is an interesting story. Apart from the mining boom years 2007 to 2013, most of the population growth has been through urban sprawl. 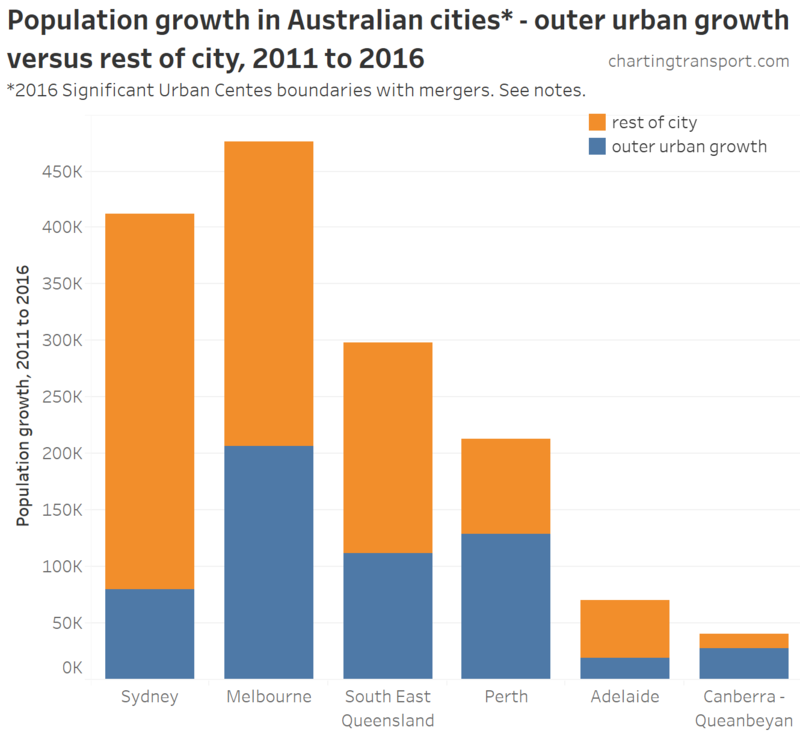 During the mining boom the central and inner suburbs saw substantial population growth (along with the fringe), but since 2014 that’s crashed and there was substantial population decline in the inner and middle suburbs, particularly 10-15 km out from the CBD in 2016. Adelaide saw substantial population decline in the inner suburbs in the early 1990s, with instead sprawl to the south and north. Things were quieter around the turn of the century before population growth rose around 2005, with quite significant inner suburban population growth, but still plenty of sprawl on the fringe. In the early 1990s, population growth was mostly in the far north and south. Then at the turn the century the south quietened down and Queanbeyan West – Jerrabomberra had a growth spurt. 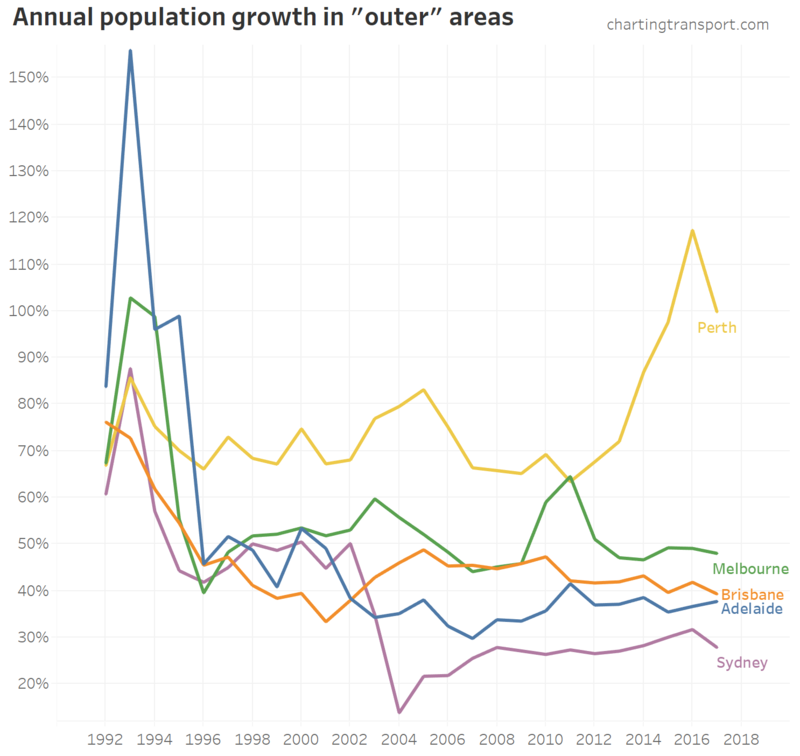 Growth in the outer north took off around 1995. Infill growth took off around 2007, particularly in Belconnen, Bruce, Civic and Kingston – Barton. And then from around 2014 a brand new growth front opened in the west (Wright and Coombs). Note: I’ve used a different scale for the bubbles. because of the smaller changes and smaller geography. 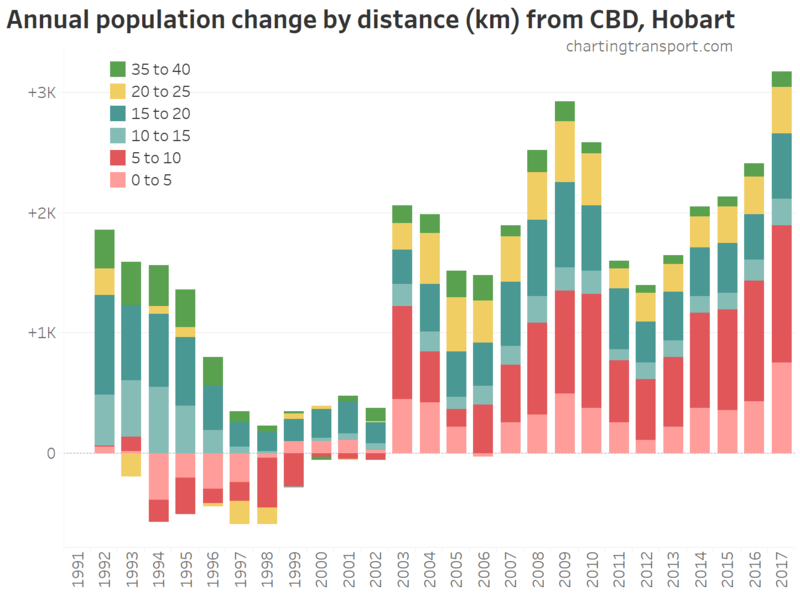 Hobart had net population decline in the late 1990s but then grew quickly from 2003 onwards, with particularly strong growth in 2009 and 2017. 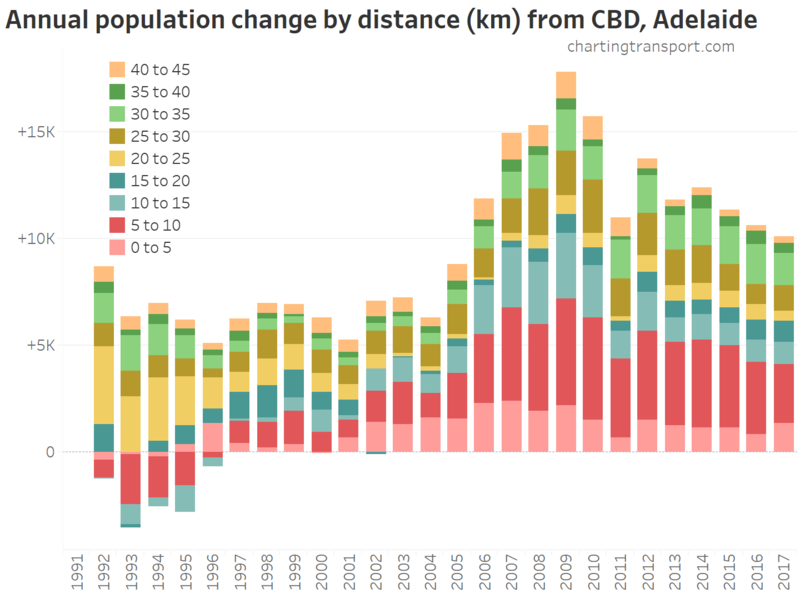 The majority of population growth in recent years has been within 10km of the CBD. No, a new gigantic dense rectangular city has not emerged in the north-west of Western Australia. That’s an artefact of coloured maps and large geographic zones. The “East Pilbara” SA2 population simply grew from 2441 to 6789, which is 178% growth. But the 2017 average density was 0.00017 persons per hectare. Otherwise places of higher percentage growth are mostly around the major cities. Population decline is common in most inland/outback areas. I hope this has provided you some new insights on population growth around Australia. My next post will look at the urban growth areas of large cities in more detail. 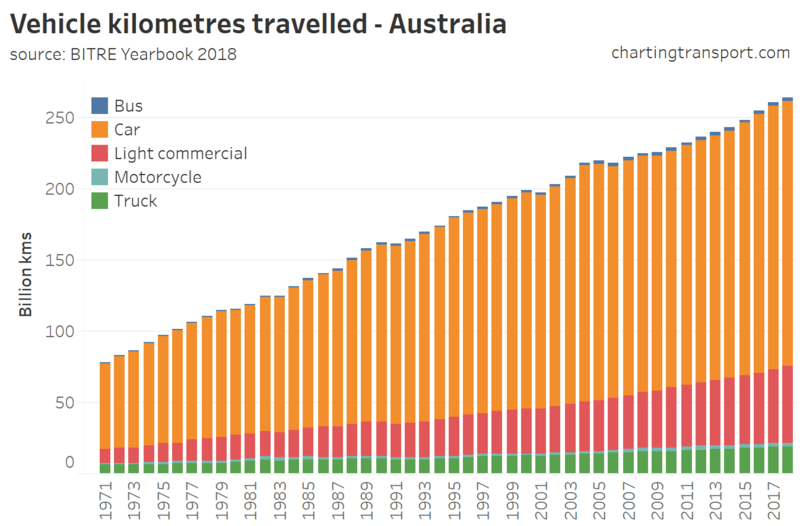 Each year, just in time for Christmas, the good folks at the Australian Bureau of Infrastructure, Transport, and Regional Economics (BITRE) publish a mountain of data in their Yearbook. 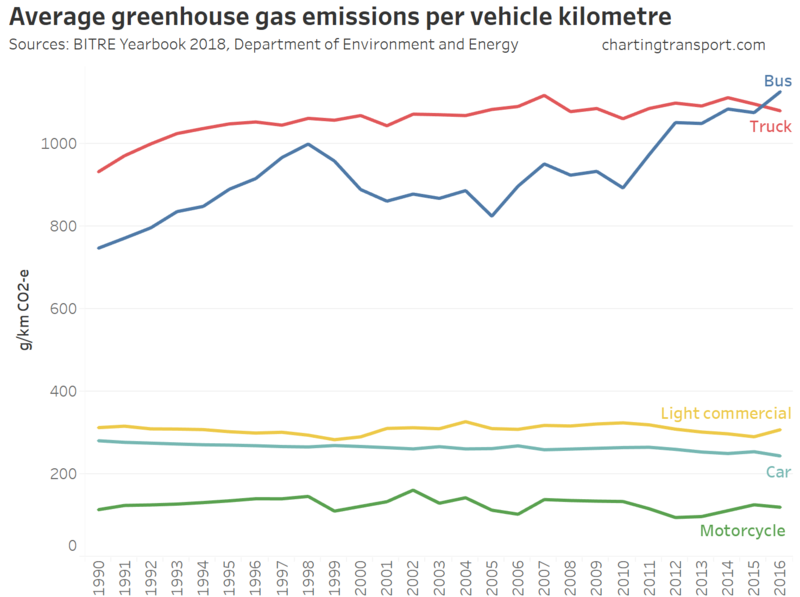 This post aims to turn those numbers (and some other data sources) into useful knowledge – with a focus on vehicle kilometres travelled, passenger kilometres travelled, mode shares, car ownership, driver’s licence ownership, greenhouse gas emissions, and transport costs. 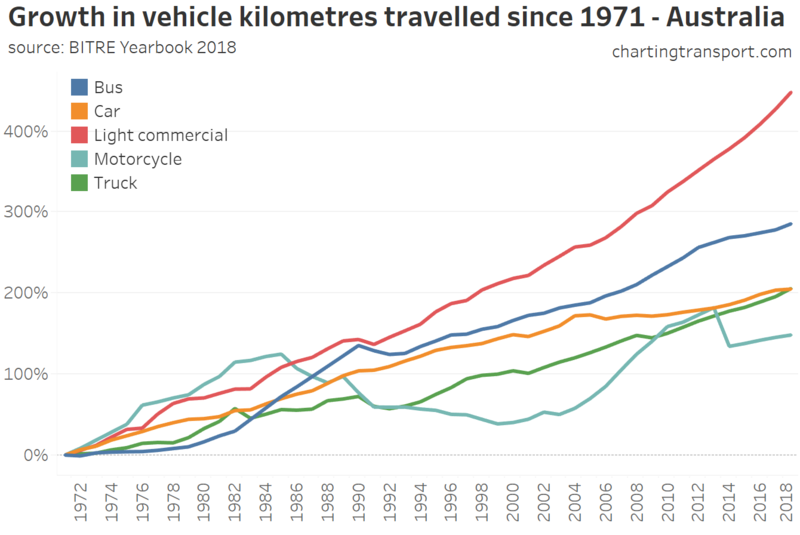 Light commercial vehicle kilometres have grown the fastest, curiously followed by buses (although much of that growth was in the 1980s). 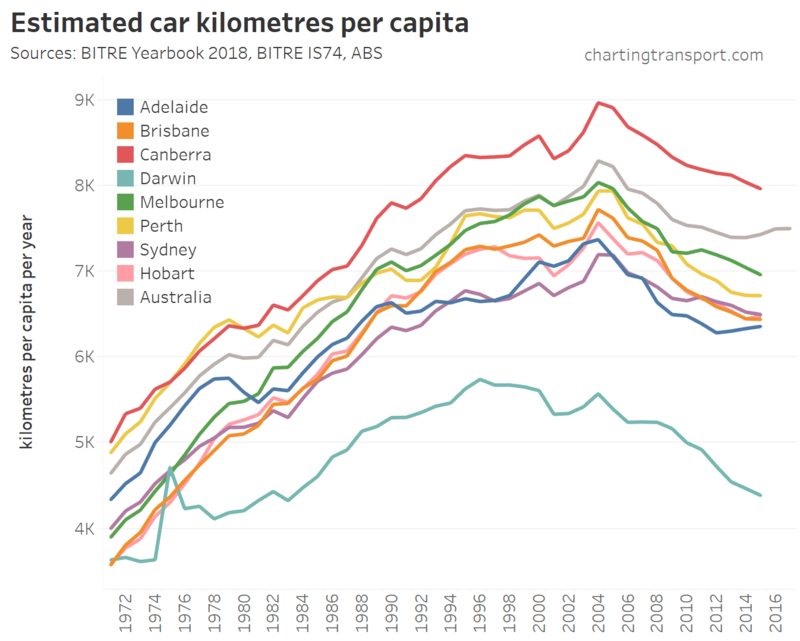 Car kilometre growth has slowed significantly since 2004. 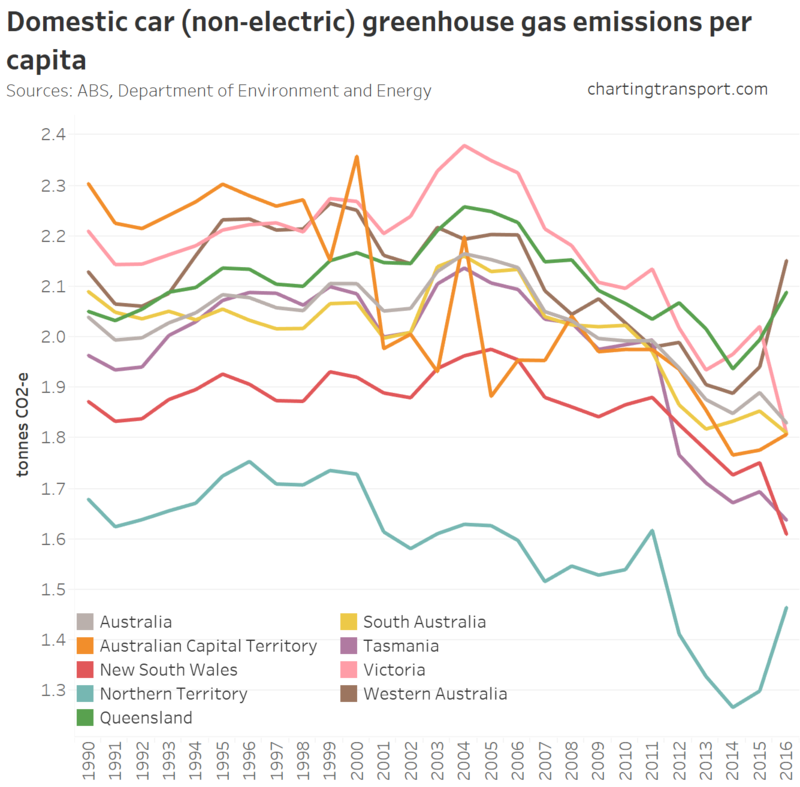 Technical note: “Australia” lines in these charts represent data points for the entire country (including areas outside capital cities). Darwin has the lowest average which might reflect the small size of the city. 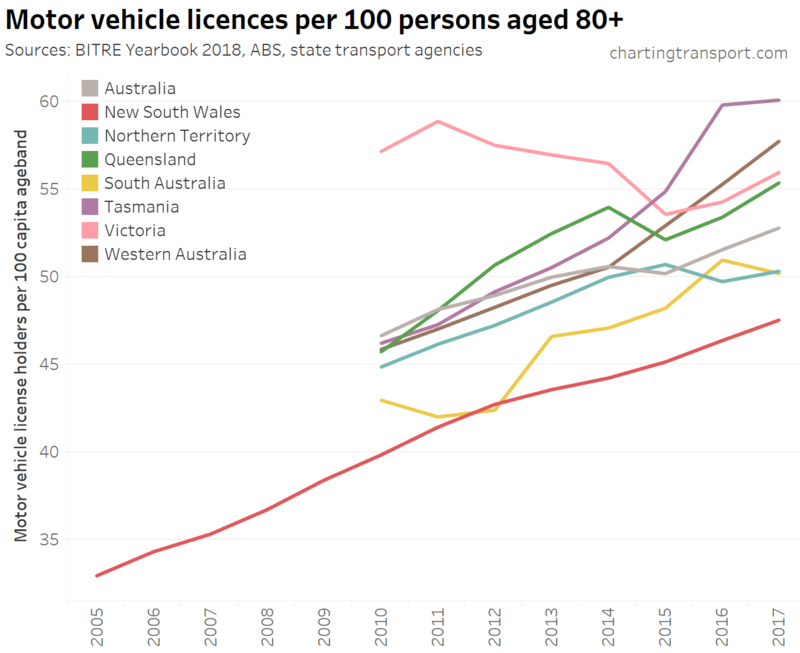 The blip in 1975 is related to a significant population exodus after Cyclone Tracey caused significant destruction in late 2014 (the vehicle km estimate might be on the high side). 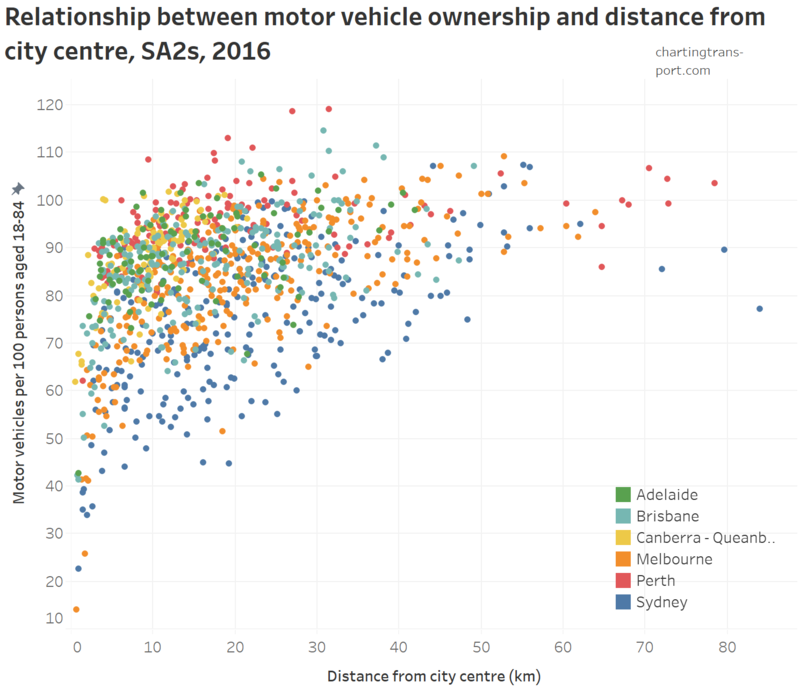 Canberra, the most car dependent capital city, has had the highest average car kilometres per person (but it might also reflect kilometres driven by people from across the NSW border in Queanbeyan). 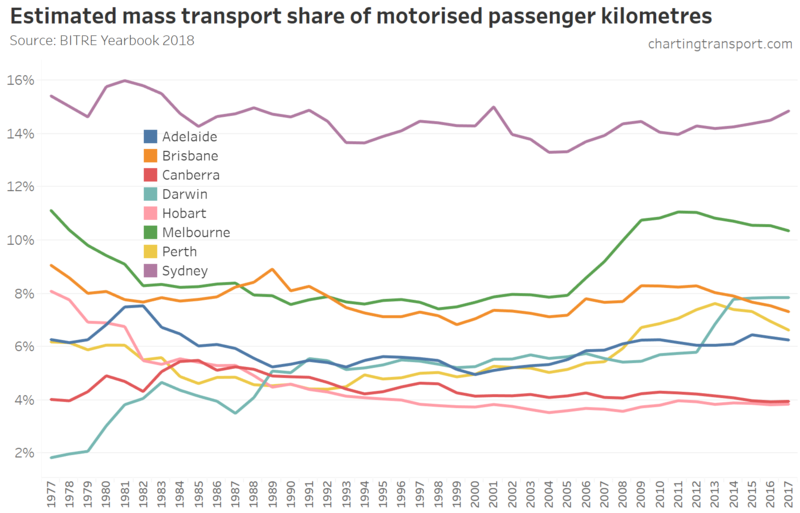 The Australia-wide average is higher than most cities, with areas outside capital cities probably involving longer average car journeys and certainly a higher car mode share. 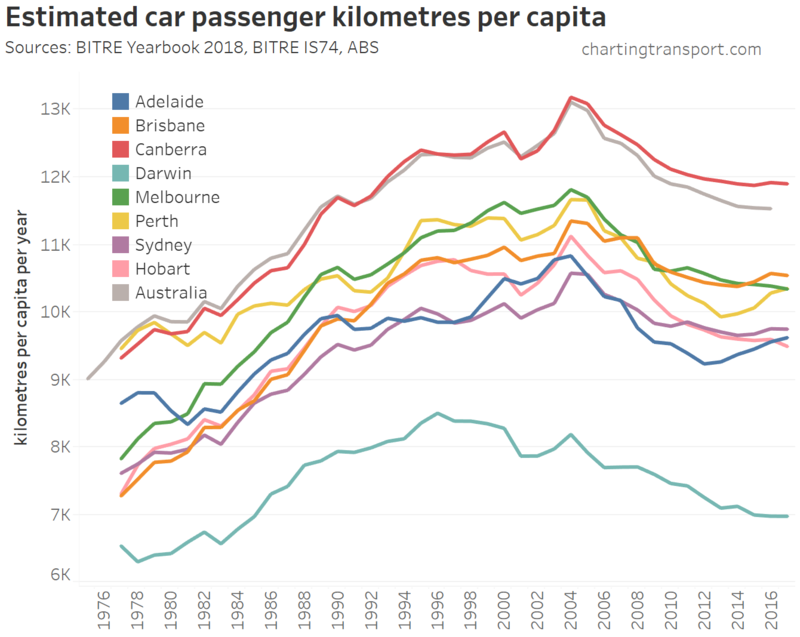 While car passenger kilometres per capita also peaked in 2004, they have increased slightly in recent years in Perth, Adelaide, Brisbane, and Sydney. BITRE also produce estimates of passenger kilometres for other modes (data available up to 2017 at the time of writing). 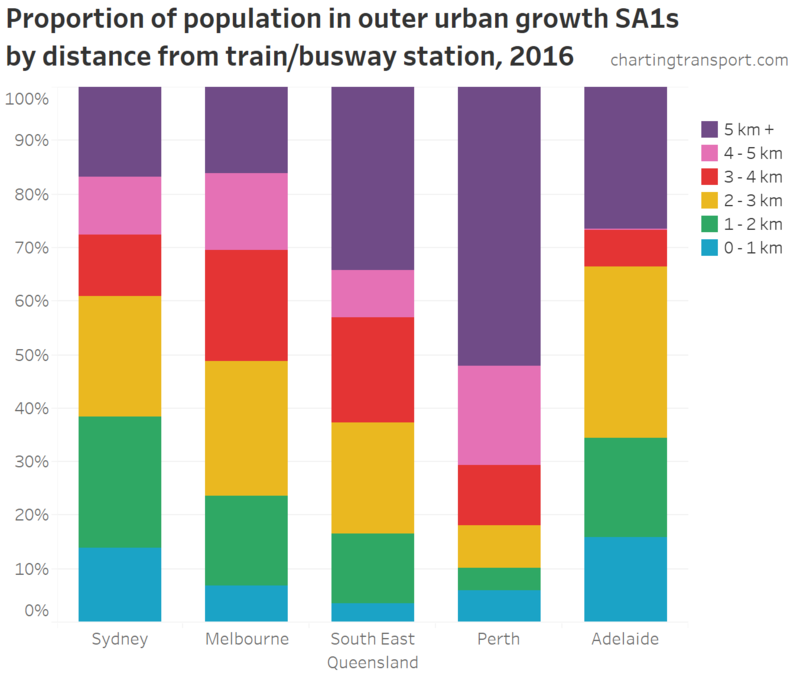 Rail use is highest in Sydney followed by Melbourne. You can see two big jumps in Perth following the opening of the Joondalup line in 1992 and the Mandurah line in 2007. 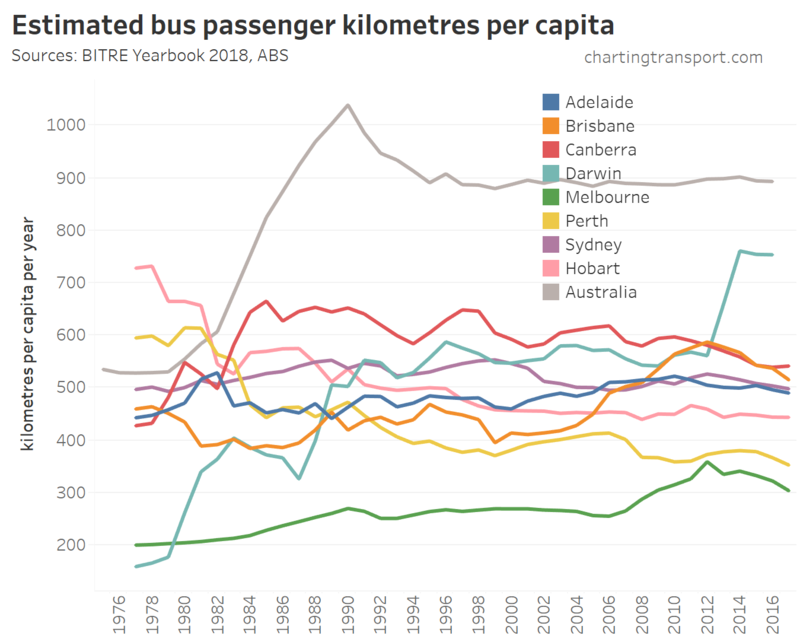 Australia-wide bus usage is surprisingly high. While public transport bus service levels and patronage would certainly be on average low outside capital cities, buses do play a large role in carrying children to school – particularly over longer distances in rural areas. The peak for bus usage in 1990 may be related to deregulation of domestic aviation, which reduced air fares by around 20%. Darwin saw a massive increase in bus use in 2014 thanks to a new nearby LNG project running staff services, while investments in increased bus services in Melbourne and Brisbane in the first decade of this century led to significant patronage growth. 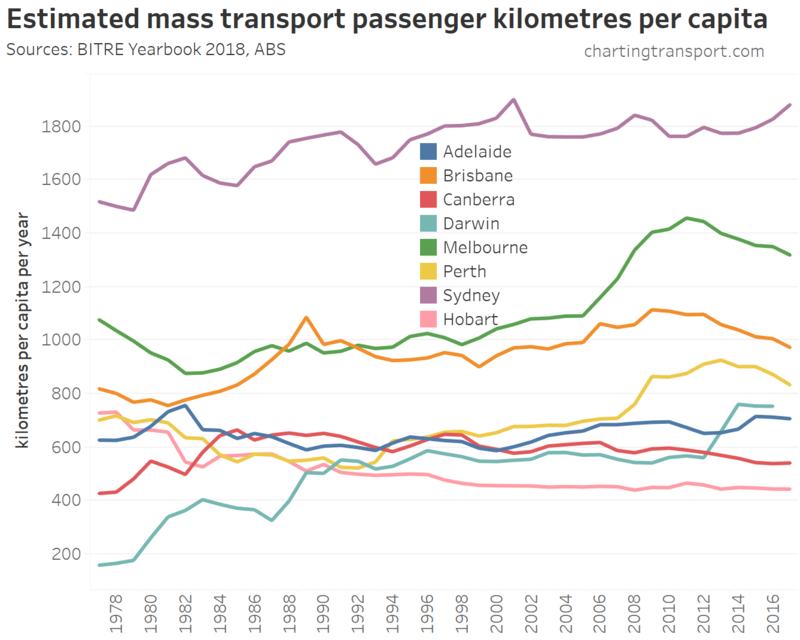 Sydney has maintained the highest mass transit mode share, while Melbourne made significant gains between 2005 and 2009, and Brisbane also grew strongly 2007 to 2013. 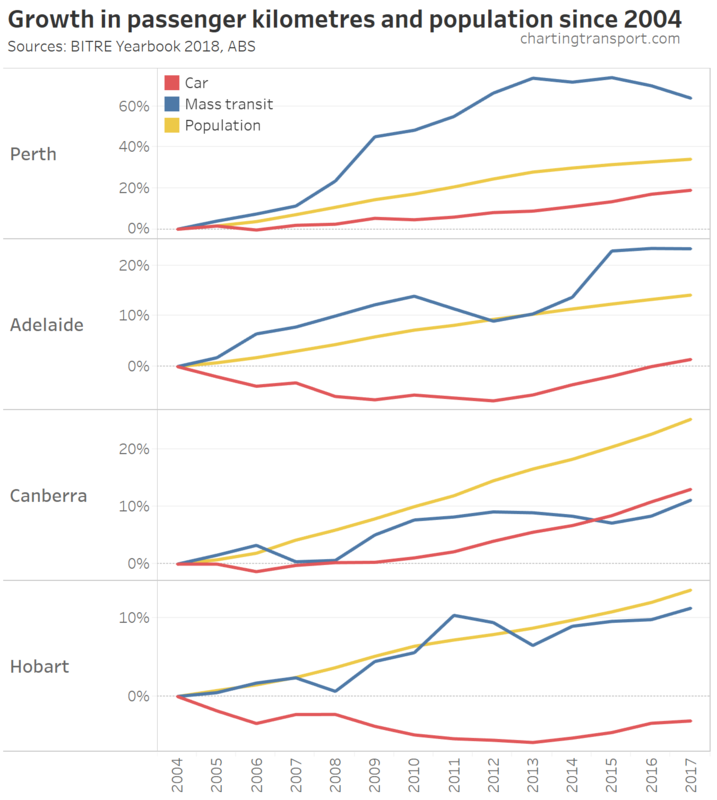 Mass transit use has grown much faster than car use in Australia’s three largest cities. In Sydney and Melbourne it has exceeded population growth also. 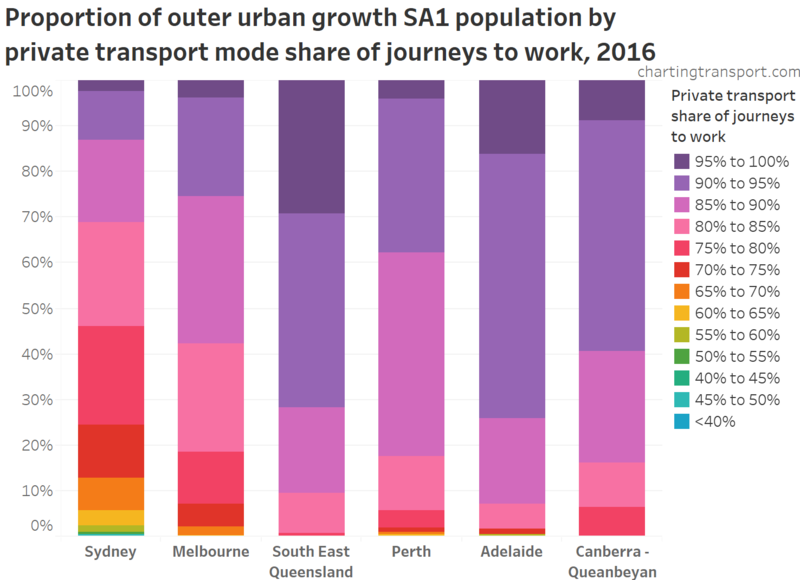 In Canberra, both car and mass transit use has grown much slower than population, and it is the only city where car growth exceeded public transport growth between 2004 and 2017. 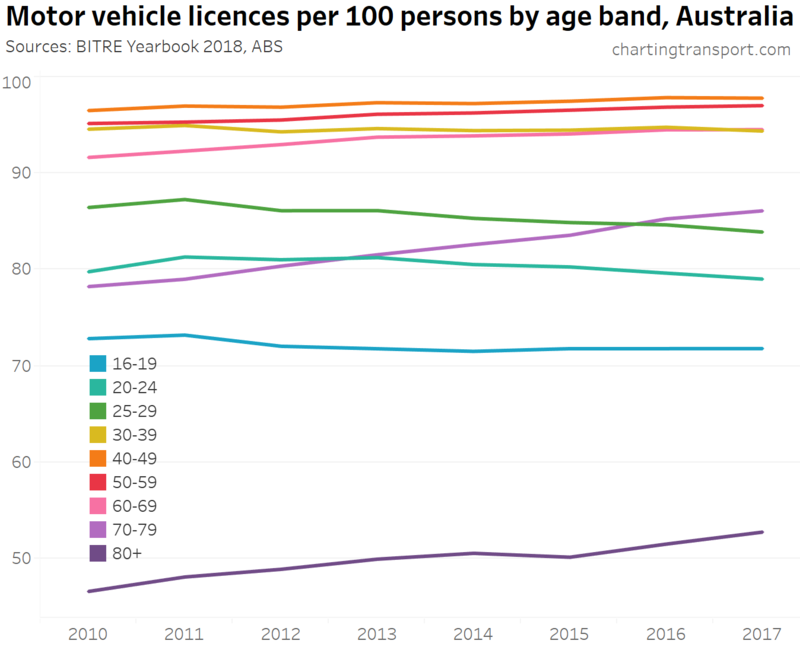 The ABS regularly conduct a Motor Vehicle Census, and the following chart includes data up until January 2018. Technical note: Motor Vehicle Census data (currently conducted in January each year) has been interpolated to produce June estimates for each year. 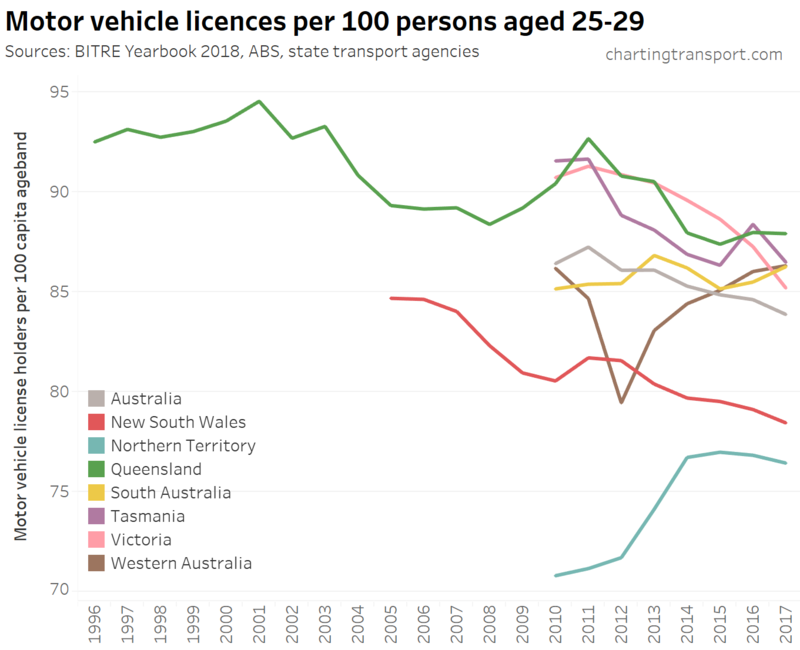 Car ownership has continued to rise slowly in all states – except Victoria, which is consistent with a finding of declining motor vehicle ownership in Melbourne from census data (see also an older post on car ownership). 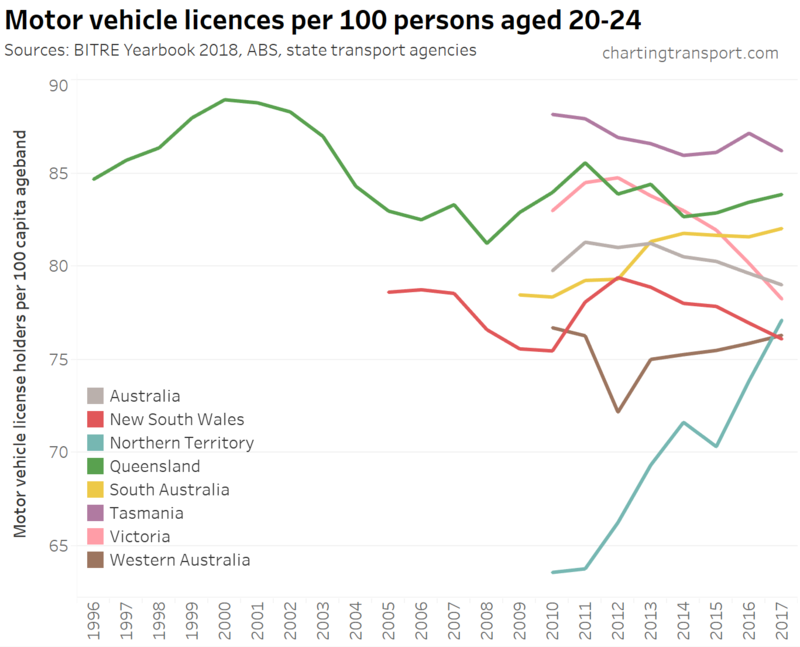 Technical note: the ownership rate is calculated as the sum of car, motorbike and truck licenses – including learner and probationary licences, divided by population. 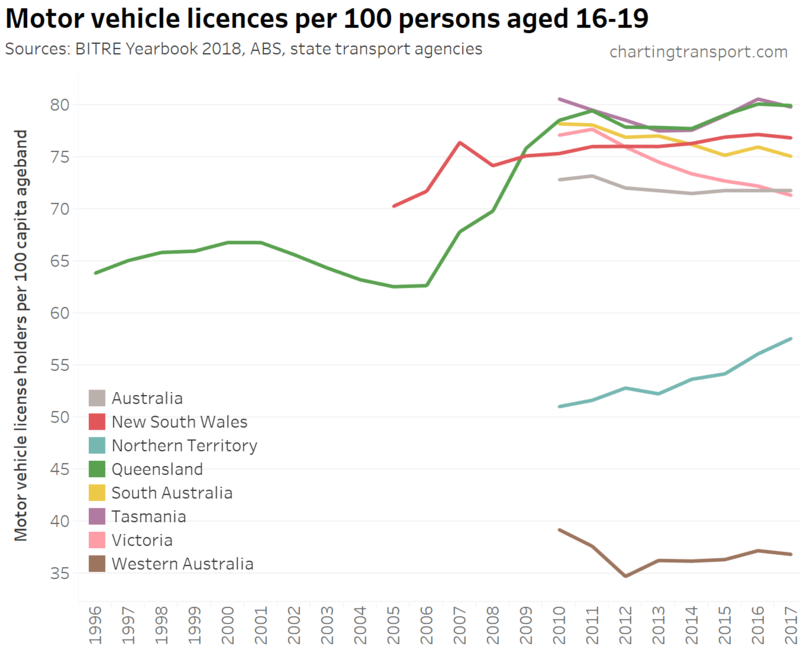 Some people have more than one driver’s licence so it’s likely to be an over-estimate of the proportion of the population with a licence. There’s been slowing growth over time, but Victoria has seen slow decline since 2011. 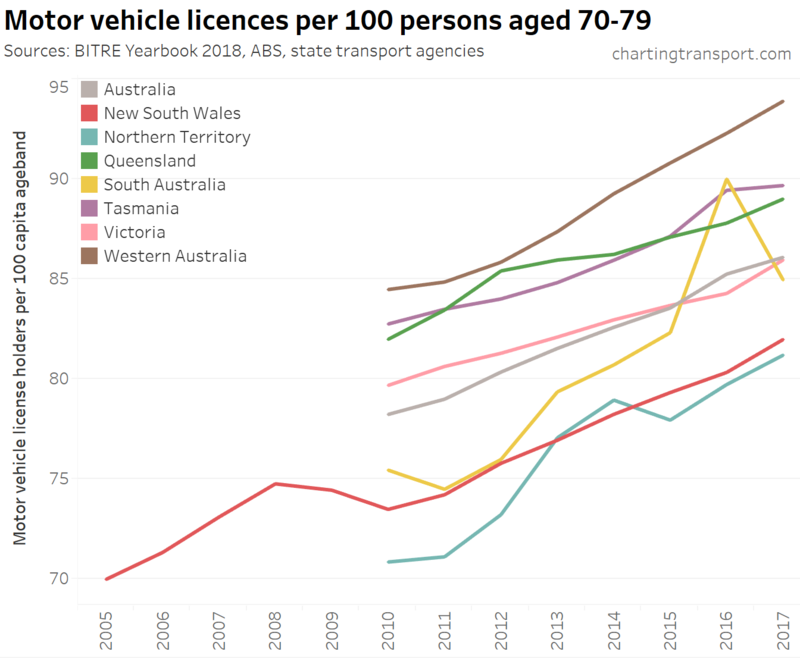 Motor vehicle licence ownership rates have increased for people over 70 (presumably due to a healthier ageing population), and declined for people under 30. 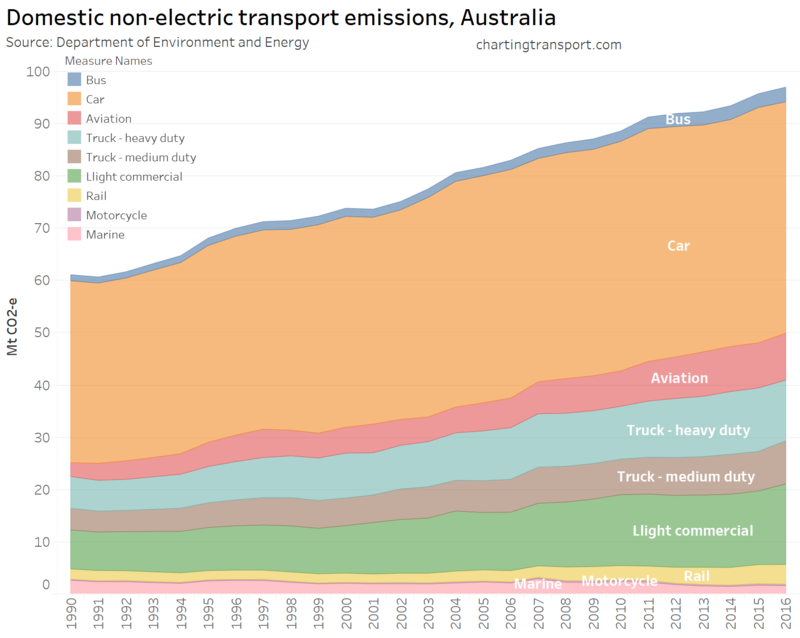 Depending on how you disaggregate total emissions, transport is the second largest sector and the fastest growing. Domestic aviation has had the fastest growth, followed by buses. 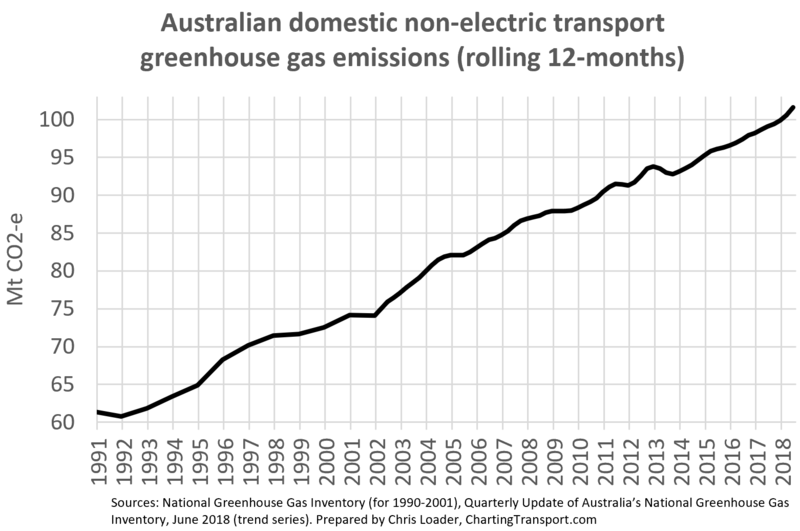 In more recent years rail emissions have grown strongly (note: most of this is rail freight as the vast majority of passenger train movements are electric). 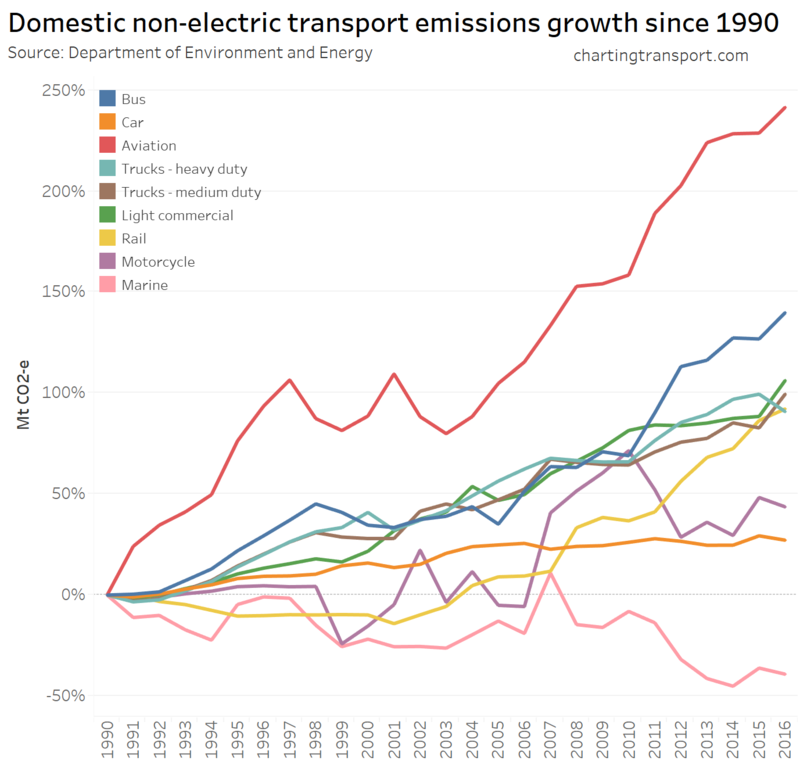 Car emissions have grown 27%, but make up the largest share of transport emissions. In 2016 there were sharp increases in Western Australia, Queensland and the Northern Territory, while most other states appear to be on a downward trend. Of course if we are to avoid dangerous climate change, total emissions need to reduce substantially, not just per capita emissions! 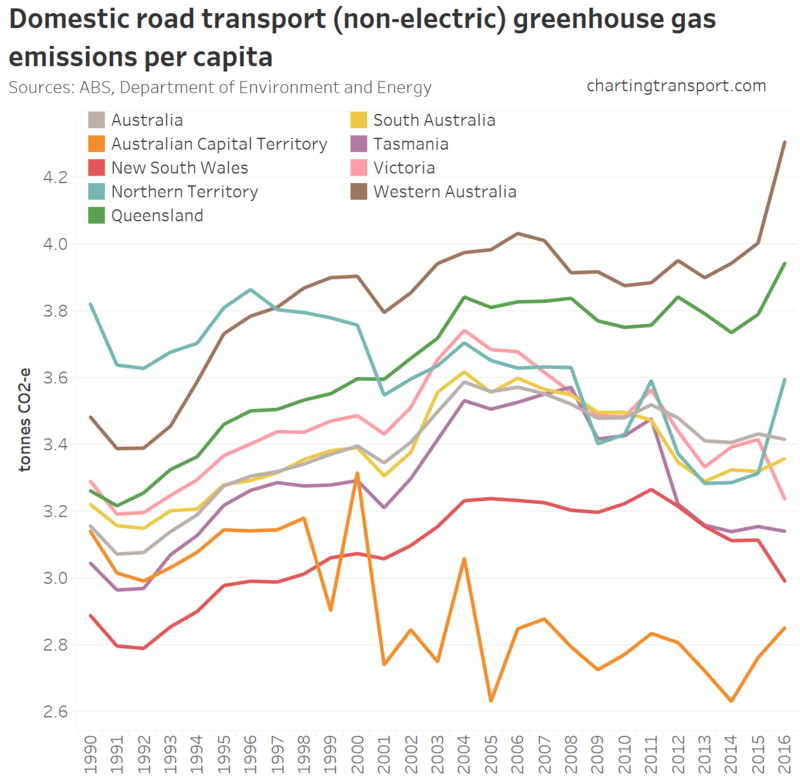 It’s difficult to see any significant reductions in emissions intensity, while average bus emissions intensity has increased recently (not sure why). 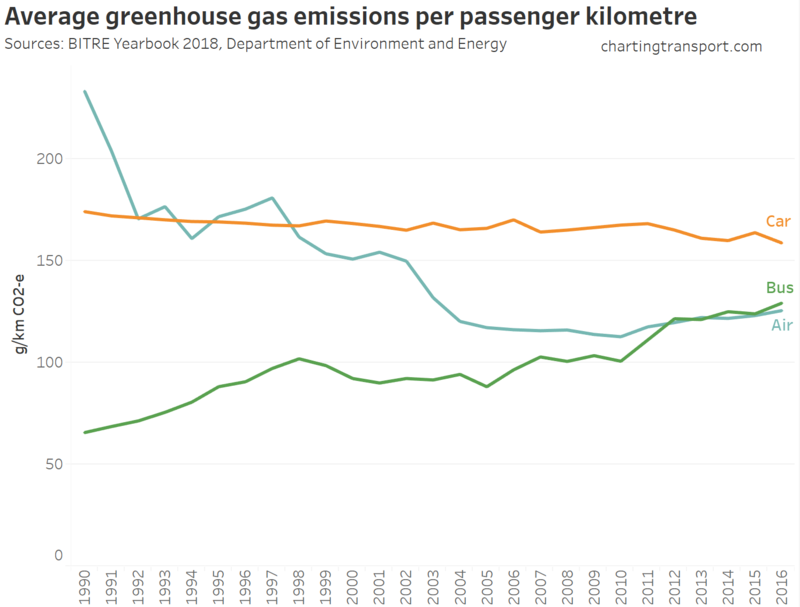 Average car emissions have fallen slightly from 281 g/km in 1990 to 244 g/km in 2016. Of course the emissions per passenger kilometres of a bus or plane will depend on occupancy – a full aeroplane or bus will have likely have significantly lower emissions per passenger km. Indeed, the BITRE figures imply an average bus occupancy of around 9 people (typical bus capacity is around 60) – so a well loaded bus should have much lower emissions per passenger km. The operating environment (city v country) might also impact car and bus emissions. On the aviation side, BITRE report a domestic aviation average load factor of 78% in 2016-17. Technical note: Private motoring is a combination of factors, including motor vehicle retail prices and automotive fuel. Urban transport fares include public transport as well as taxi/ride-share. The cost of private motoring has tracked relatively close to CPI, although has been trending down since around 2008. The real cost of motor vehicles has plummeted since 1996. 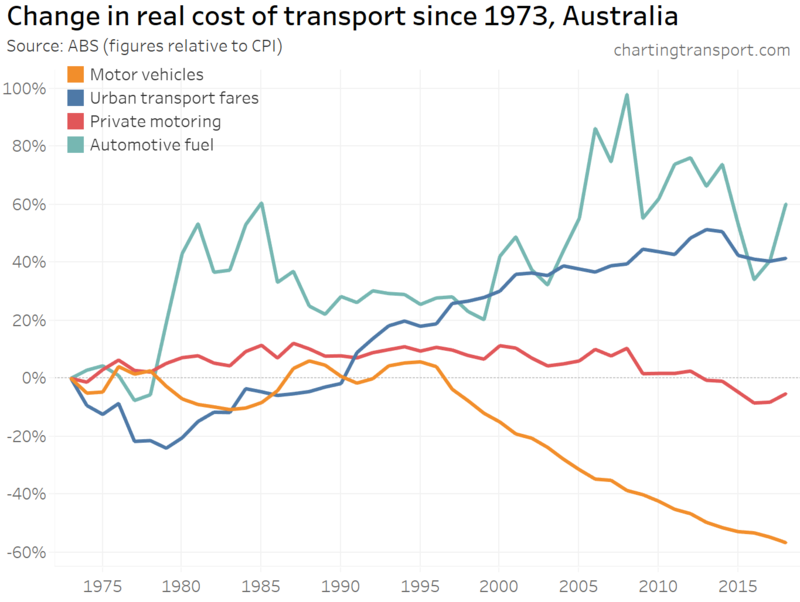 Urban transport fares have been increasing faster than CPI since the late 1970s. 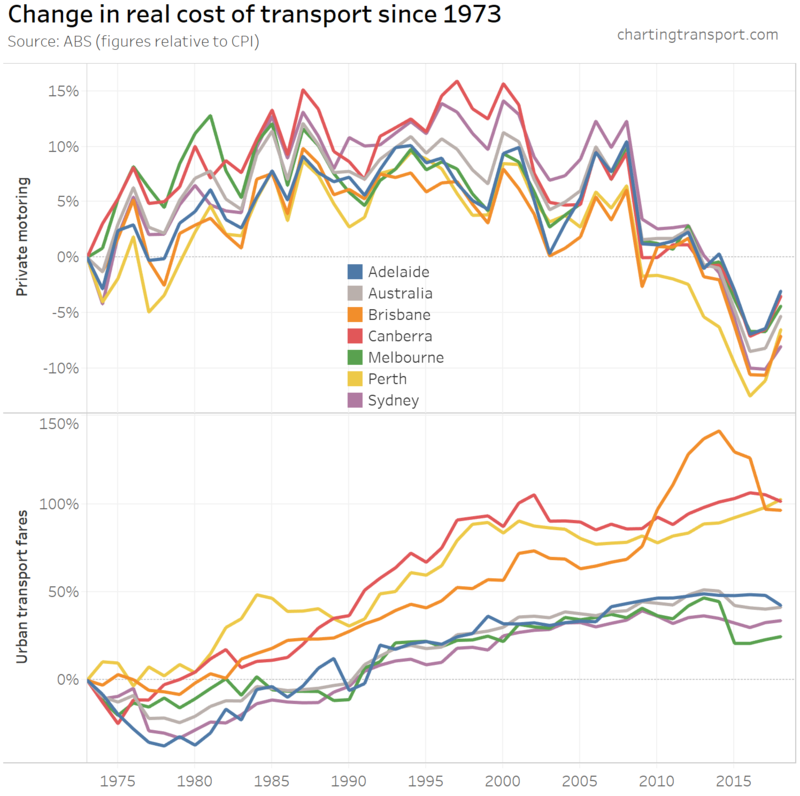 Urban transport fares have grown the most in Brisbane, Perth and Canberra – relative to 1973. What’s most relevant is the relative change between years – eg. 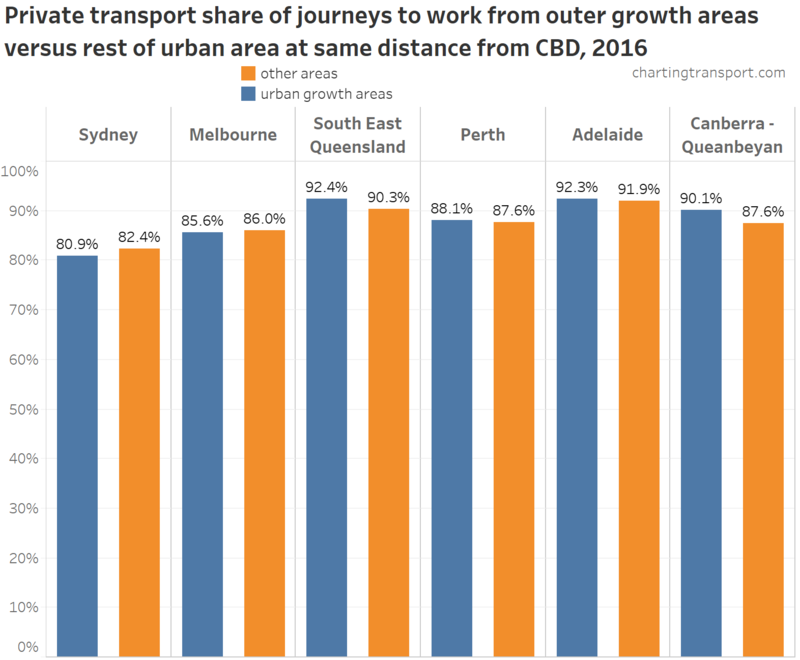 you can see Brisbane’s experiment with high urban transport fare growth between 2009 and 2017 in both charts. 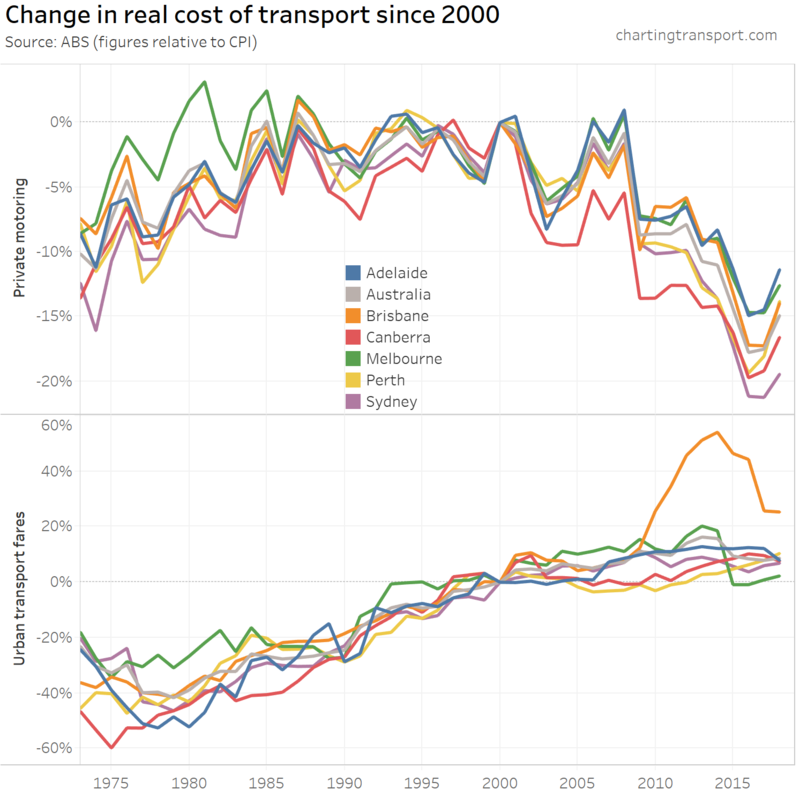 Hopefully this post has provided some useful insights into transport trends in Australia. A future post might examine the relationships between the data sets further. 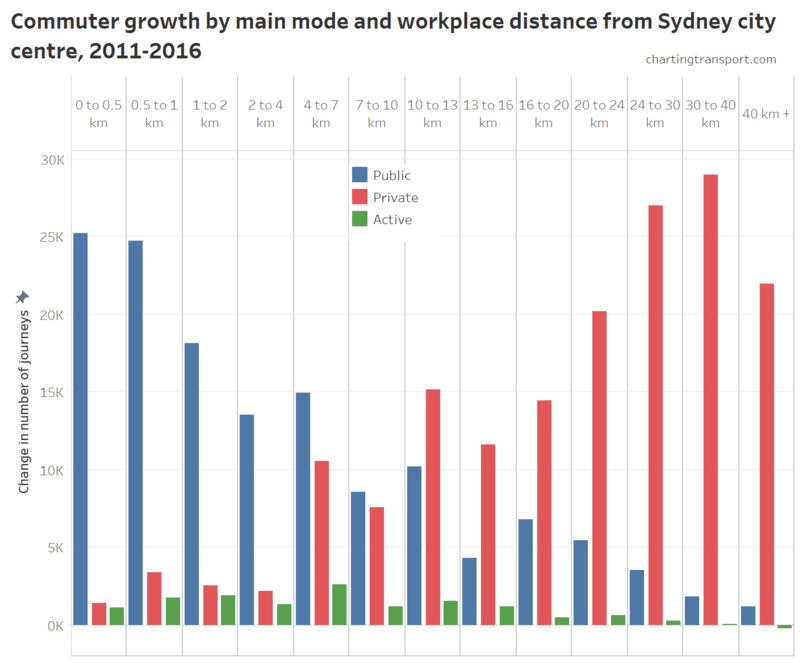 Over a quarter of Sydney commuters (26.3%) went to work by public transport in 2016, the highest rate of Australian cities, and an increase of 3.0% on 2011. 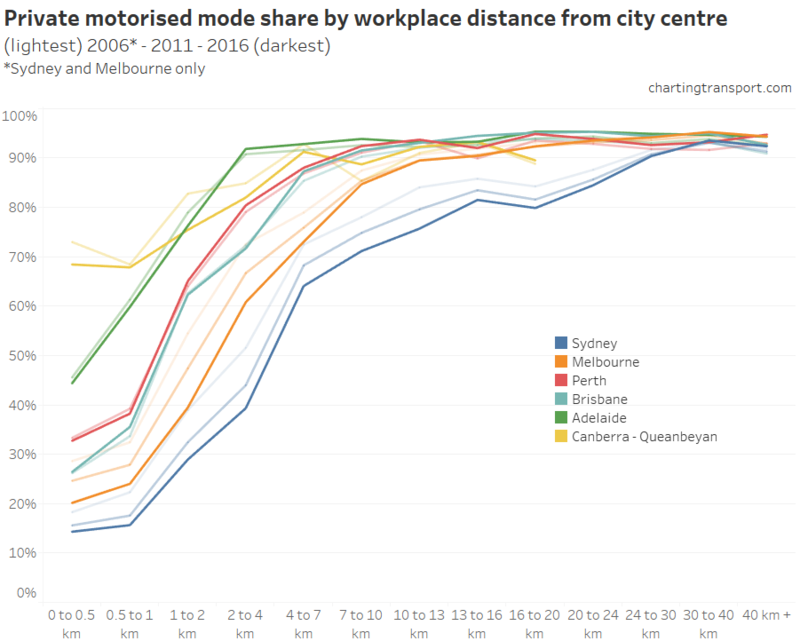 This post provides an overview of mode shares and mode shifts across Sydney from 2006 to 2016 (following on from my previous analysis of Melbourne and Brisbane). 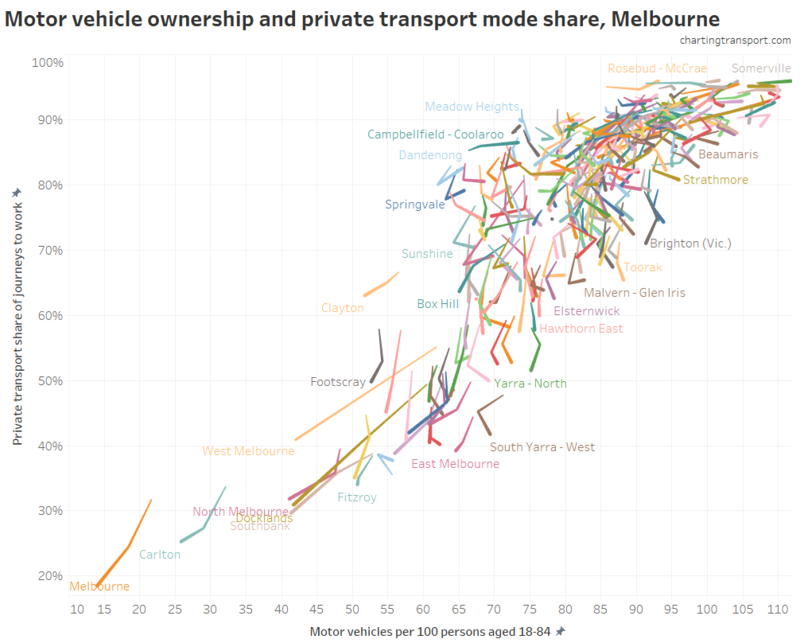 I’m going to mostly look at trends in private motorised transport mode shares, as it is generally the least space-efficient and most polluting method of travel on a per person basis, and many cities aim to shift people away from private transport to active or public transport. You can see lower private mode shares in the inner city and around train lines, as you might expect. In many places private transport accounts for a minority of commuters. 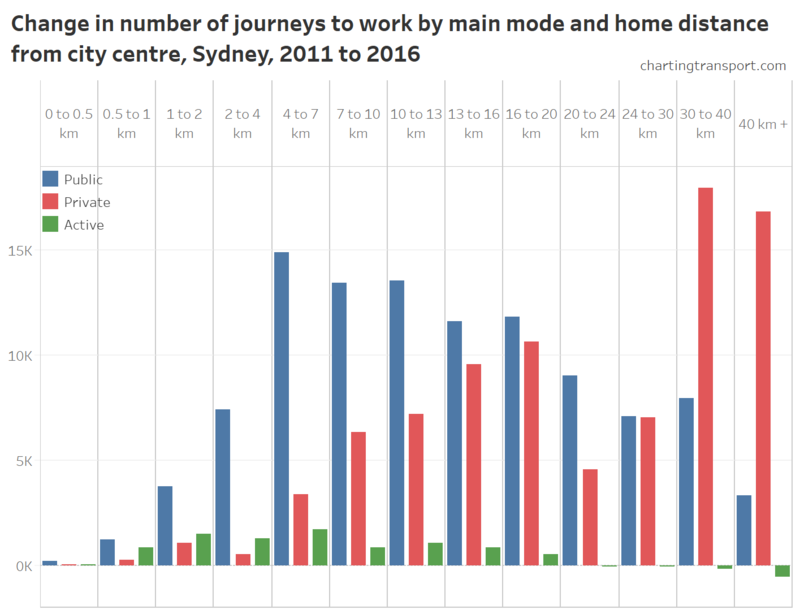 There were significant mode shifts away from private transport almost all over Sydney, but particularly strong in the inner south, inner west, north shore and hills area, including many areas served only by buses for public transport. 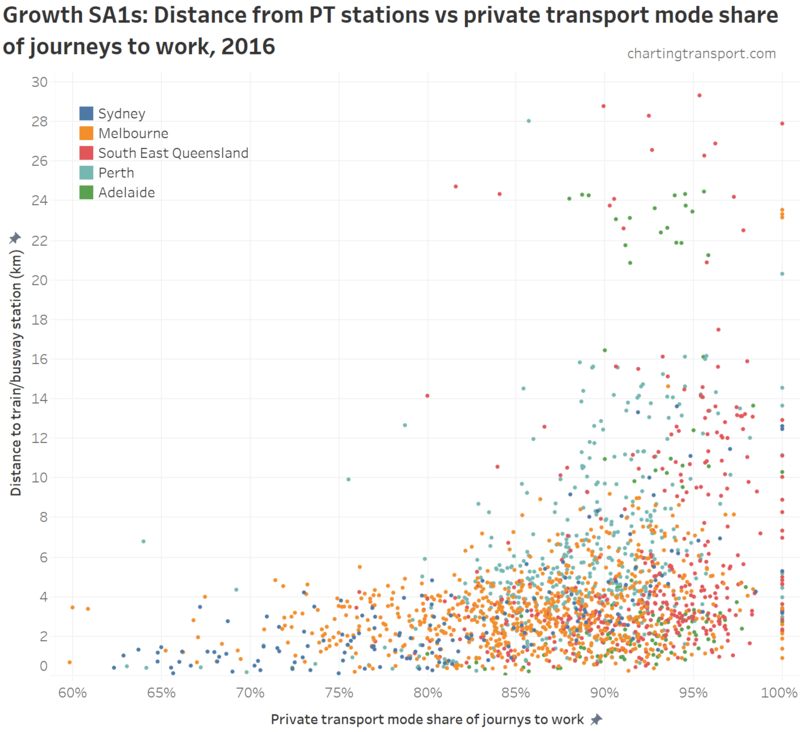 Private transport dominated new commuters in the outer western suburbs. 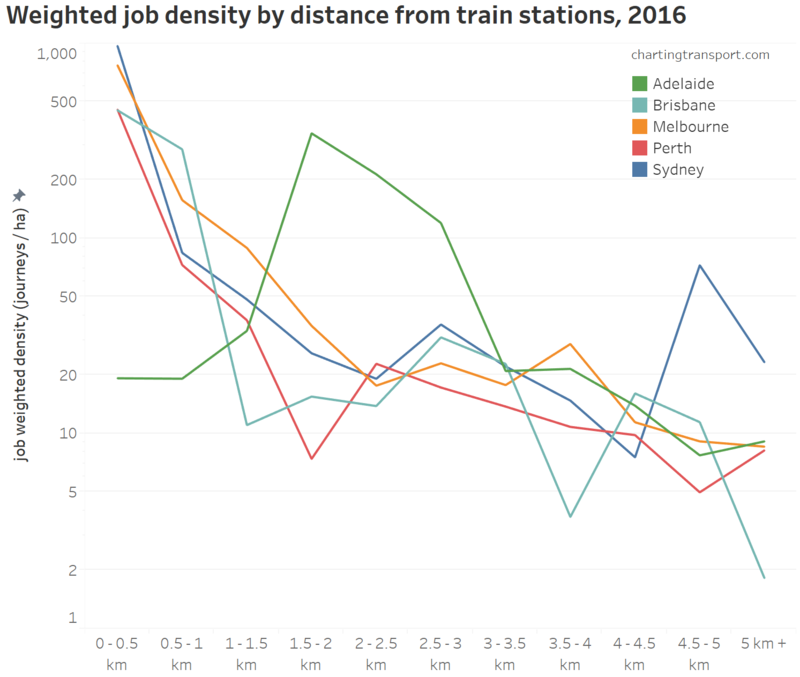 Compared to other cities, a smaller proportion of new commutes came from the outer fringe, which may partly explain why Sydney had the strongest mode shift to public transport. 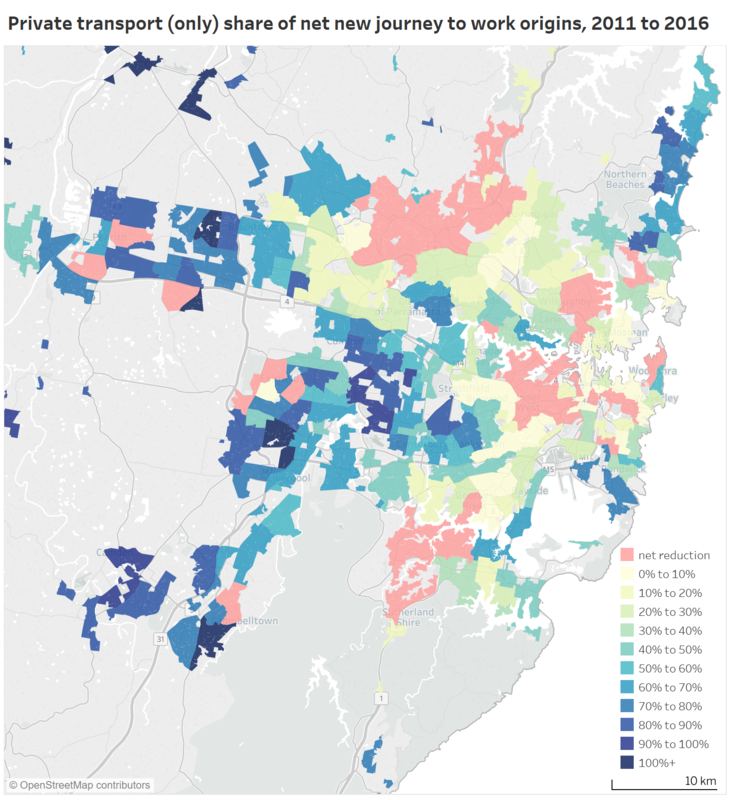 In many parts of Sydney there was an absolute reduction in the number of private transport journeys to work (pink areas), and many where it represented a small minority. 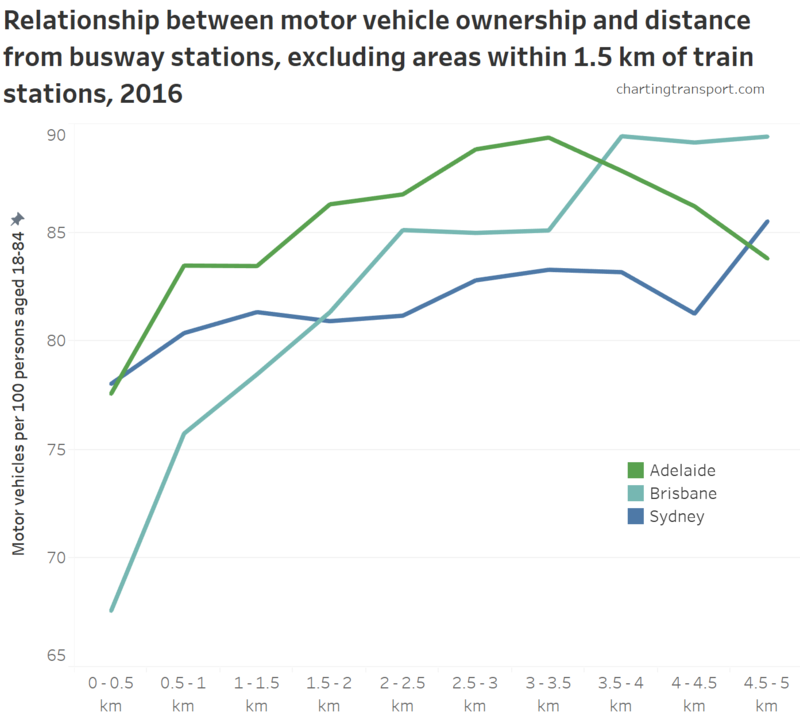 Private transport did however dominate new commutes from most outer western suburbs and the northern beaches. 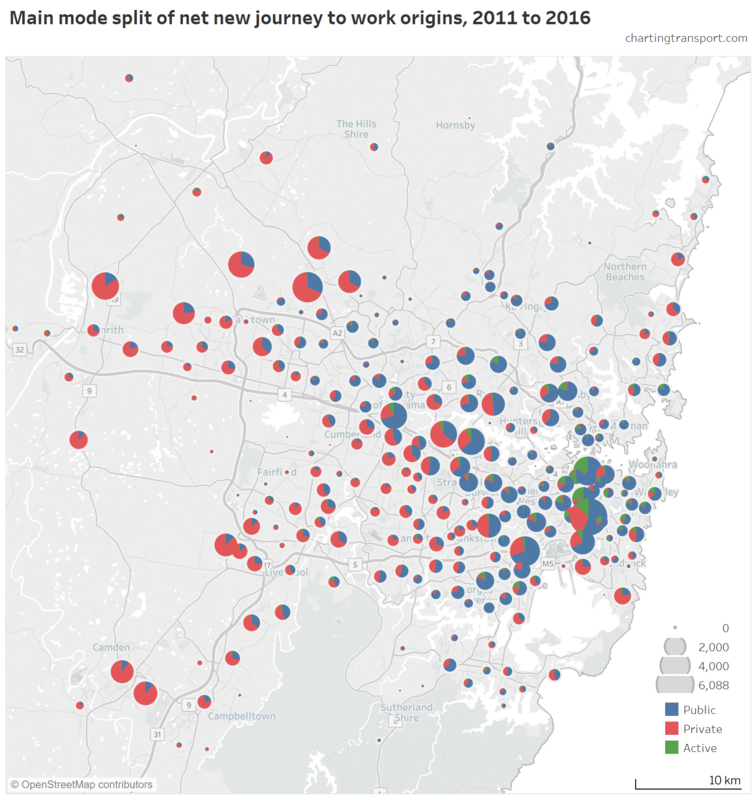 Sydney is distinctly different to the other cities in that there are many major employment centres outside the CBD with quite low private mode shares. 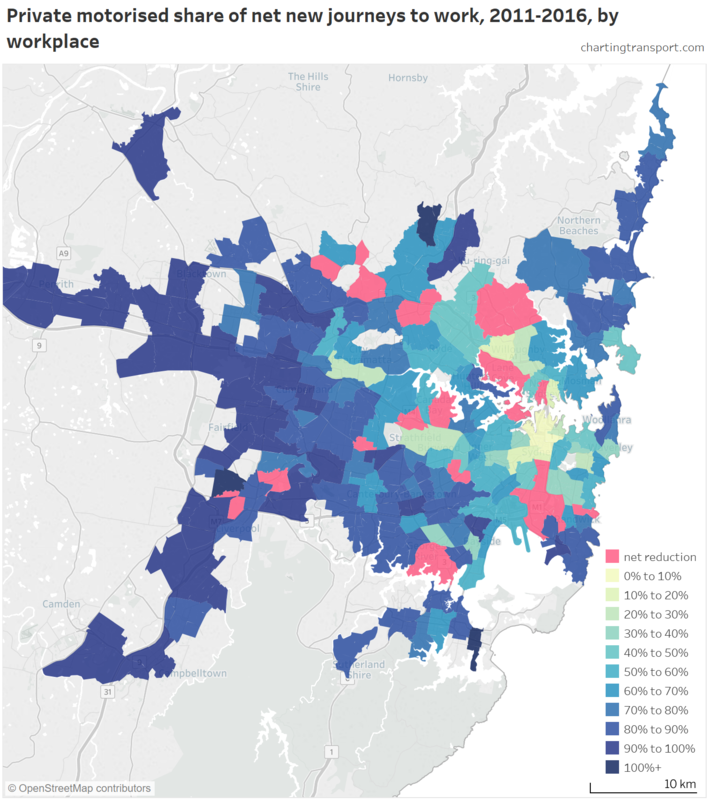 The lowest 2016 private transport mode share destination zone in Macquarie Park was 59%, in Strathfield was 53%, in Manly was 55%, in Parramatta was 40%, in Chatswood was 40%, in St Leonards was 43%, in Bondi Beach was 43%, in Burwood was 46%, in Kensington was 45%, in Bondi Junction was 35%, and in North Sydney was 22%. Refer to my recent post about suburban employment clusters for more on this. The Sydney CBD itself has a destination zone with only 6% private mode share in 2016. 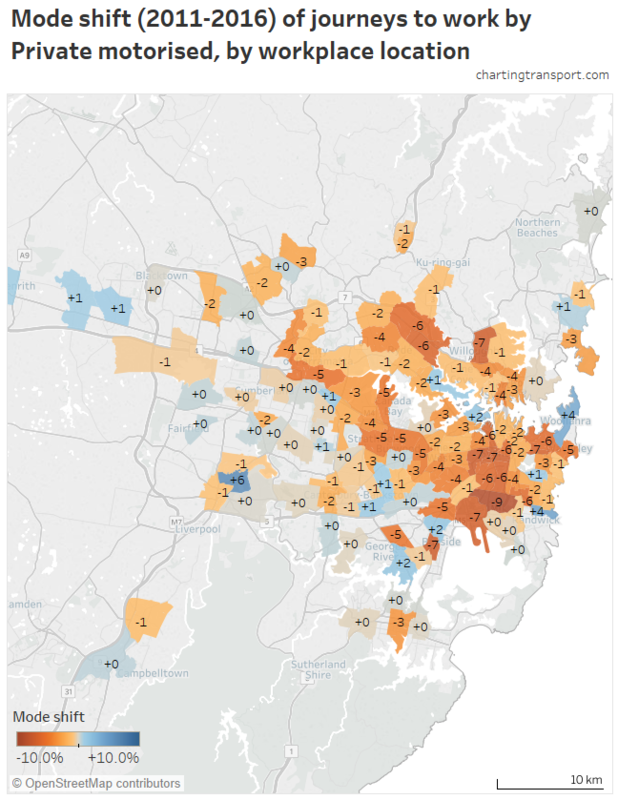 Sub-50% private mode shares stretch out from the CBD as far as Newtown south-west of the CBD. 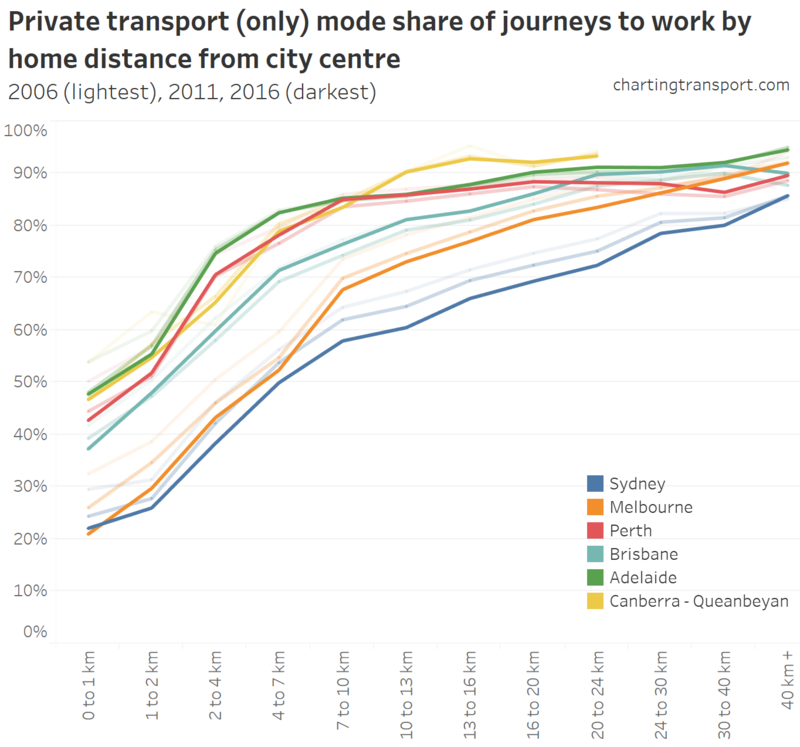 There were significant mode shifts away from private transport across much of Sydney, with the largest in Mascot (-9%, noting that train fares were reduced at stations in Mascot in March 2011), and 7% declines in Sydney Airport, Kogarah, Waterloo – Beaconsfield, Newtown – Camperdown – Darlington, Redfern – Chippendale, Chatswood (East) – Artarmon. 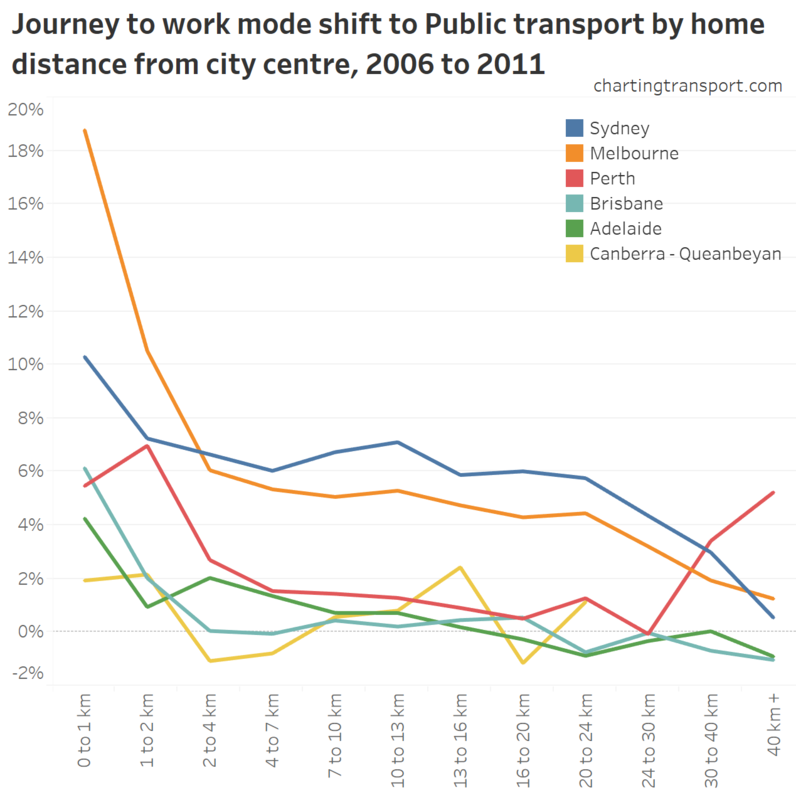 There was a 6% mode shift away from private transport in both North Ryde and Macquarie Park, where new train stations opened in 2009. The Sydney CBD is such a big pie chart it swamps all others with 63,732 new commuters, 86% of which were accounted for by public transport. 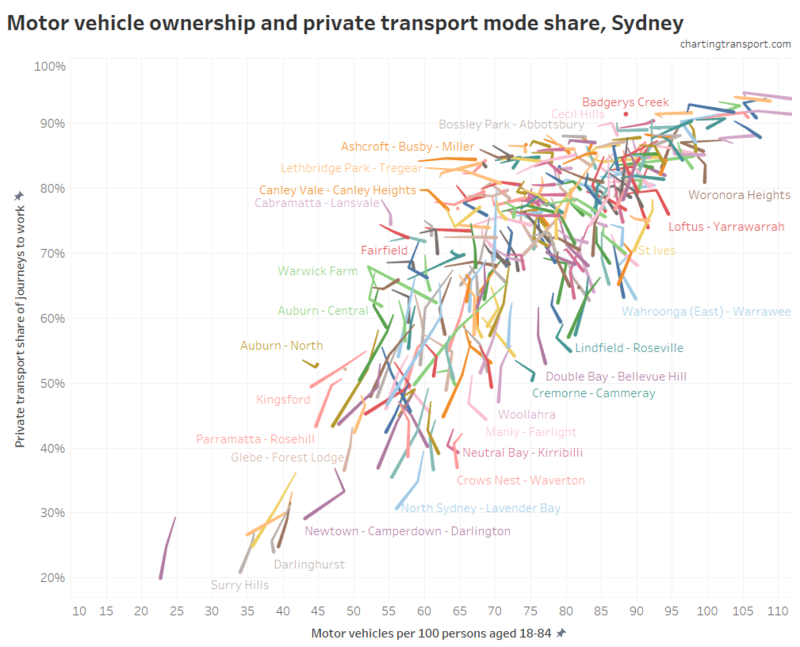 Public transport also dominated in North Sydney – Lavender Bay (which actually had a net reduction in private transport trips), Surrey Hills (88% by public transport) and Pyrmont – Ultimo (84% by public transport). 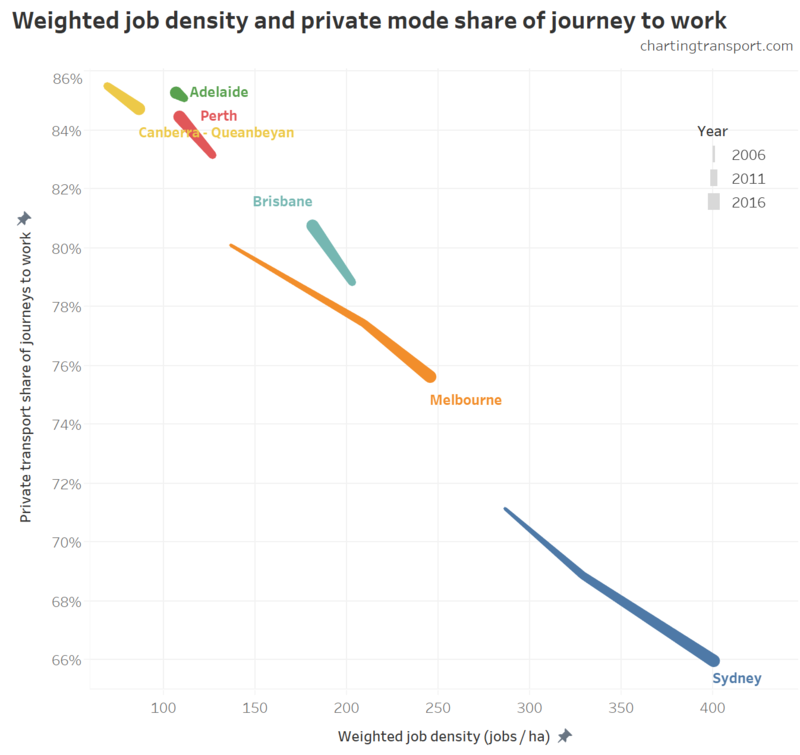 It’s also notable that Sydney’s major regional centres had a significant share of their jobs growth accounted for by public transport trips, as explored in my earlier post on employment clusters. 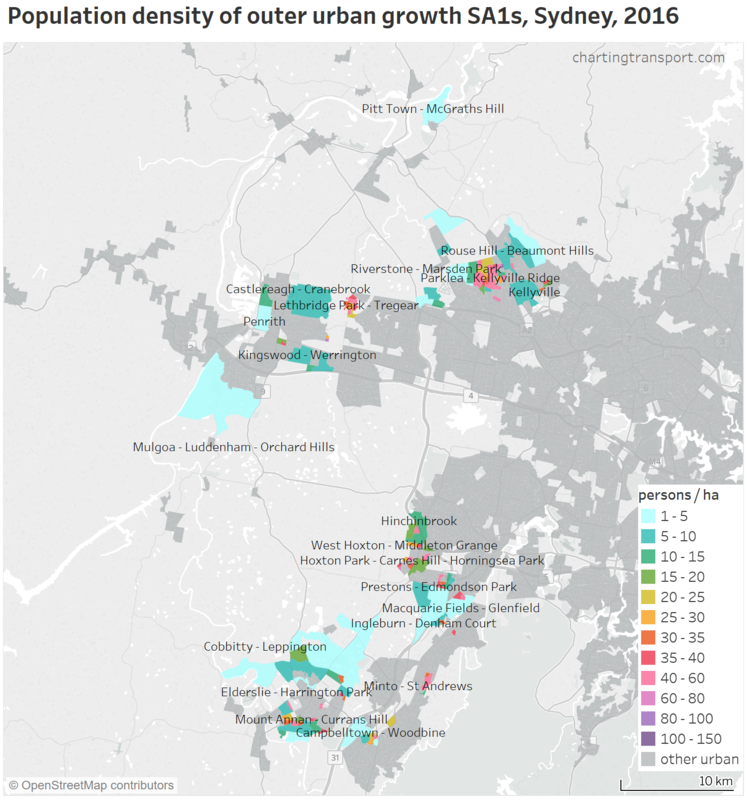 There was a net reduction in private transport journeys to many SA2s, including North Sydney, Homebush, Epping – North Epping, and Mascot – Eastlakes (note: some others might be artifacts of boundary changes between 2011 and 2016). Private transport again dominated new journeys to the outer west and northern beaches. 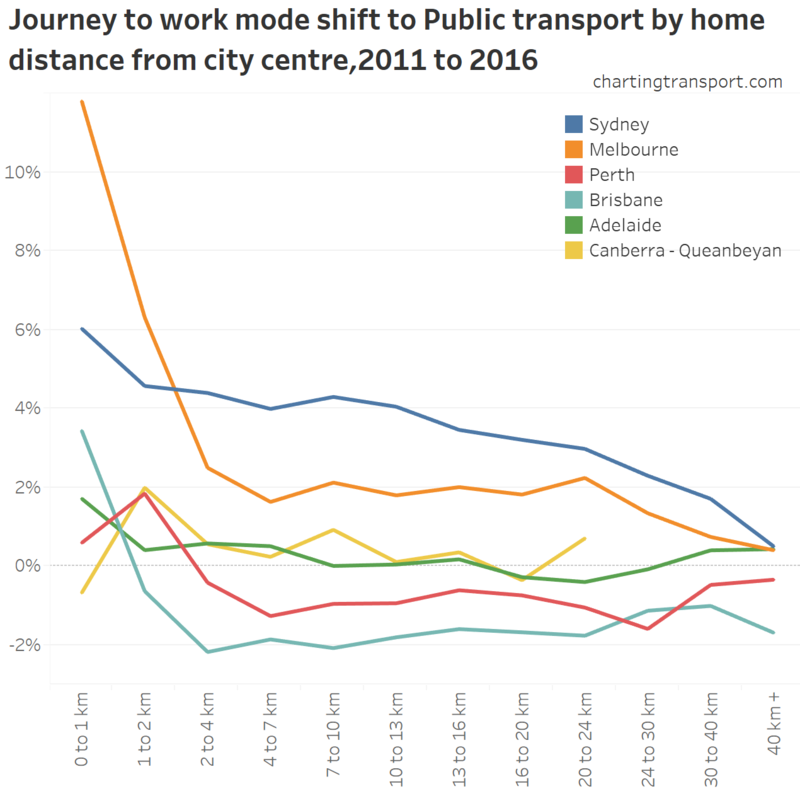 You can see on the following chart that the central city accounted for a significant portion of the jobs growth and public transport accounted for almost all of those new trips, which helps explain the overall shift to public transport. 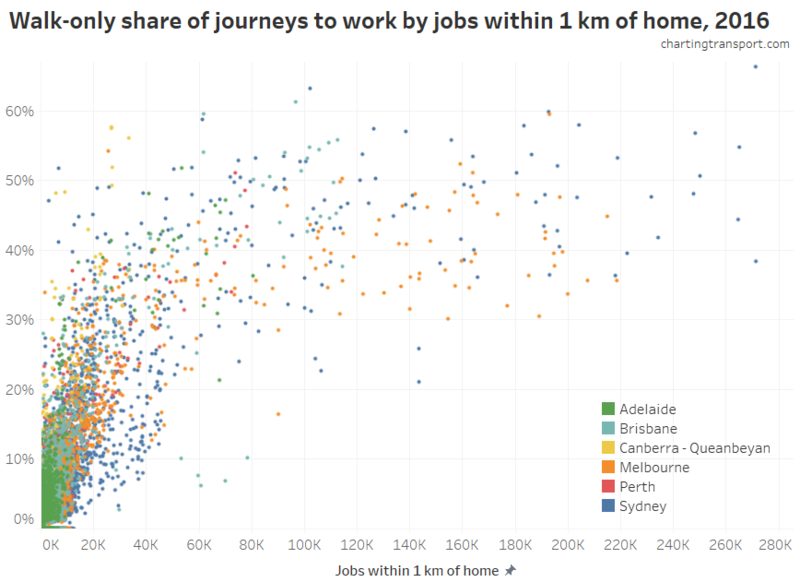 Private transport only significantly dominated new jobs more than 10 km from the city centre. 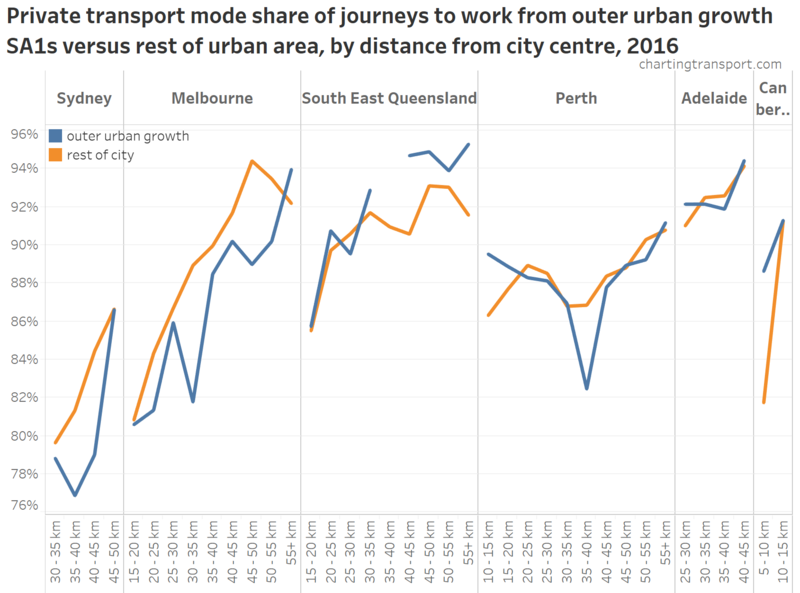 For more on the journey to work, you might like another post about likely factors explaining city-wide mode shifts across Australia’s larger cities. The mode share maps are filtered for residential areas (CD or SA1) with at least 5 persons/hectare or destination zones (DZs) with at least 4 jobs/hectare (as appropriate). 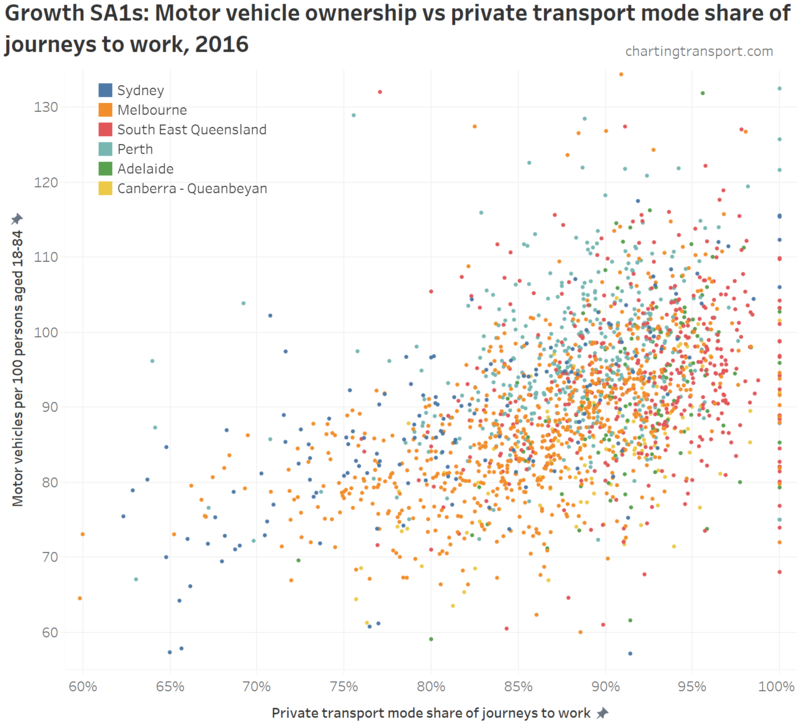 Mode shifts, mode splits, and mode shares of net new commutes are calculated and shown on 2016 SA2 boundaries, with 2006 and 2011 CDs, SA1s and DZs mapped to 2016 SA2 boundaries on a majority overlap basis (mostly a perfect alignment, but sometimes not). I’ve only counted people who travelled on census day and stated what mode(s) they used, and – for work destinations – where the work SA2 is known. See my Brisbane post for a longer explanation. You are currently browsing the archives for the Sydney category.